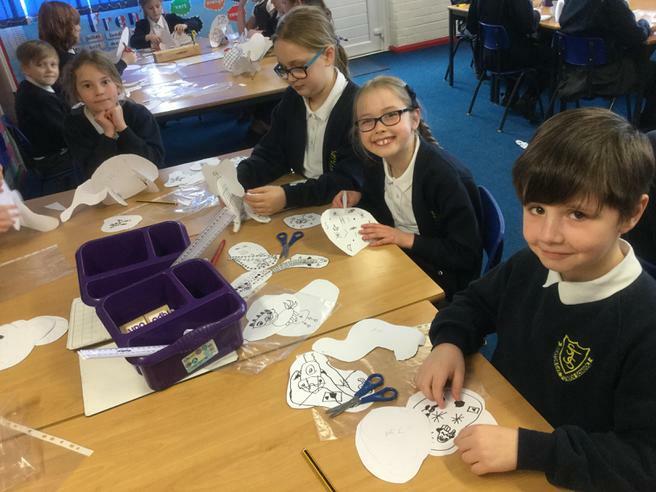 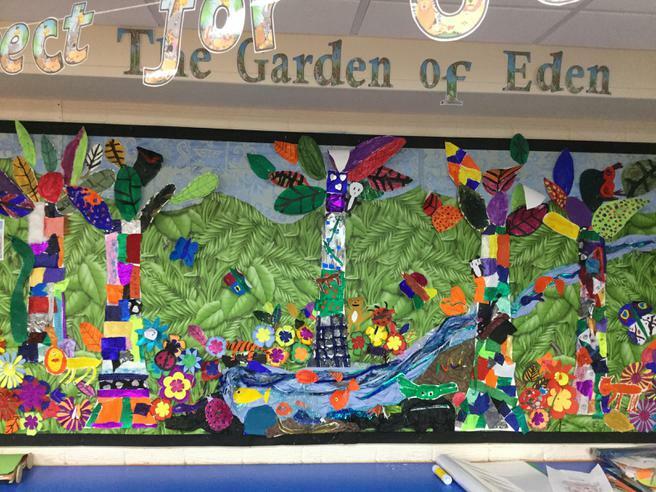 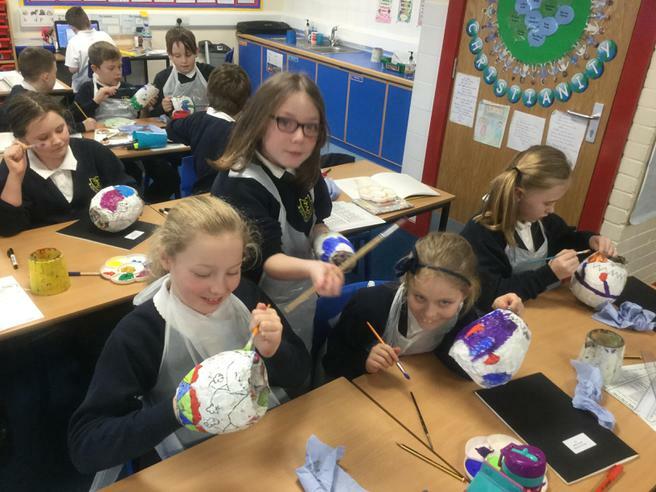 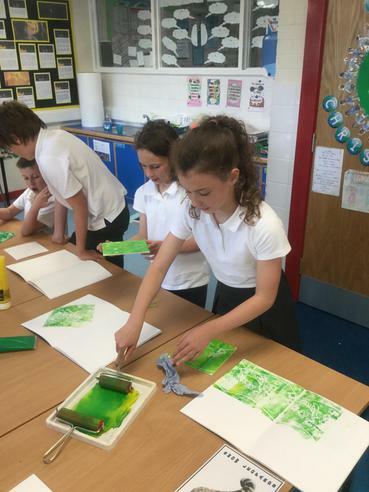 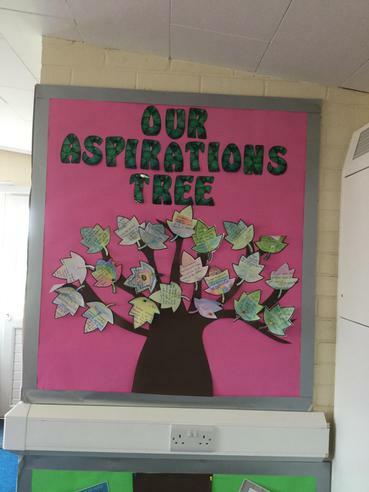 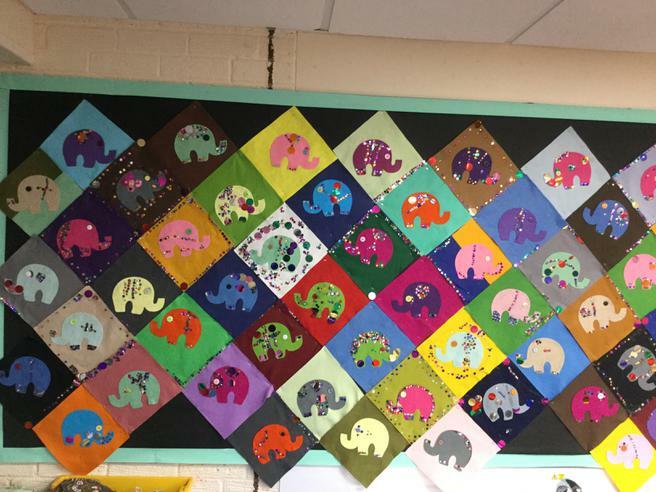 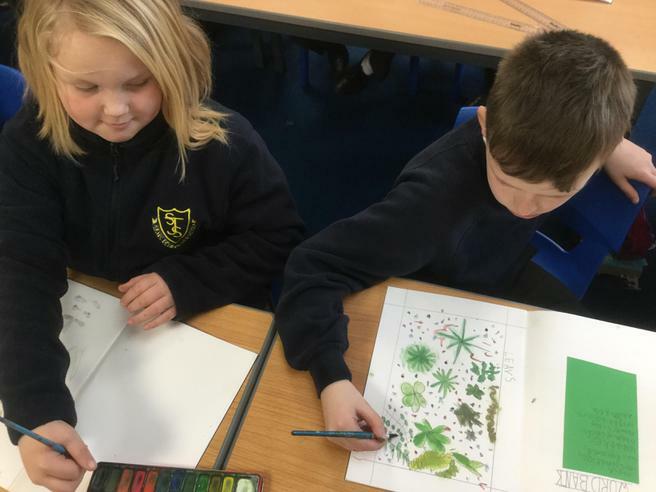 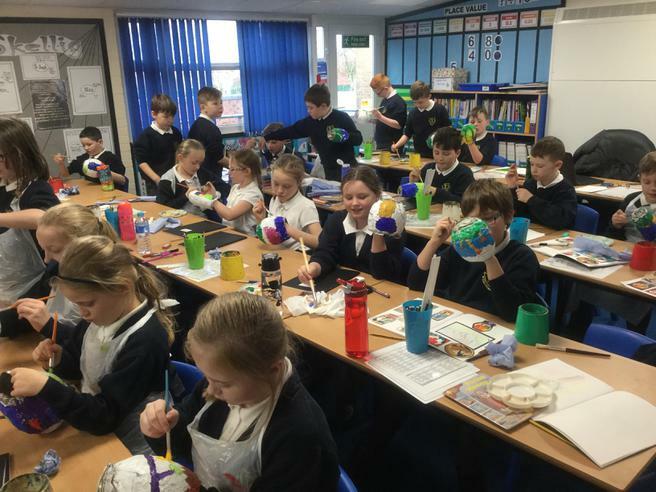 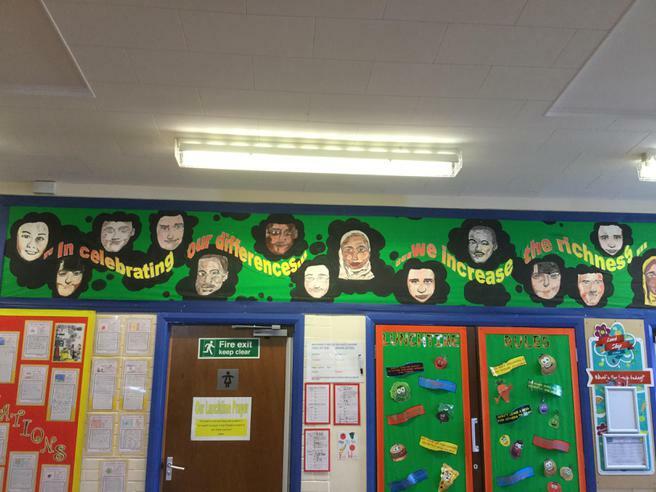 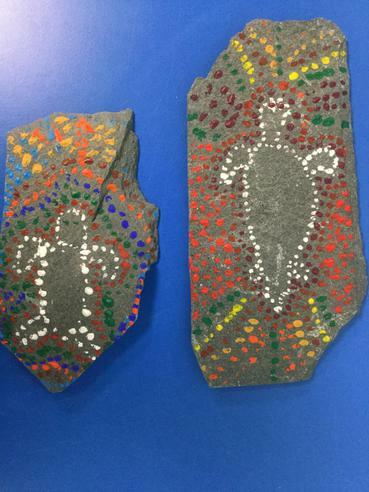 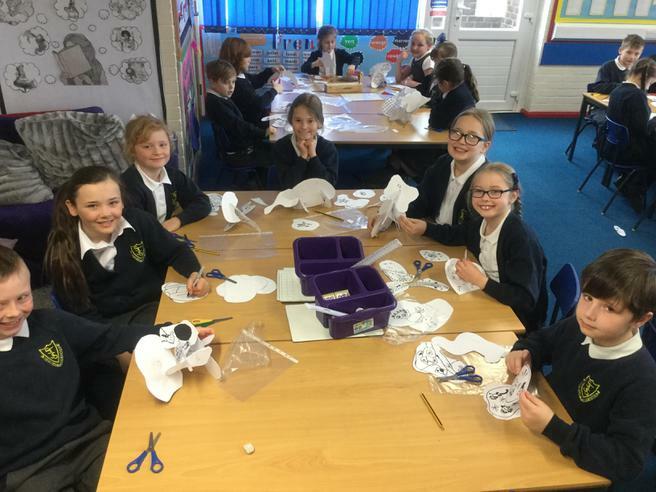 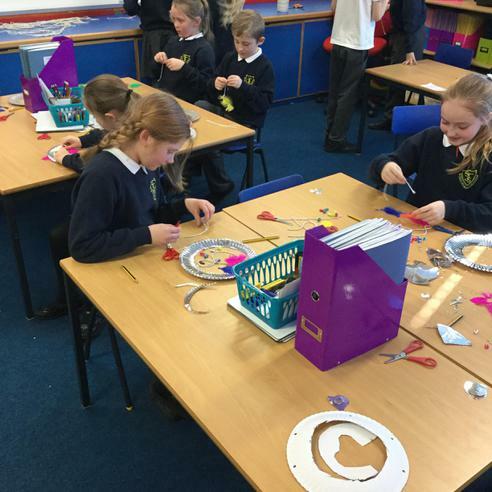 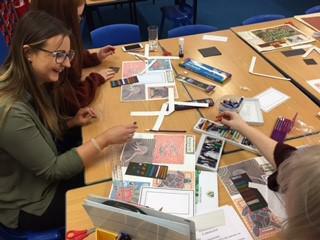 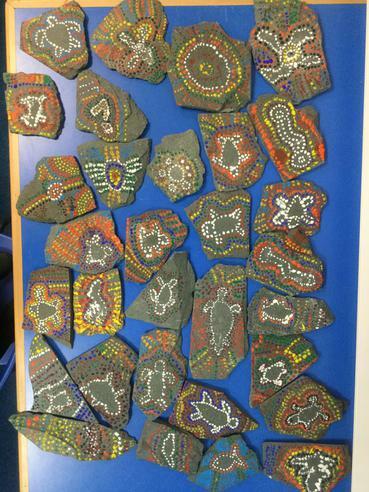 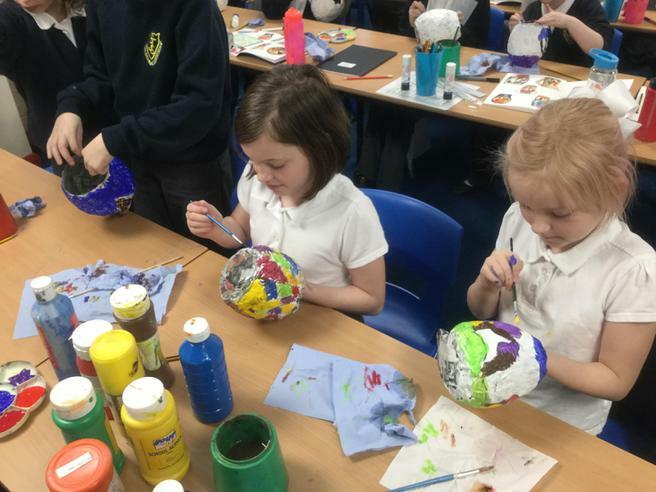 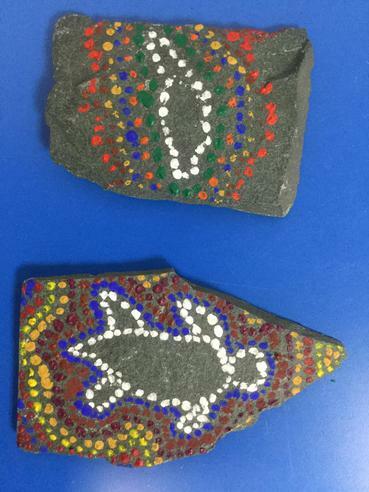 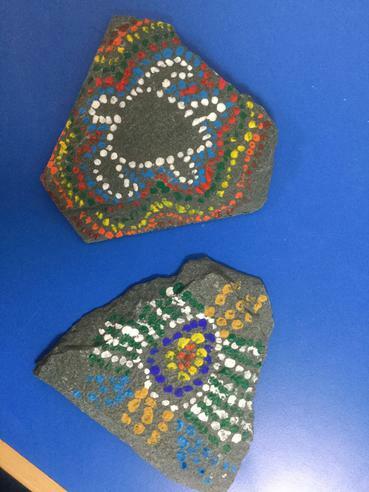 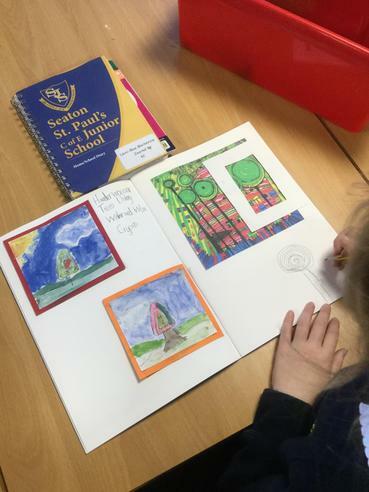 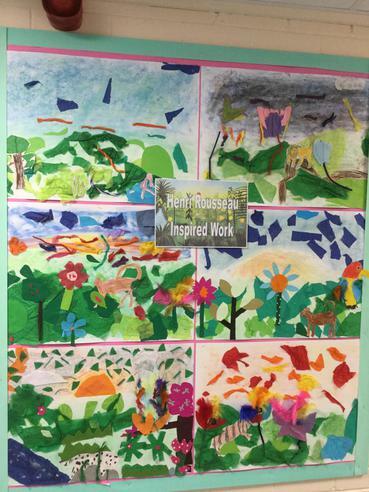 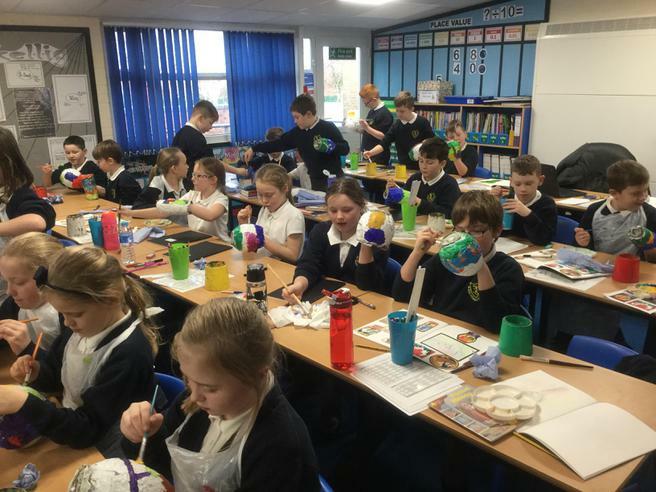 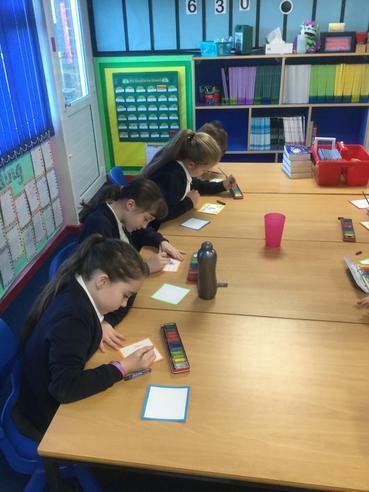 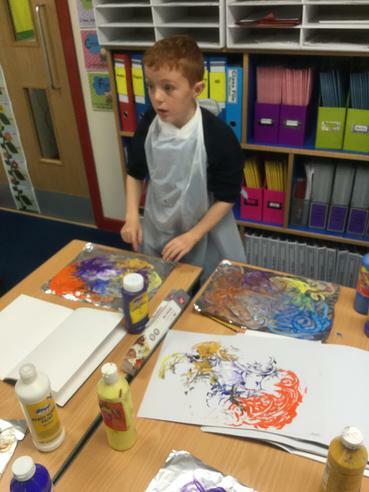 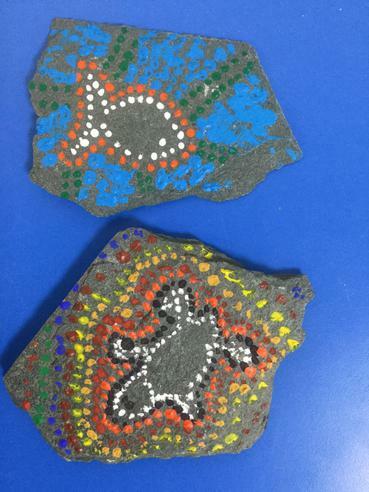 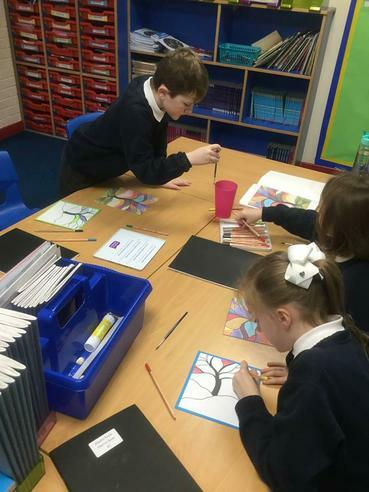 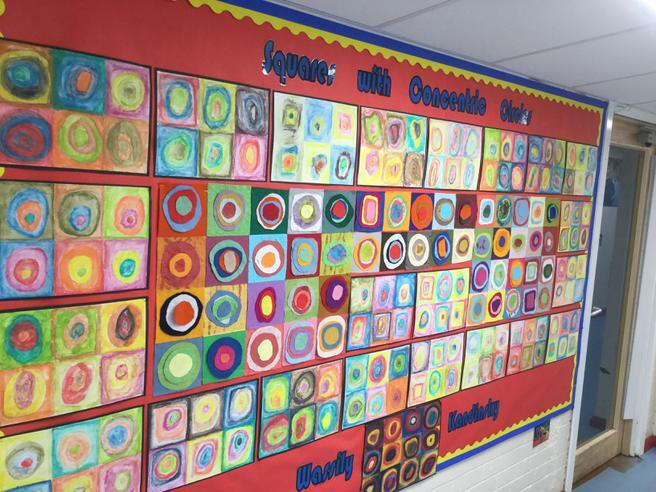 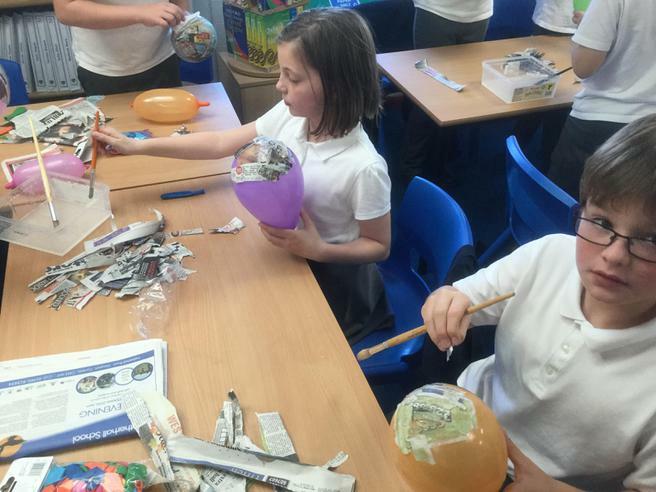 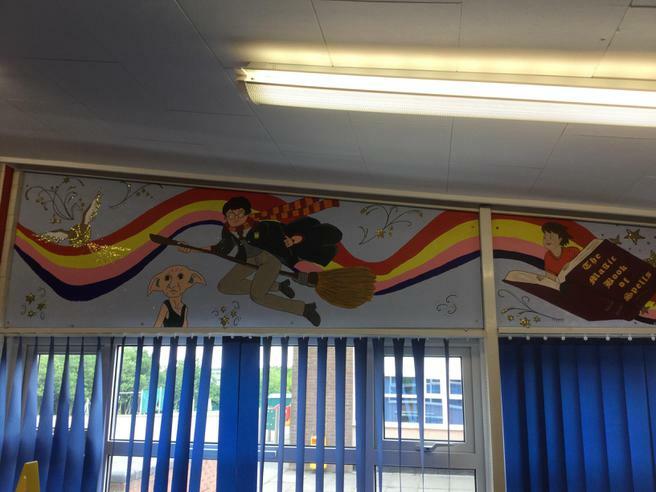 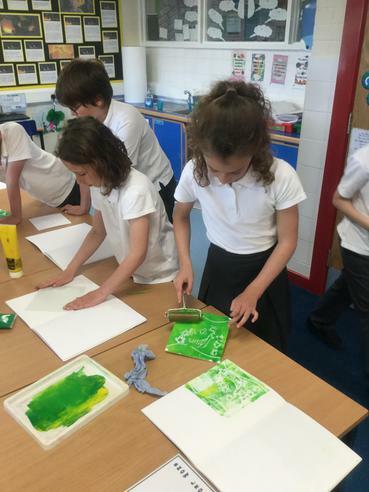 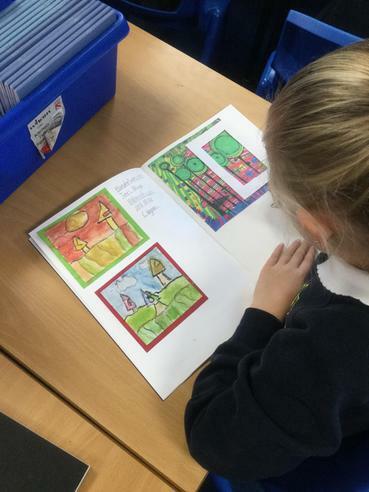 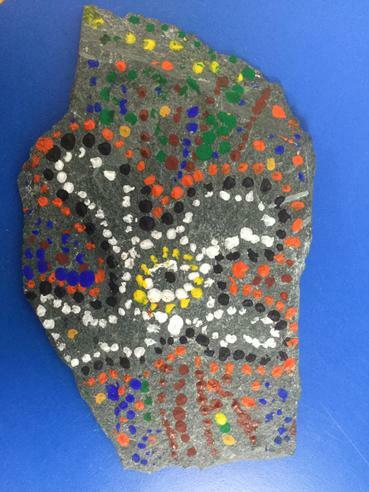 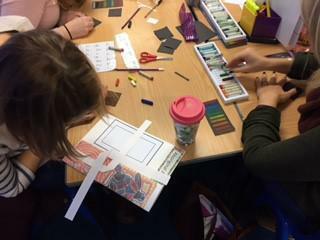 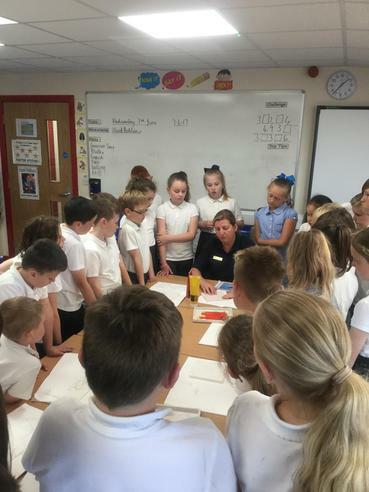 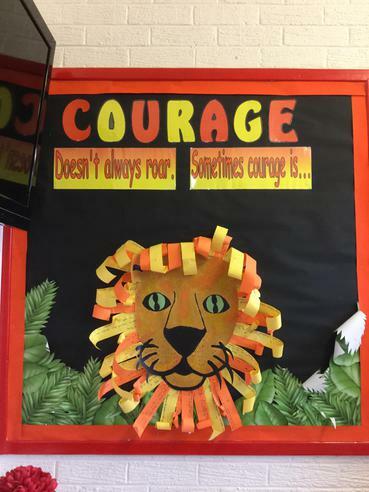 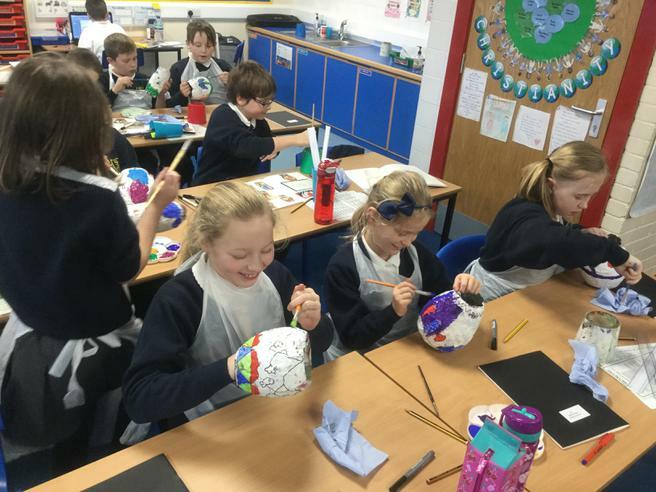 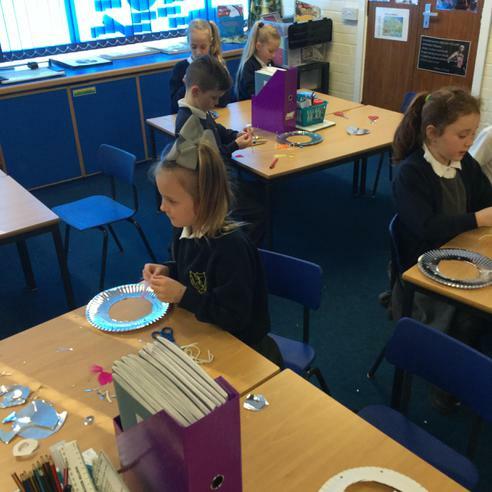 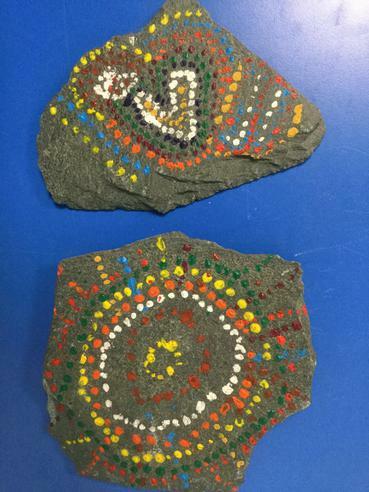 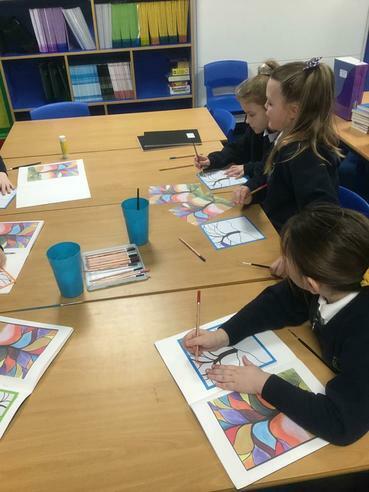 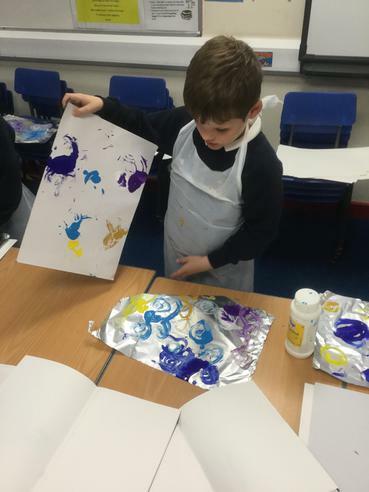 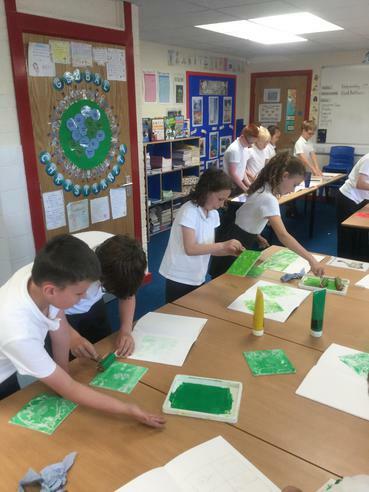 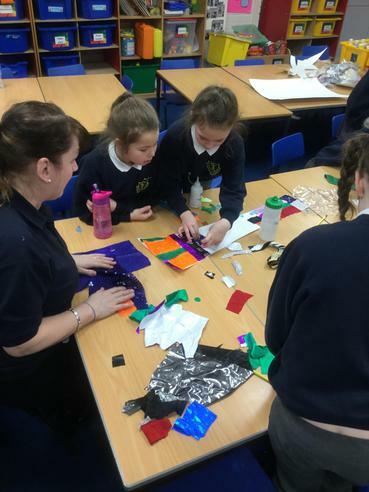 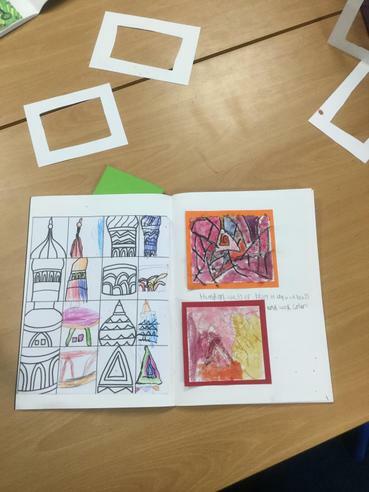 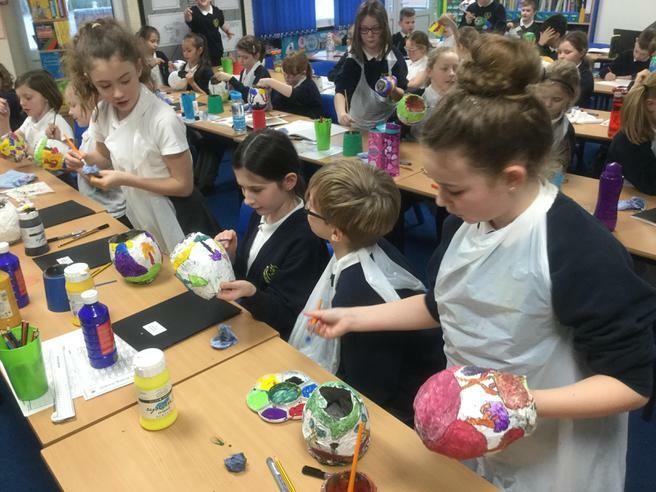 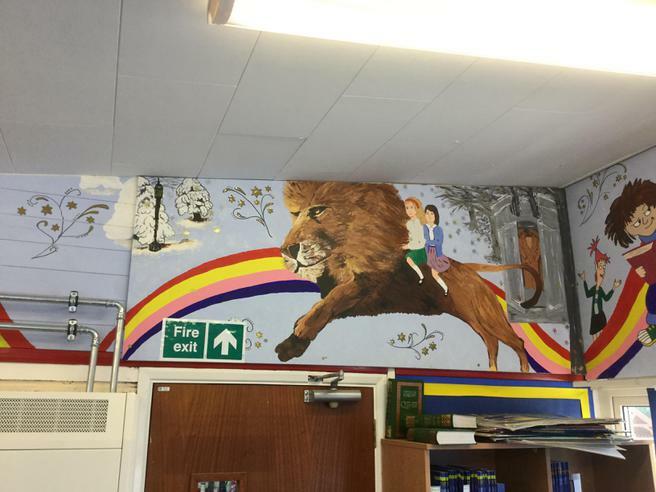 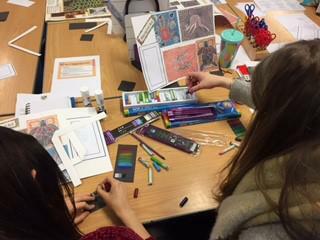 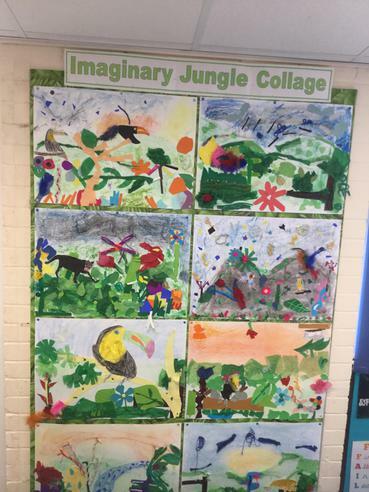 We love The Arts here at Seaton Junior School and we are lucky enough to have some very talented teachers who specialise in these subjects! 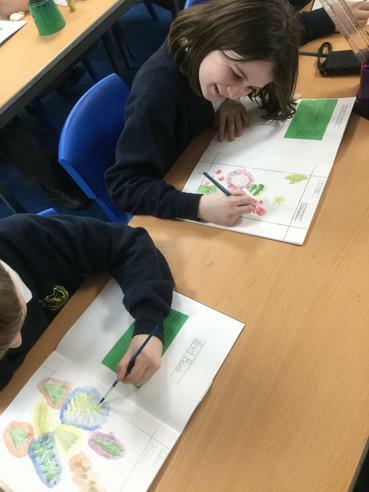 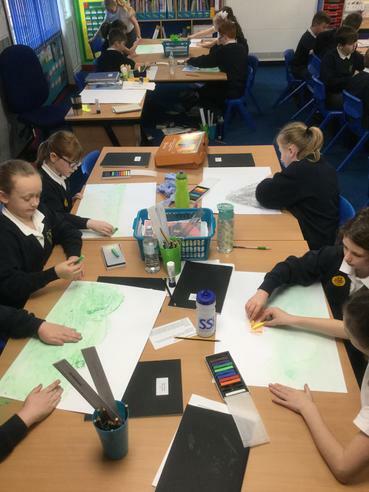 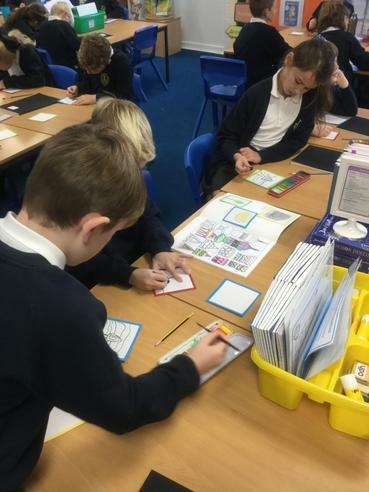 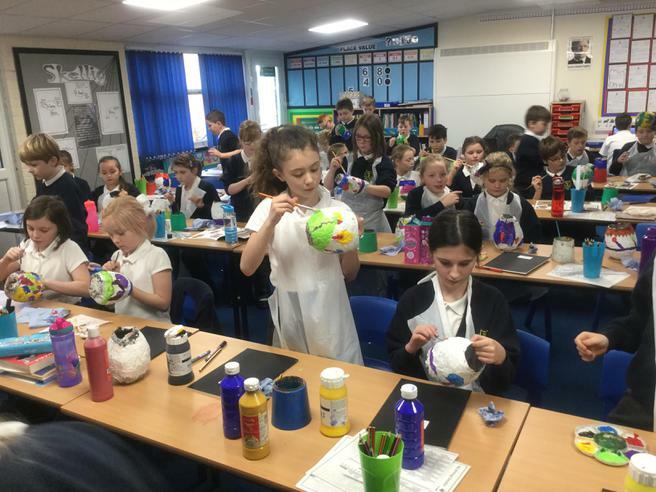 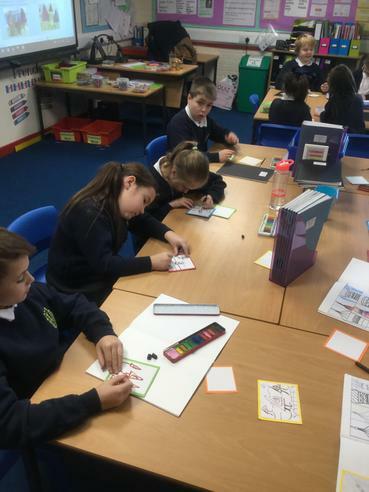 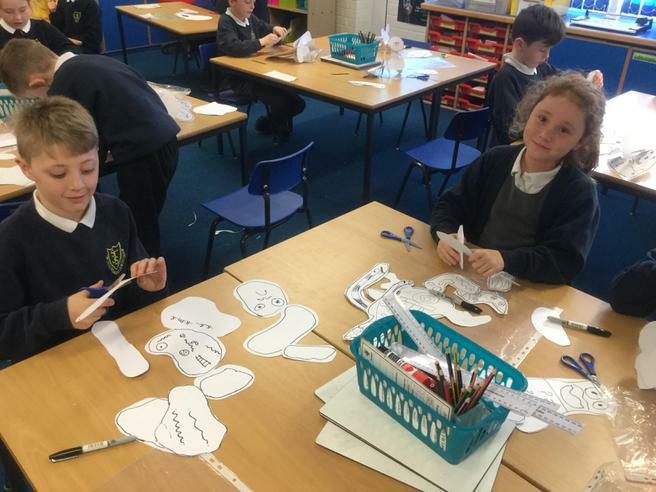 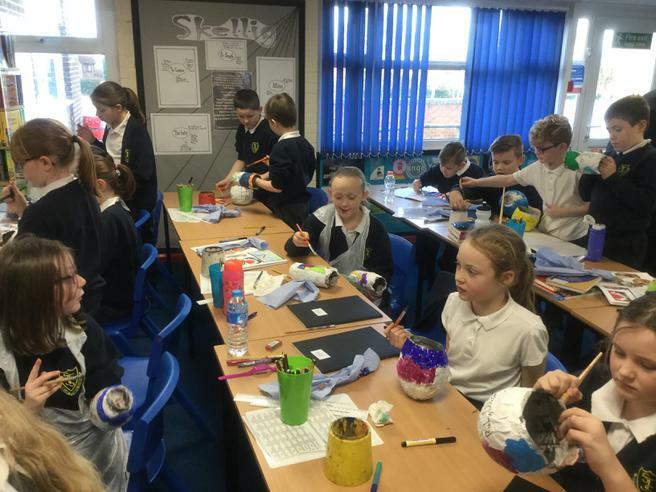 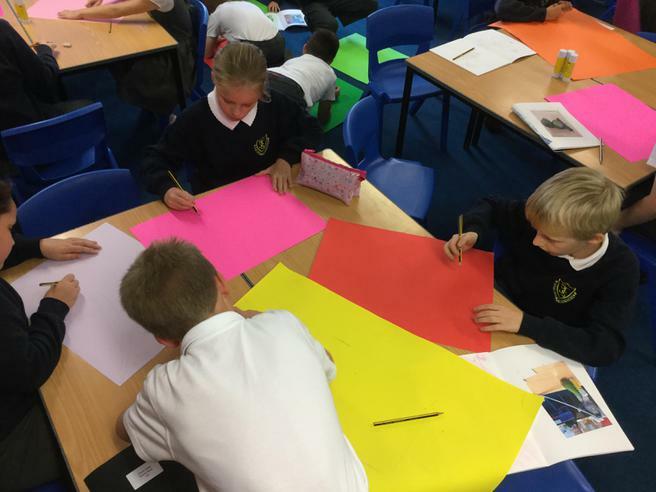 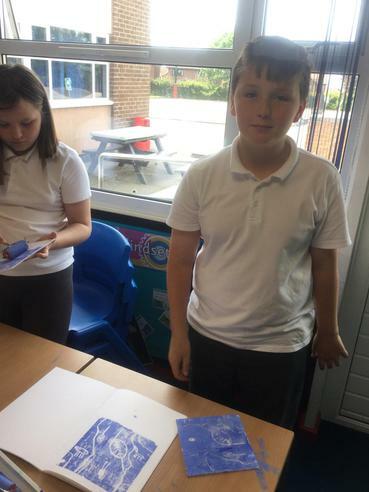 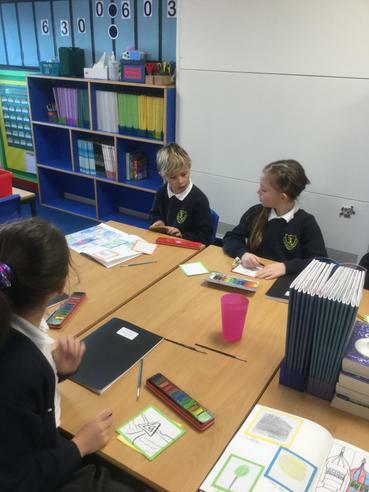 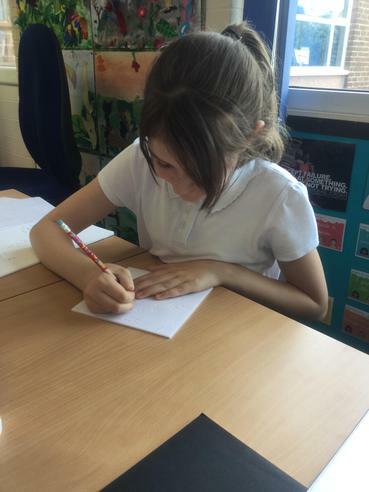 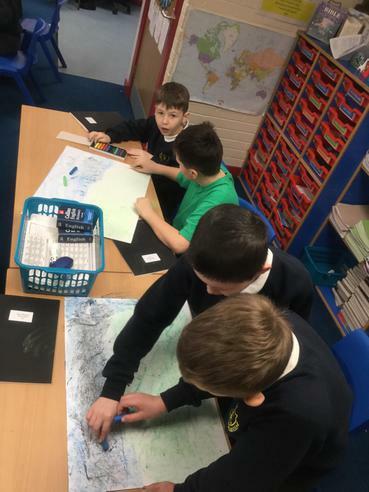 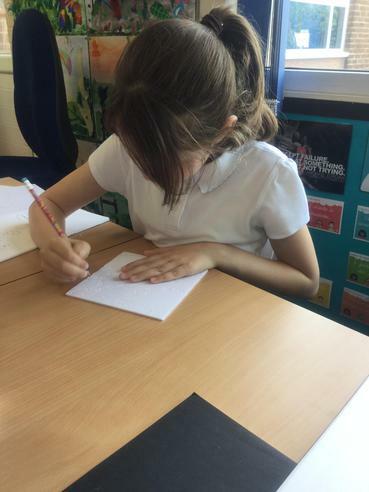 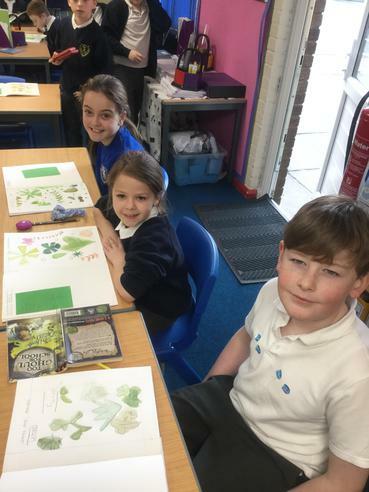 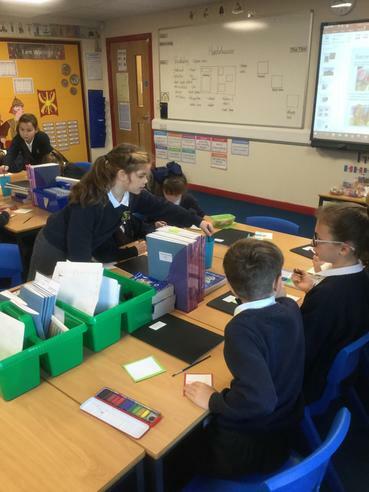 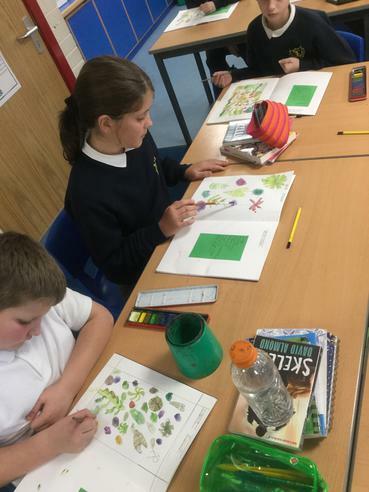 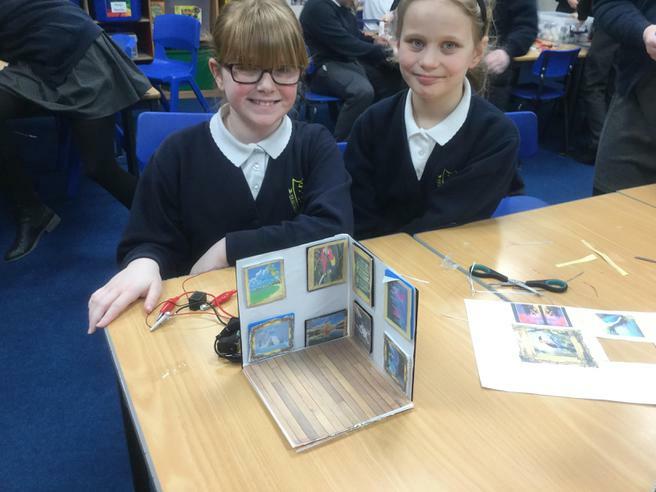 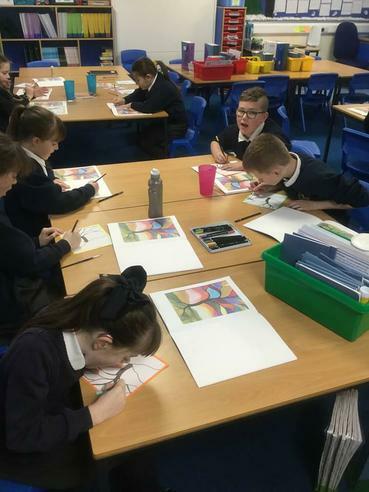 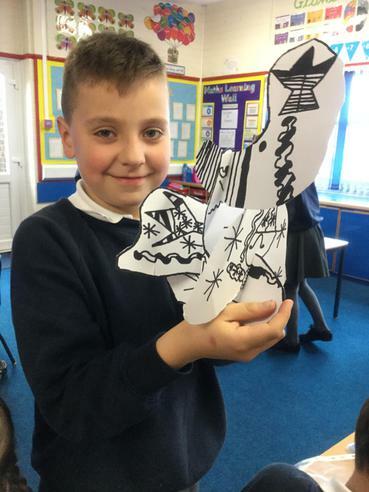 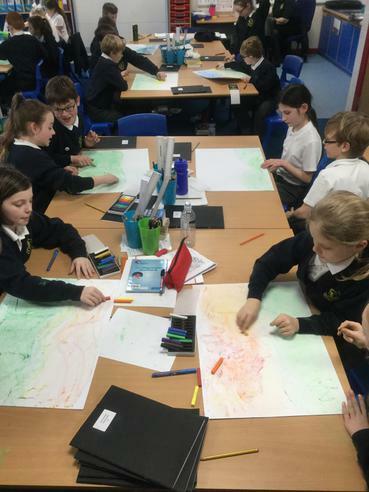 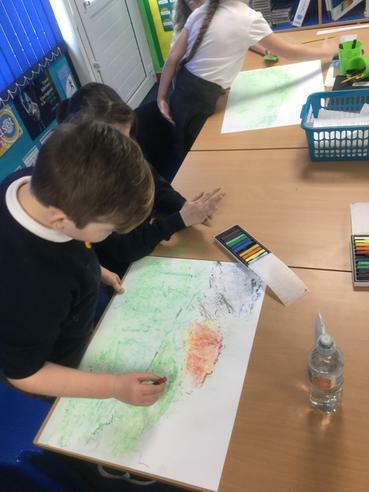 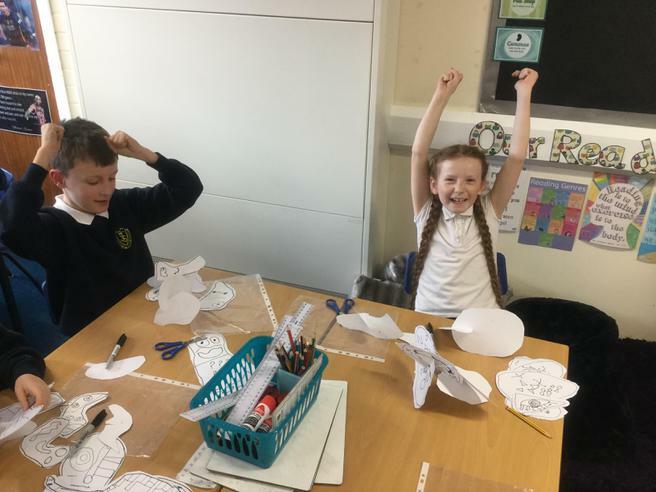 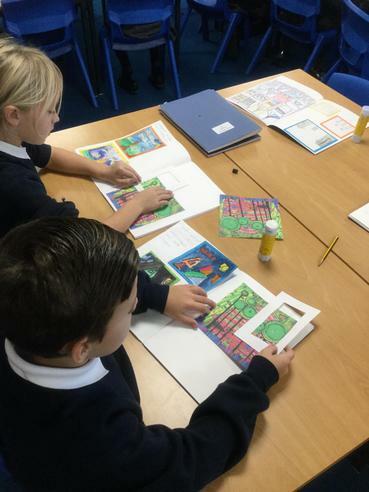 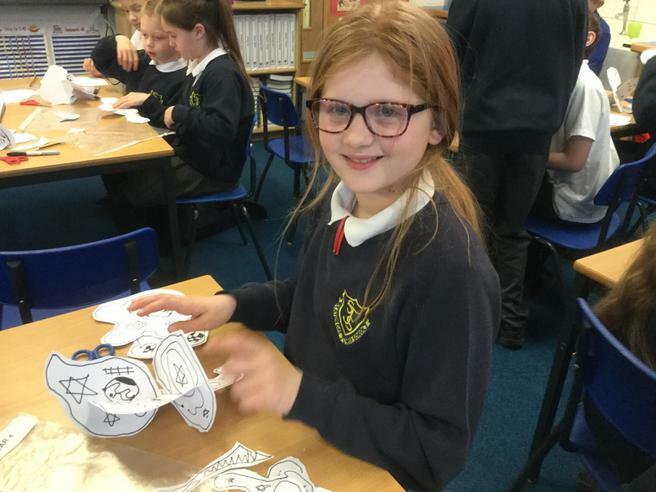 We had a wonderful visit from Chris Wadsworth, a writer and curator, who came to talk to the Year 6 children about the life of Percy Kelly, a local artist from Workington. 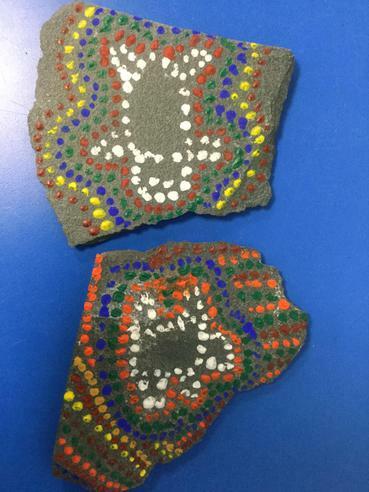 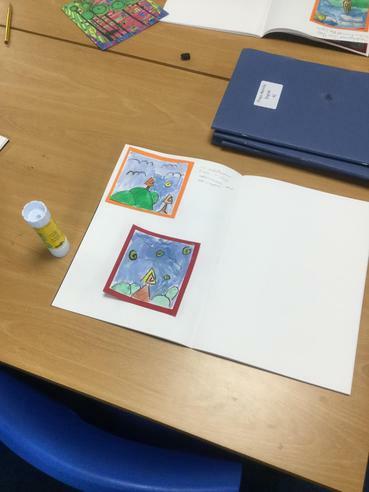 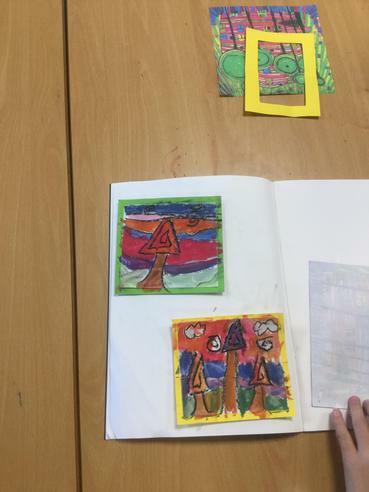 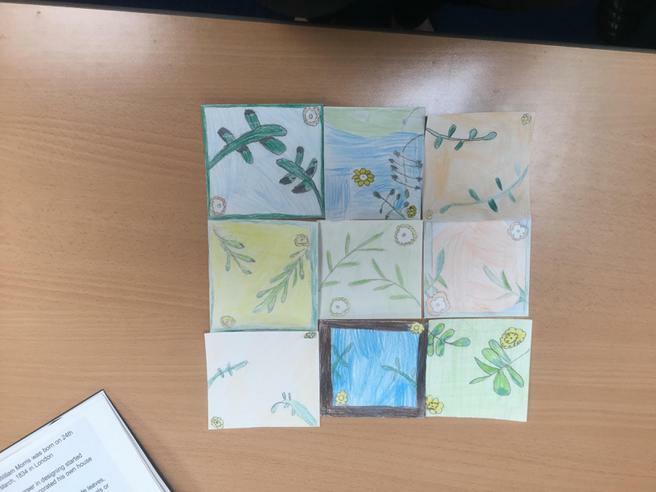 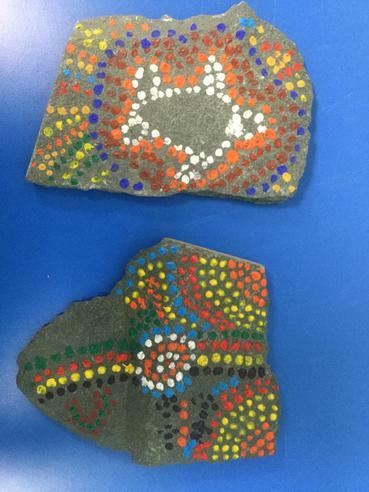 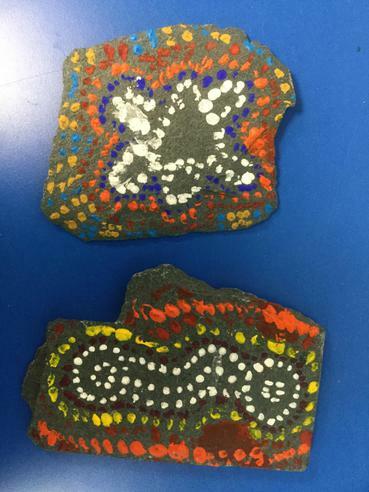 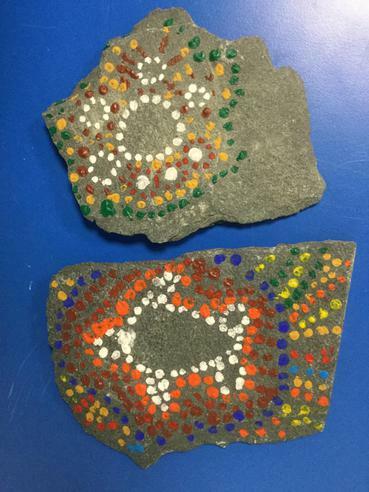 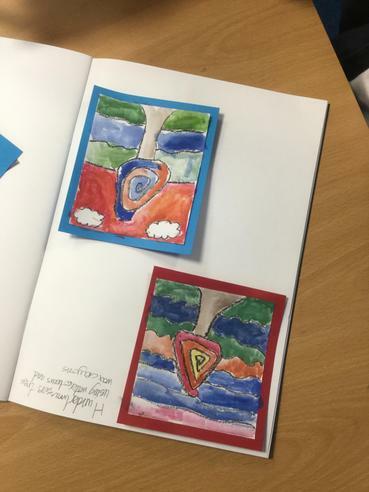 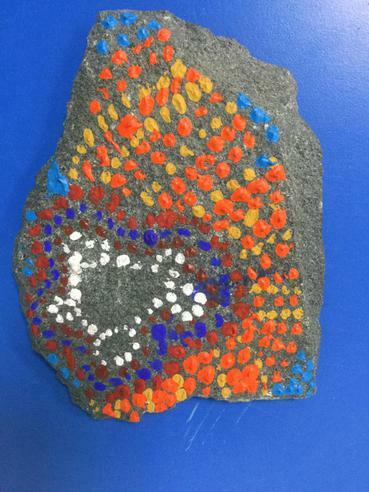 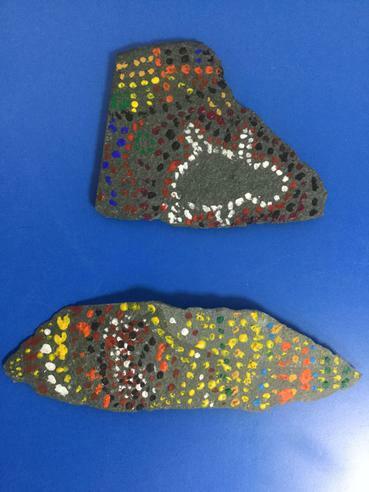 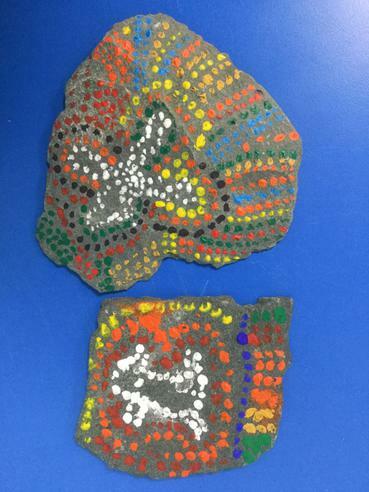 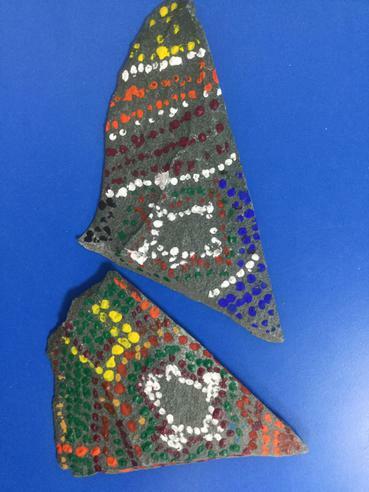 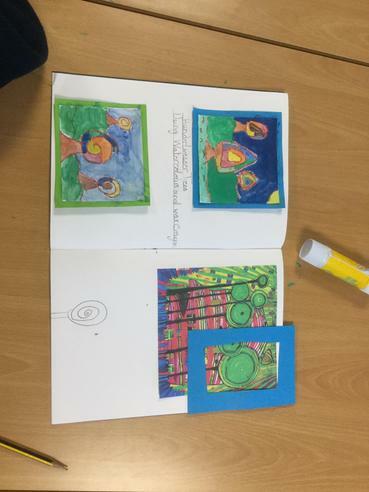 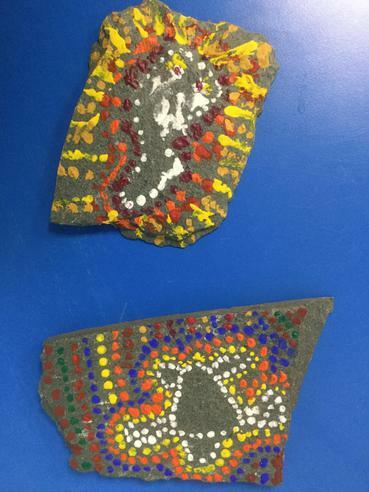 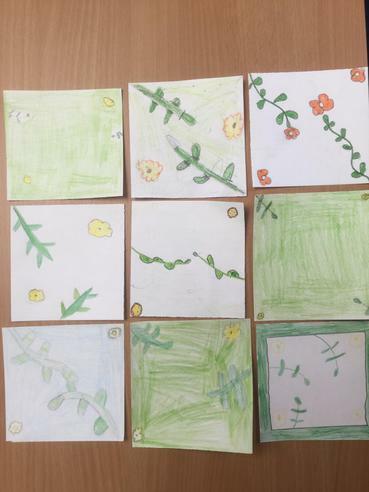 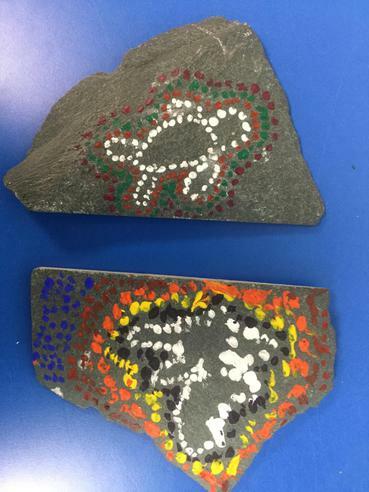 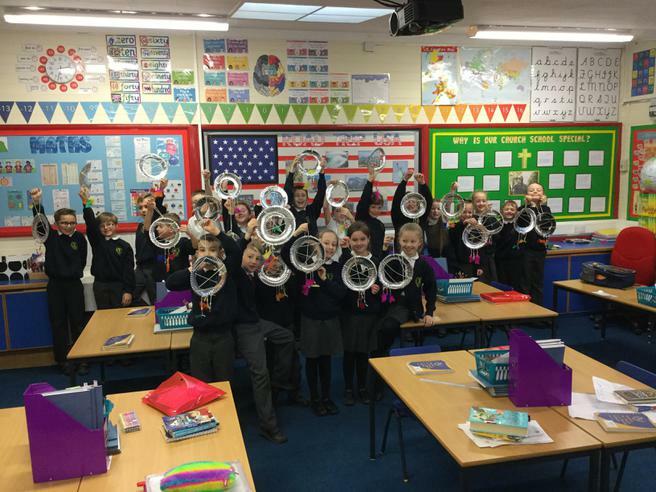 After a presentation, the children split off into two groups and one group produced work on plates based on one of Percy Kelly's plate designs and the other group produced a watercolour painting and letter based on Percy Kelly's numerous letters/paintings he use to send to friends and family. 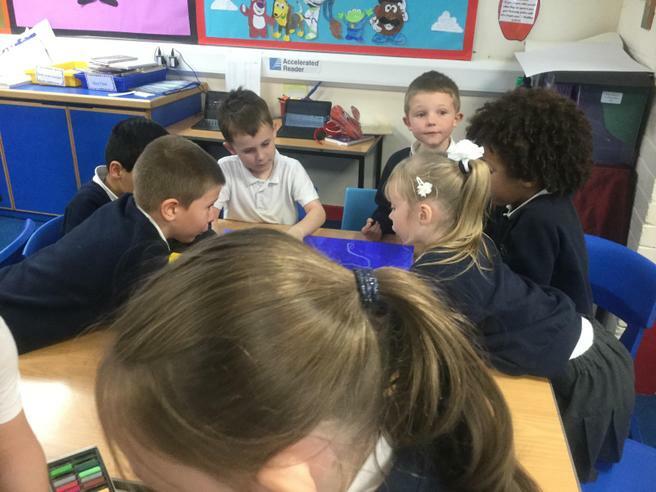 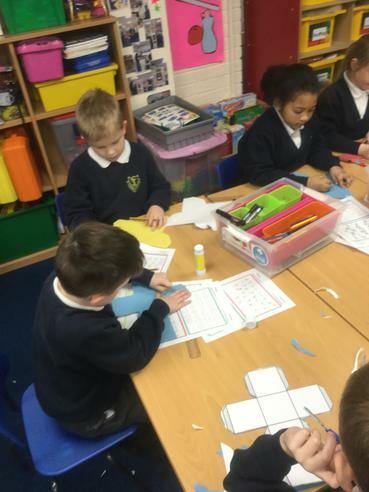 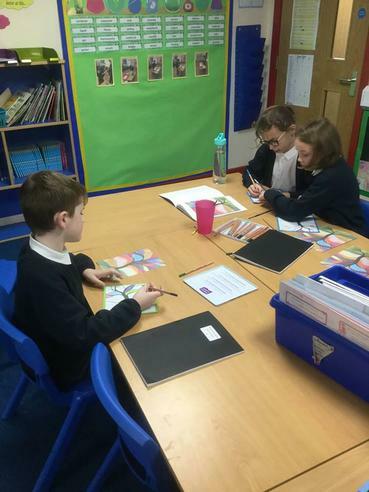 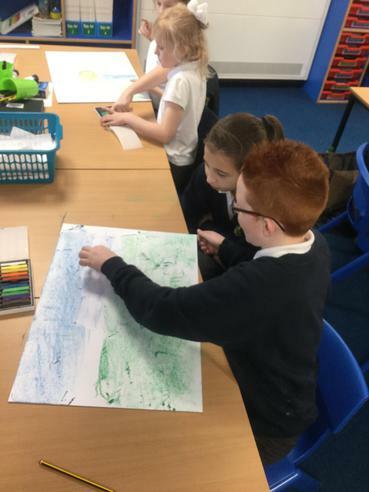 The children talking and working with Chris Wadsworth. 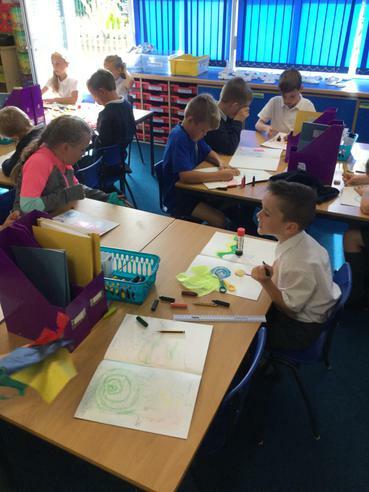 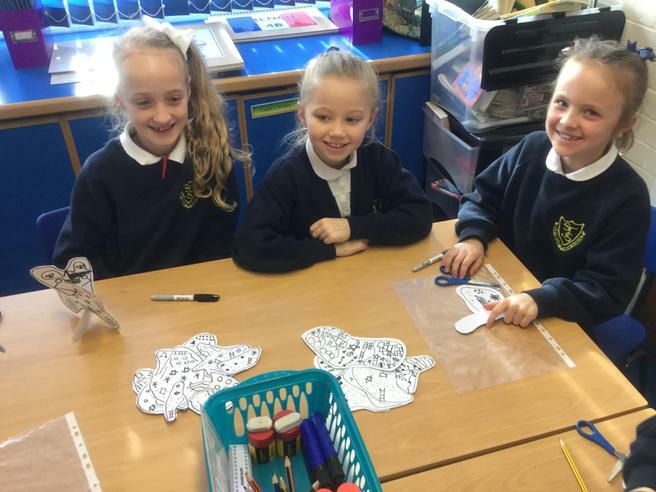 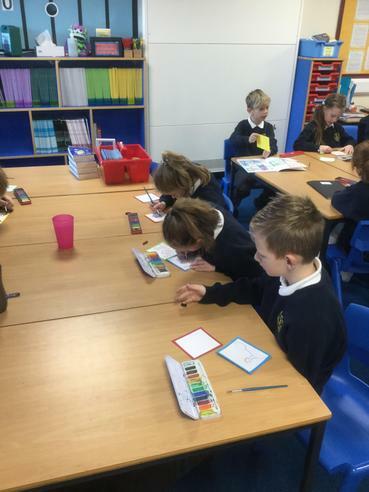 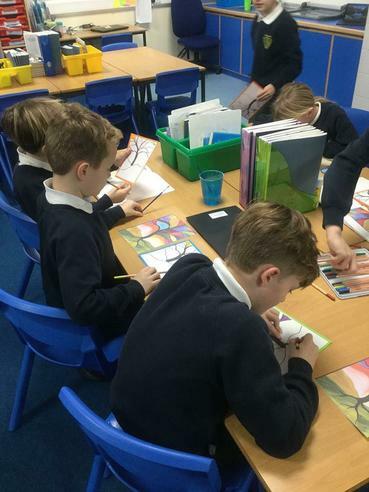 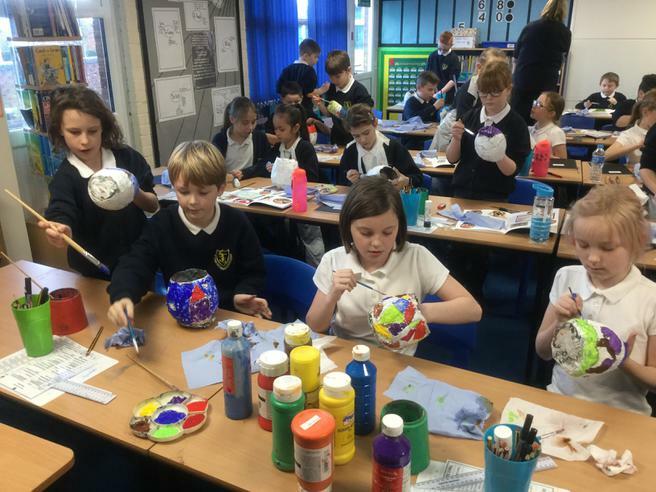 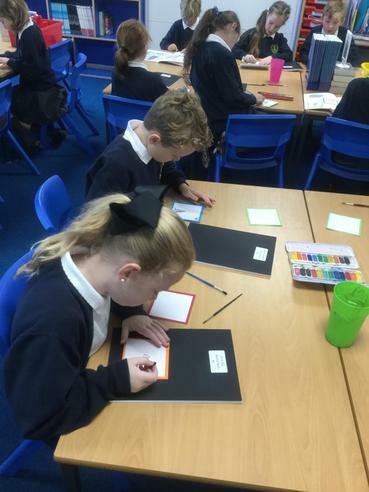 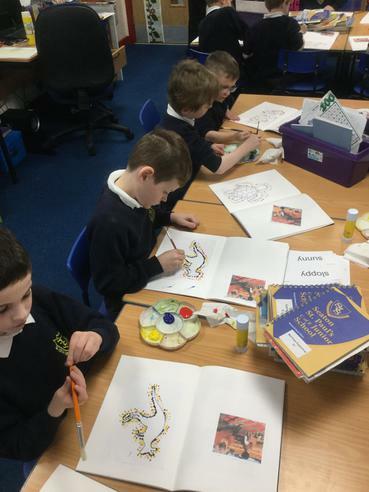 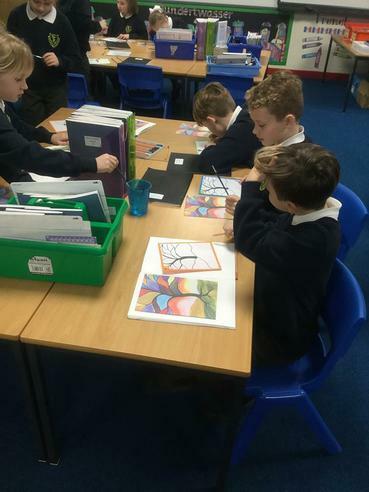 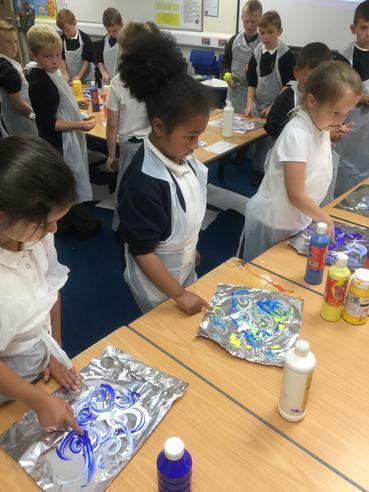 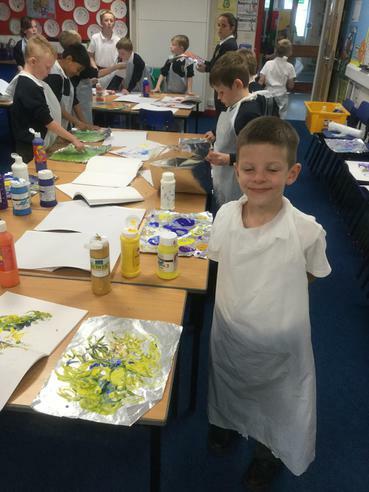 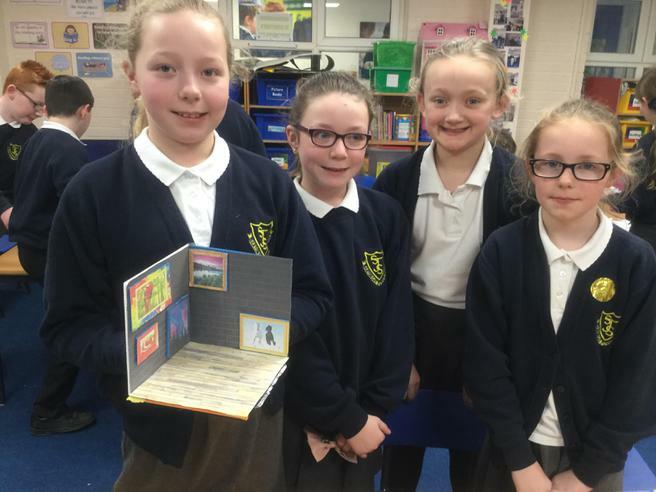 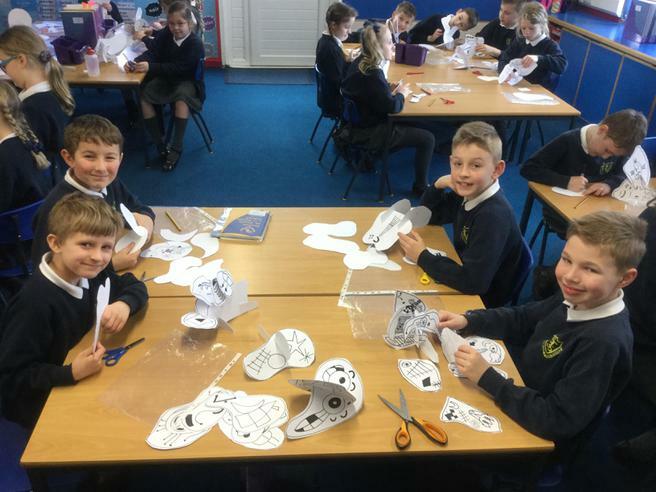 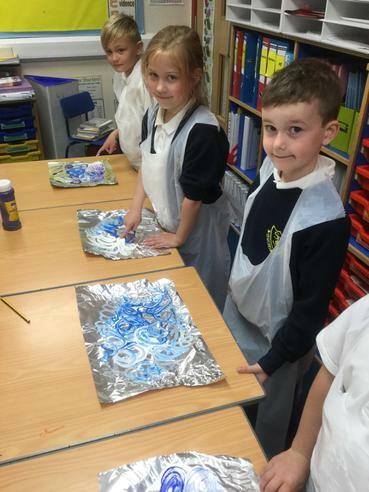 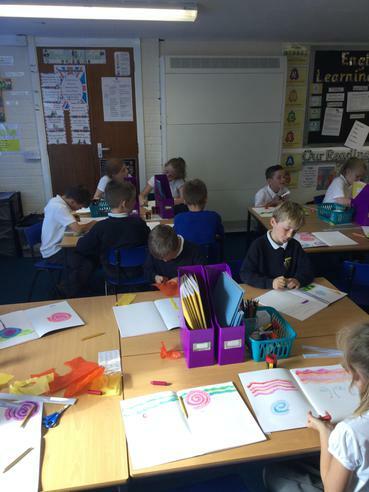 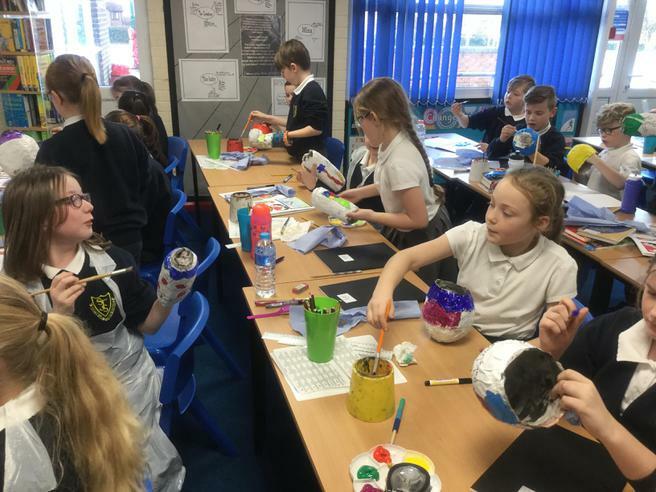 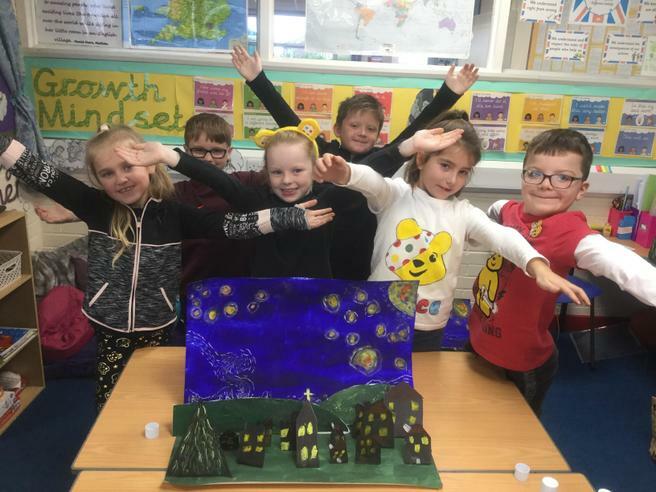 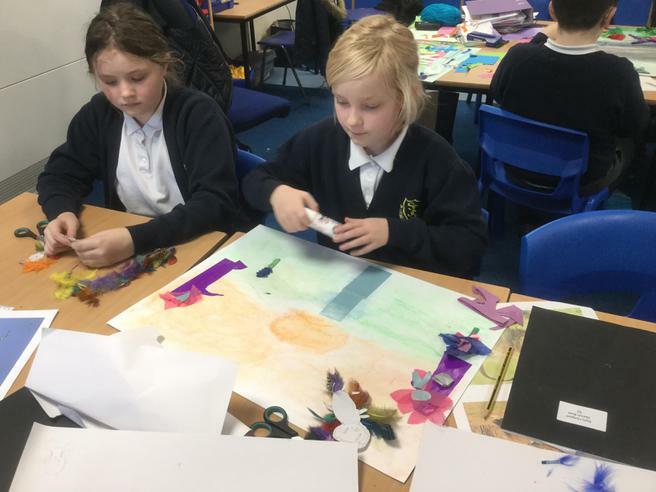 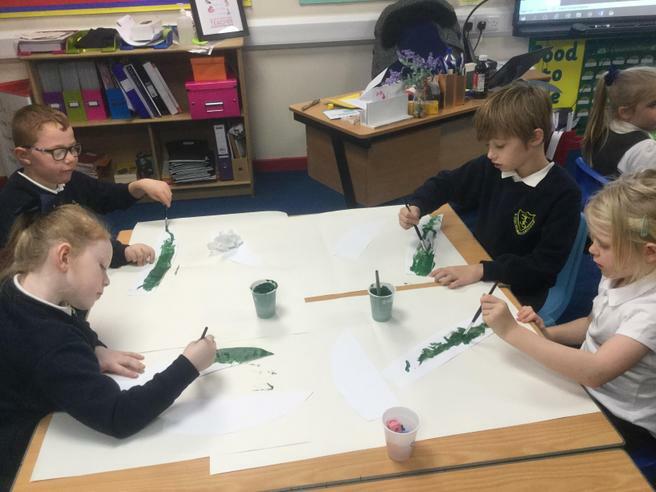 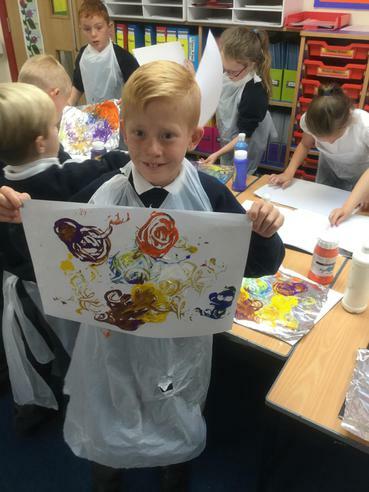 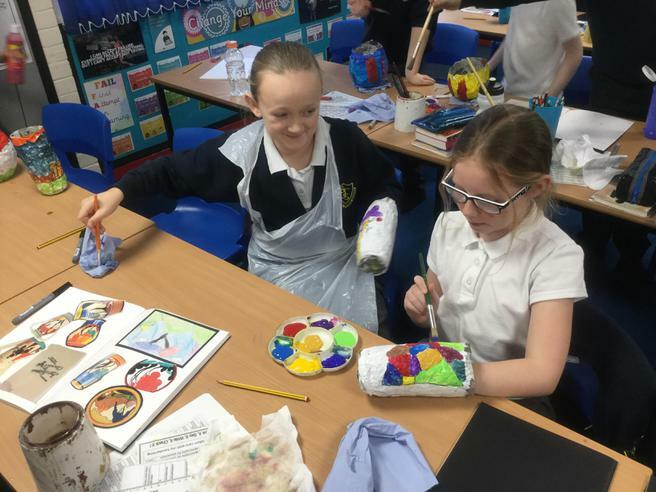 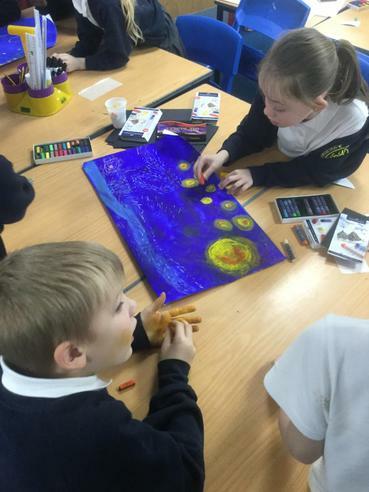 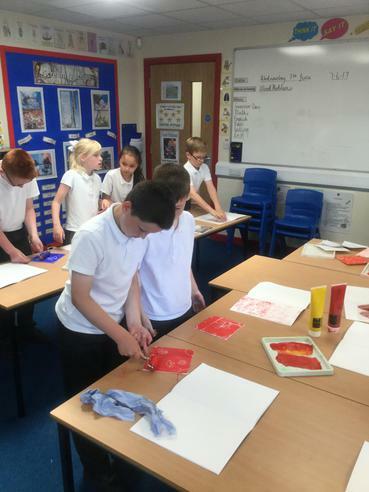 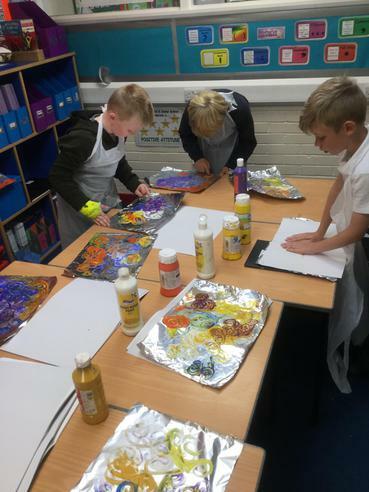 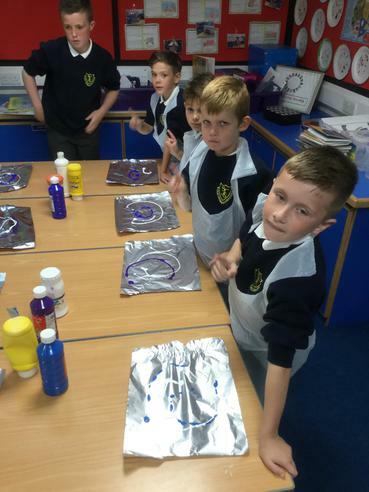 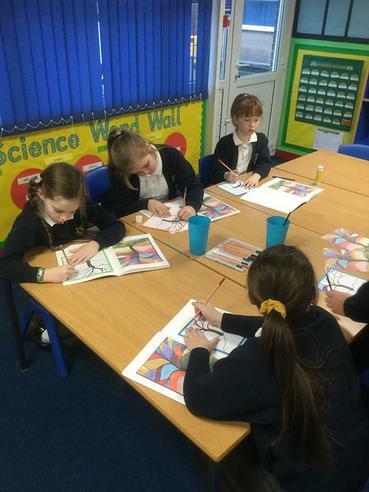 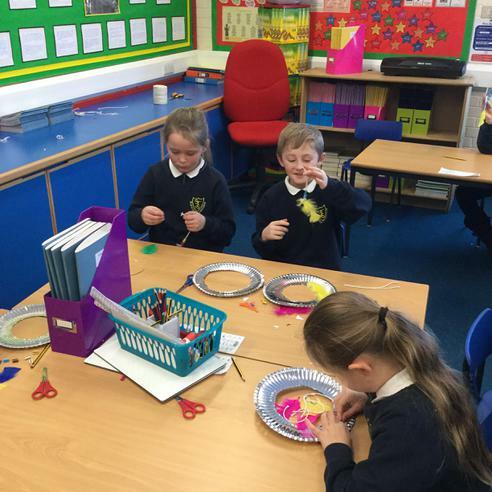 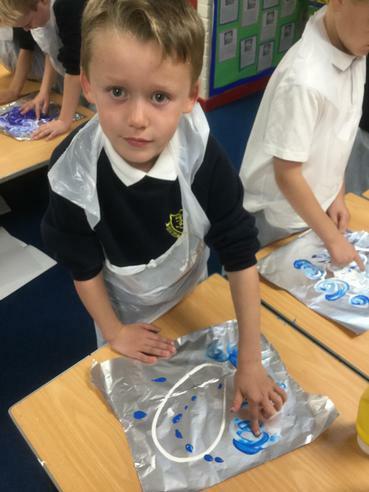 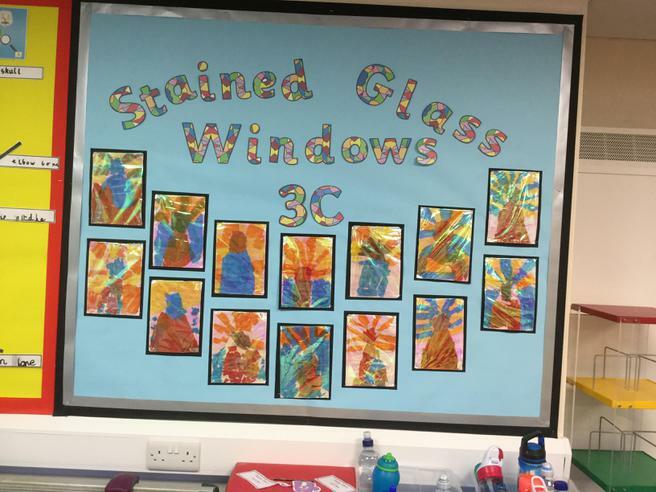 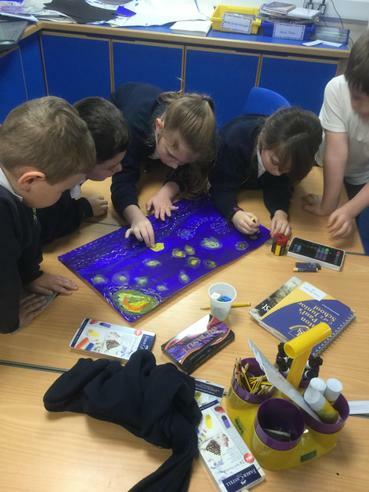 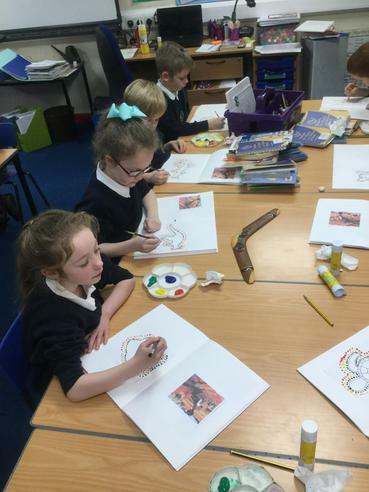 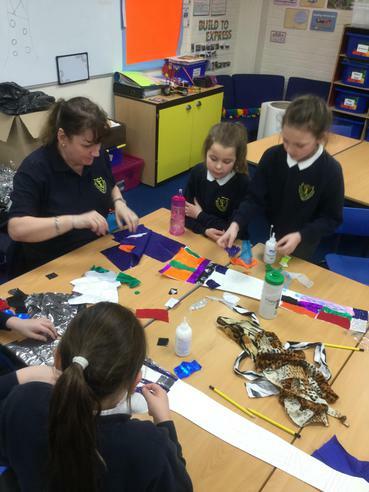 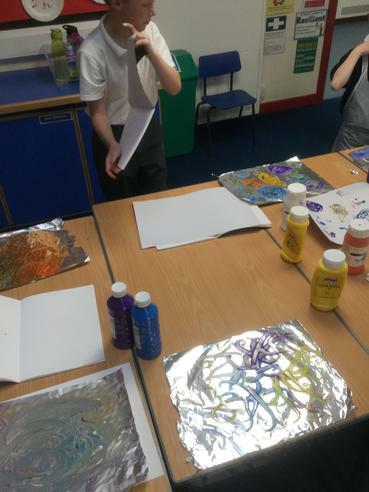 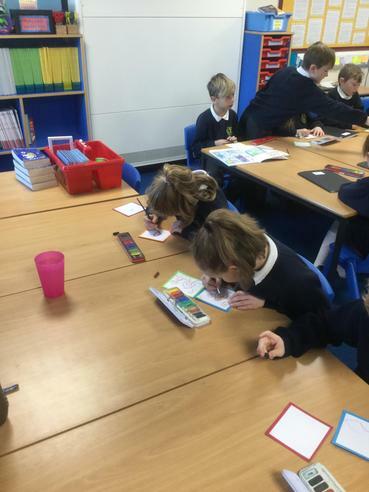 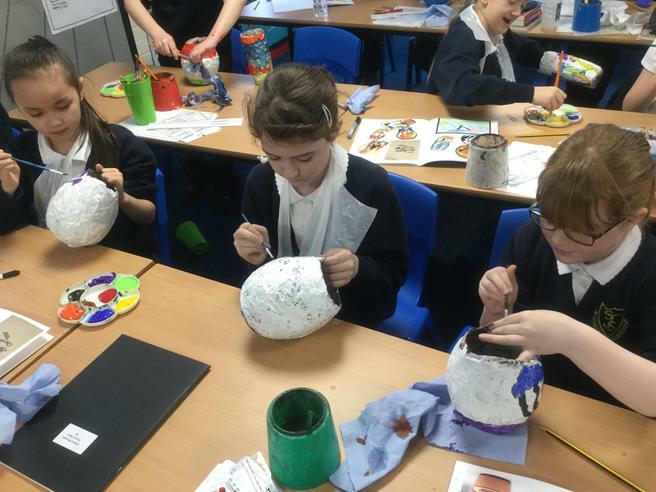 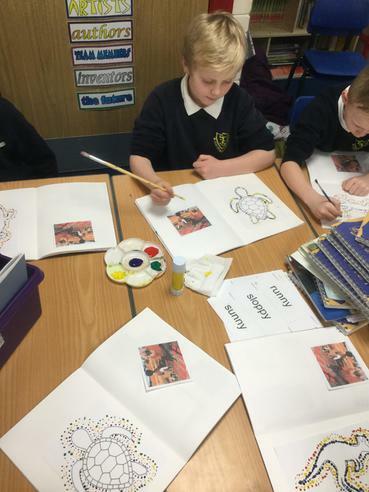 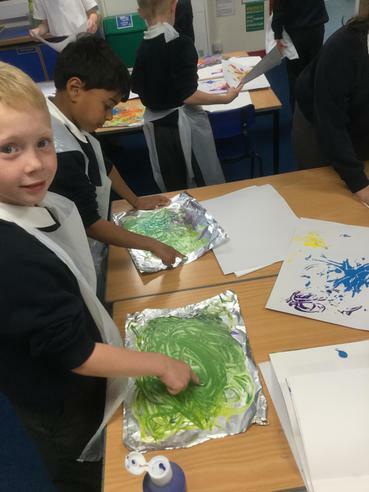 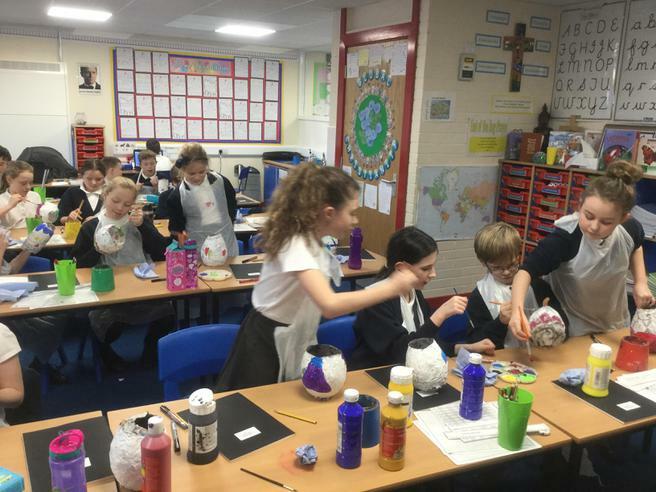 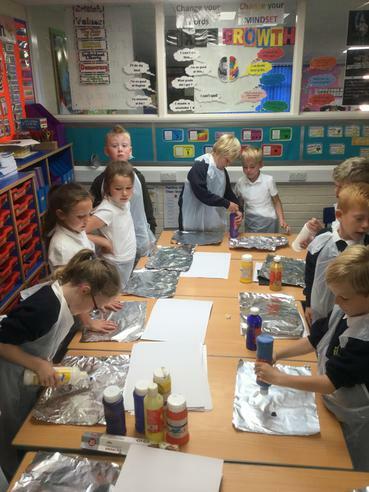 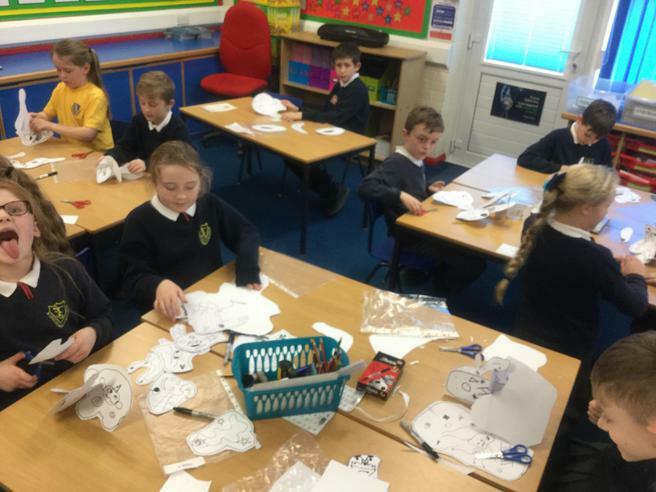 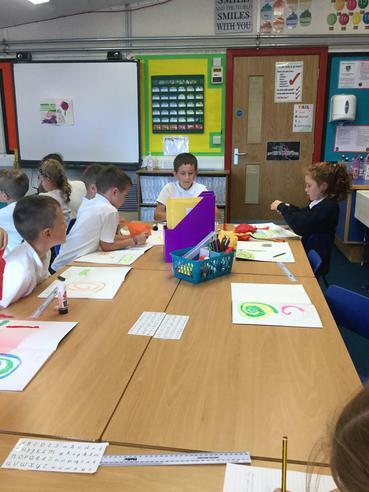 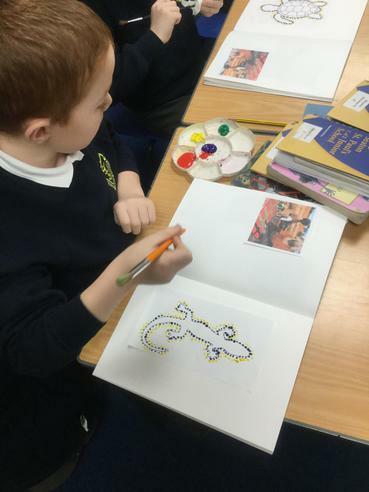 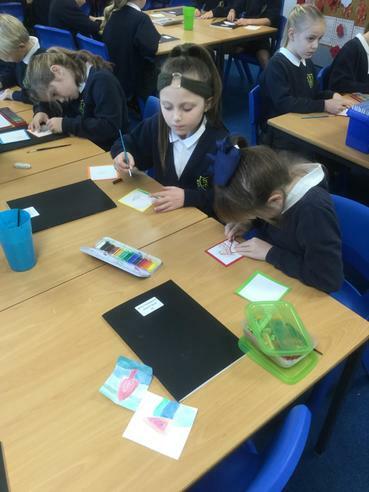 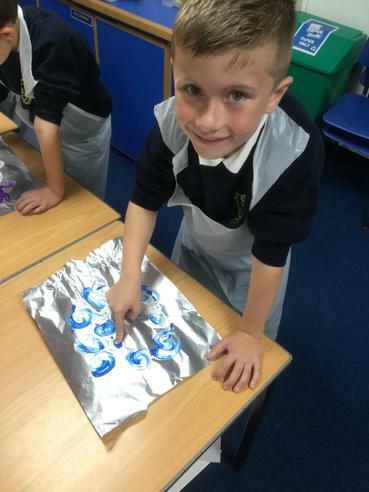 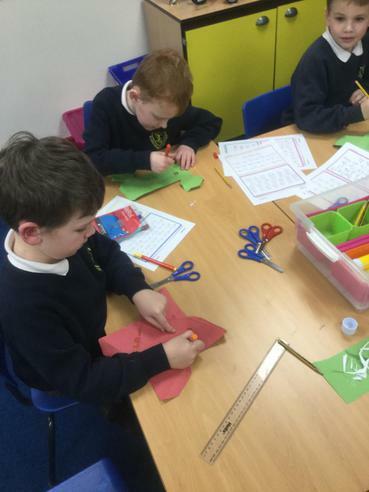 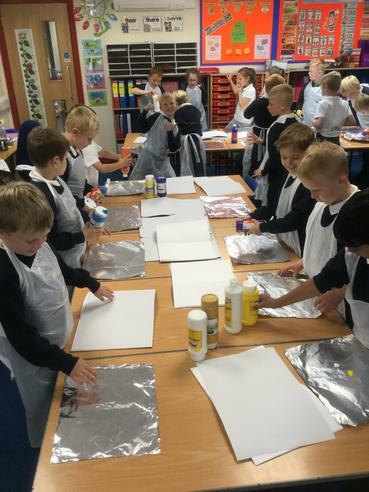 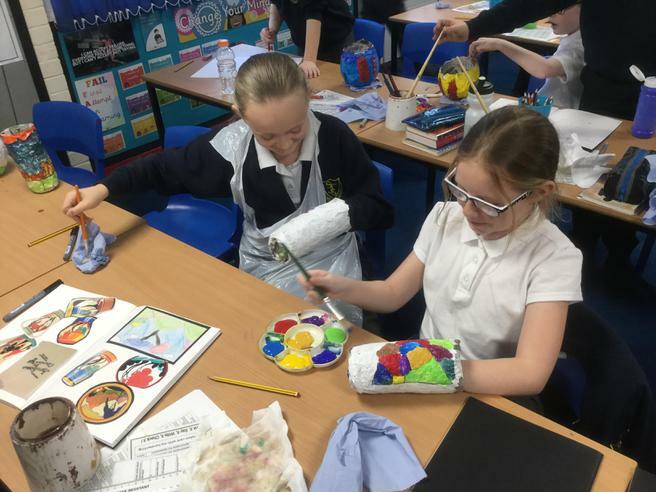 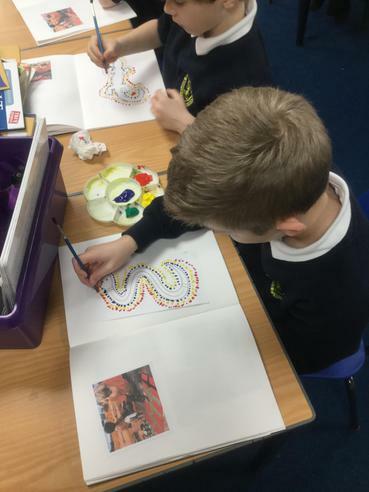 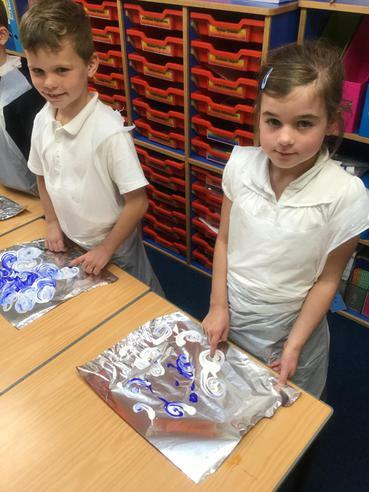 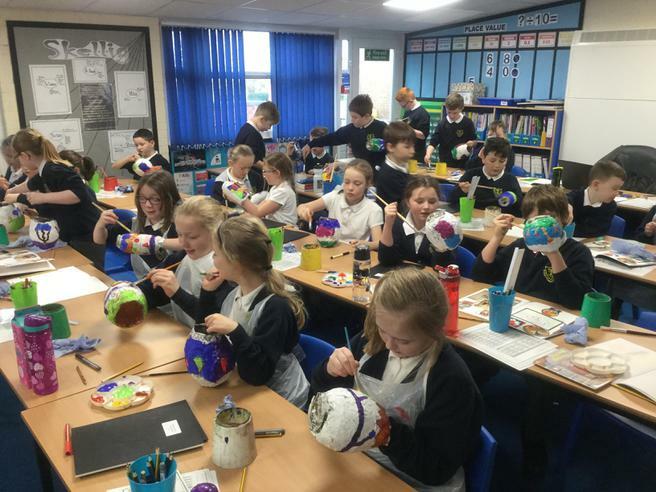 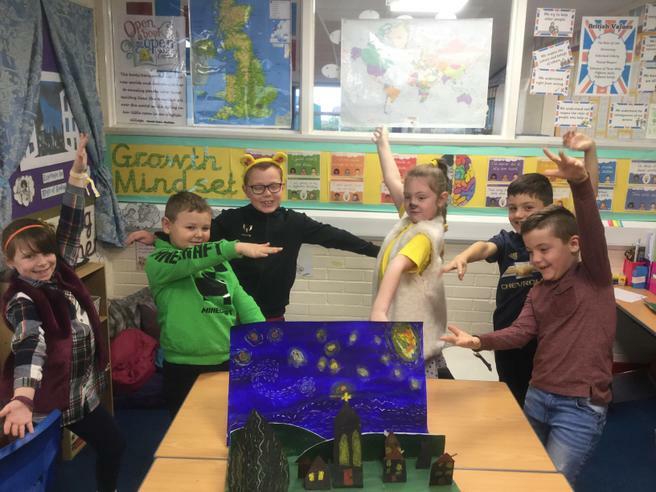 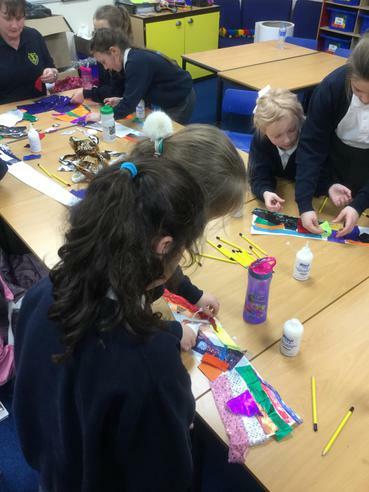 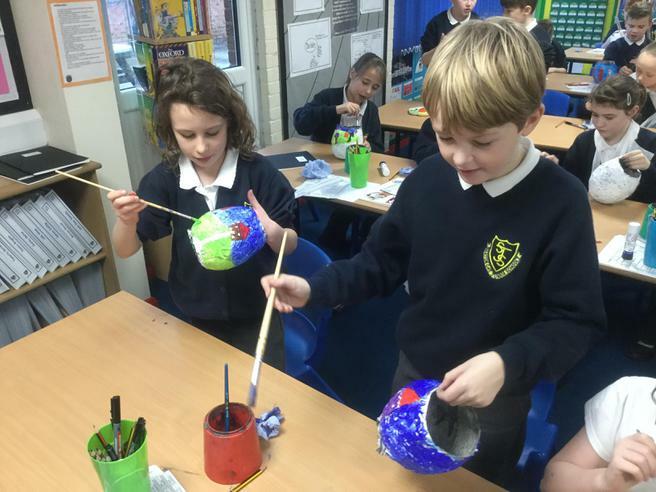 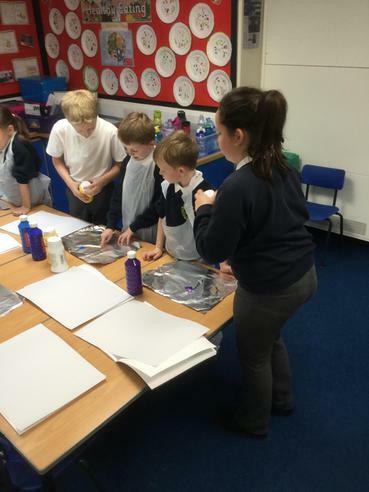 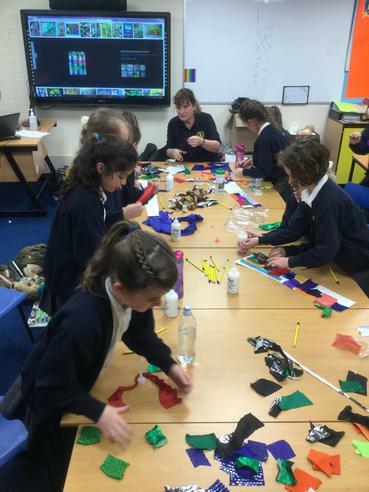 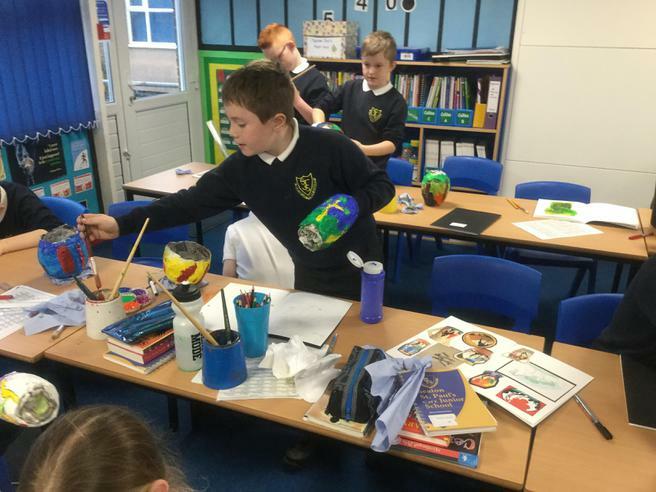 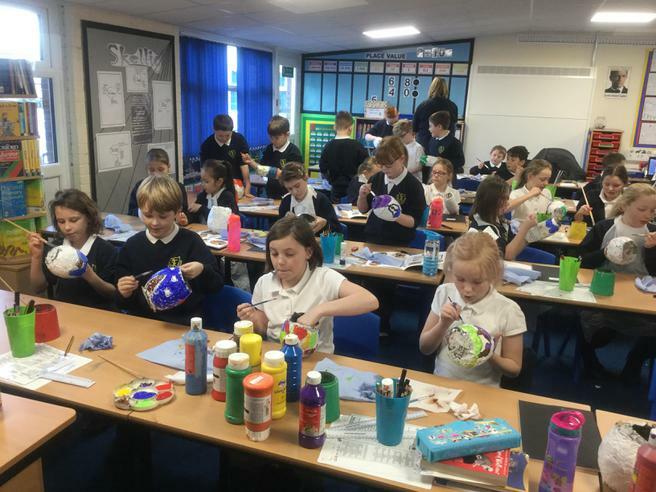 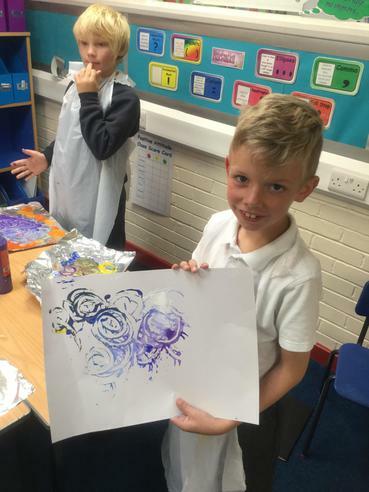 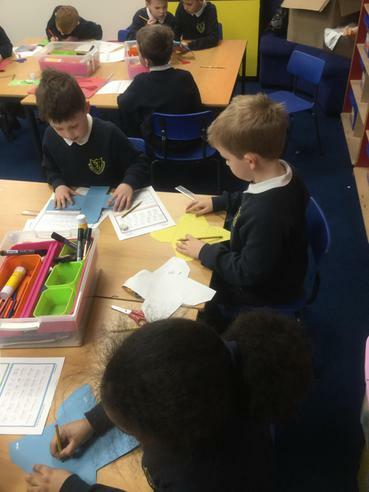 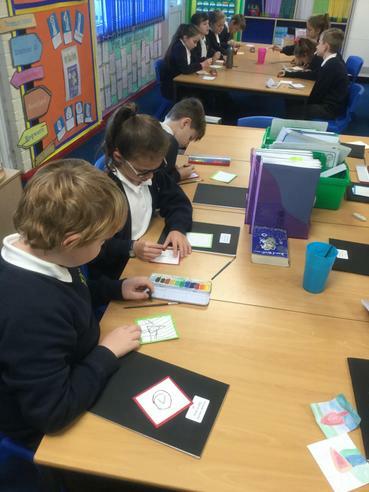 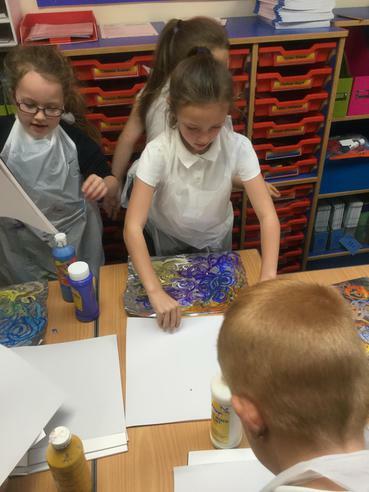 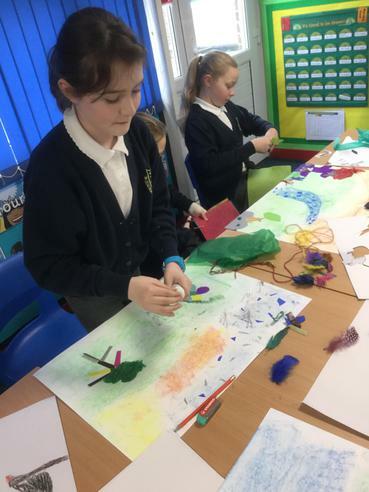 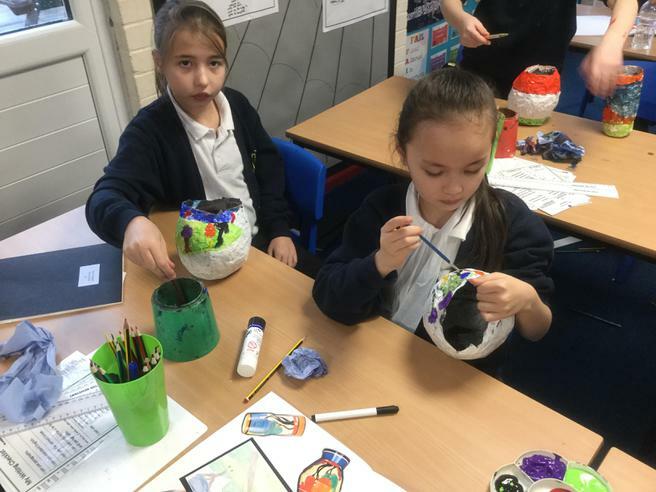 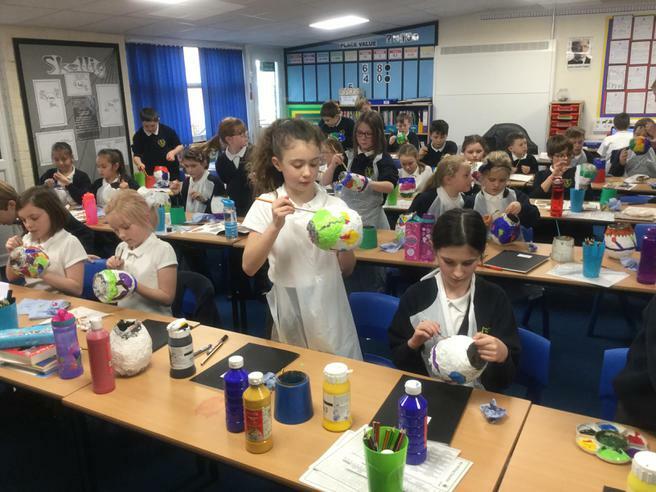 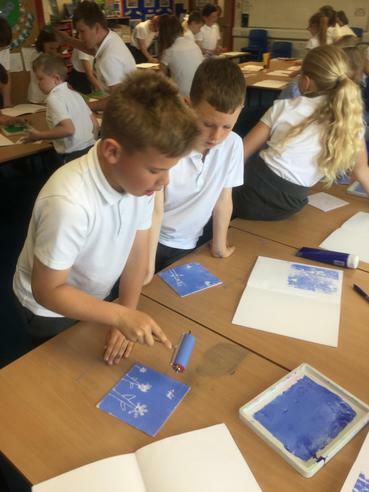 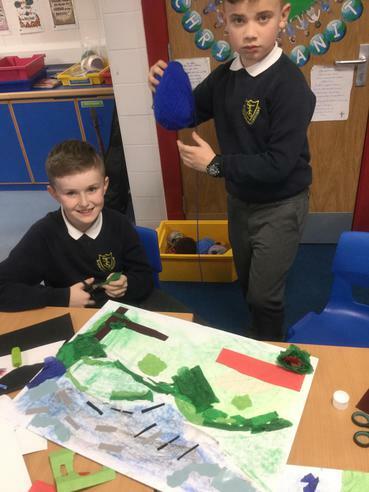 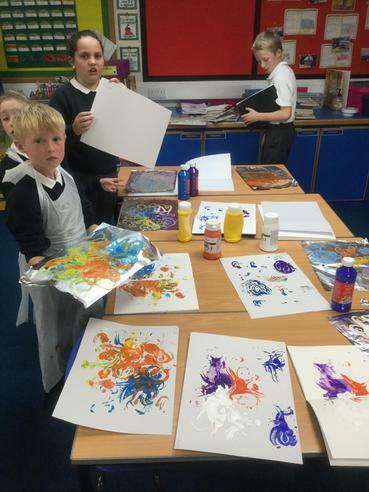 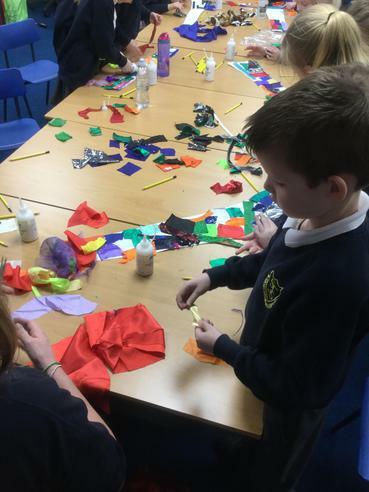 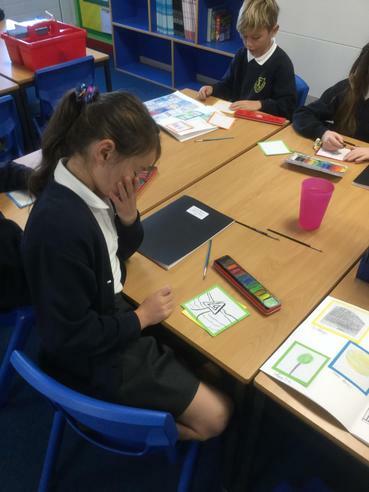 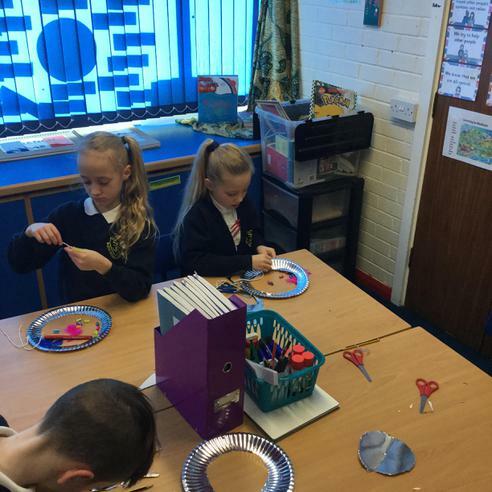 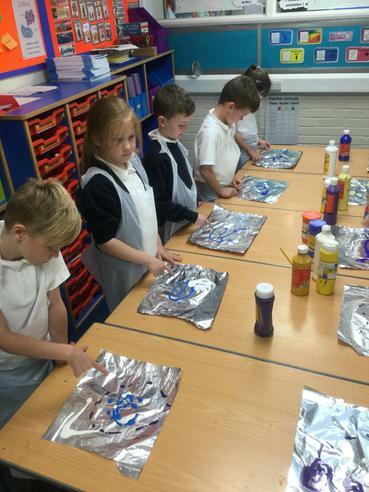 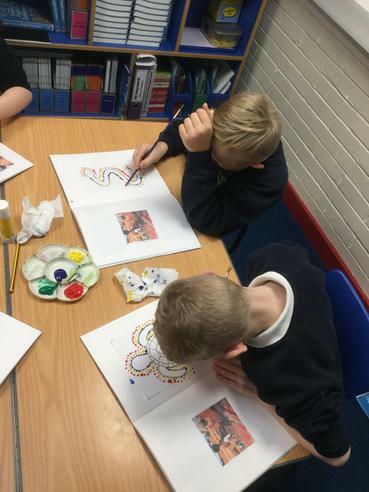 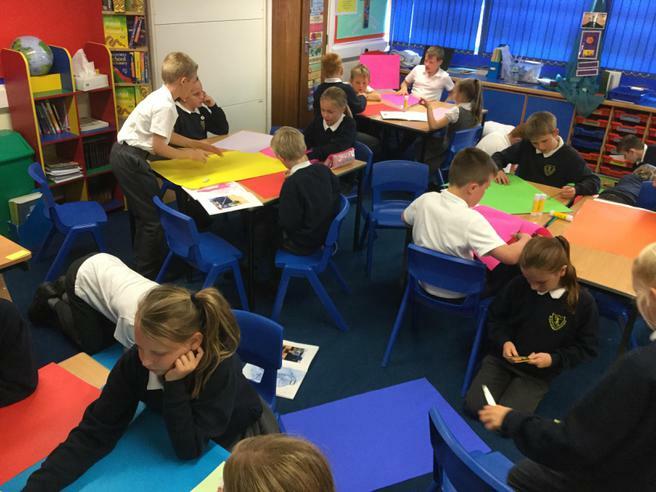 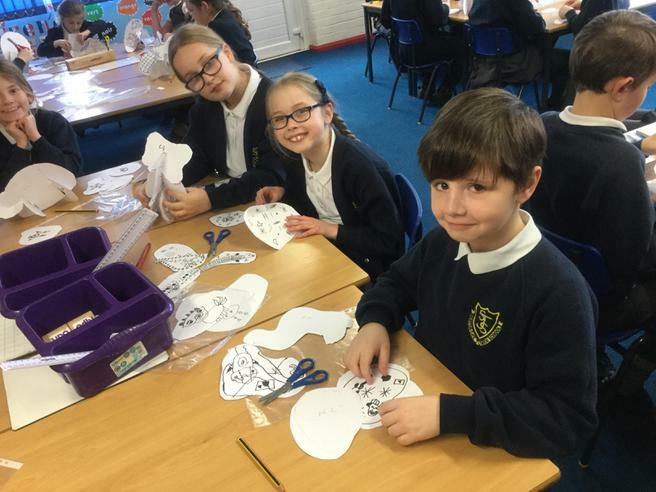 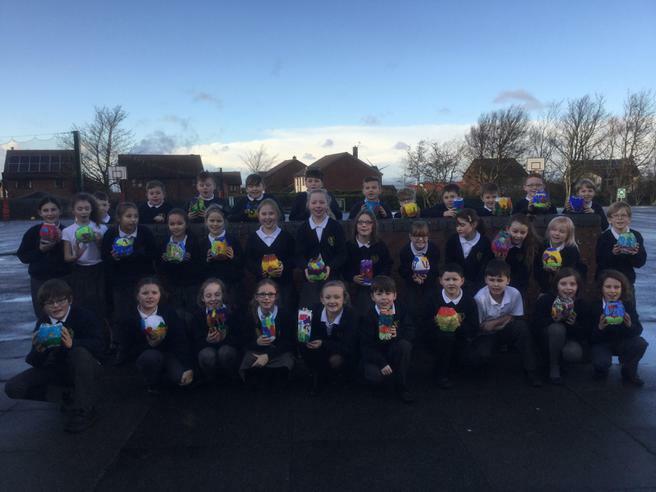 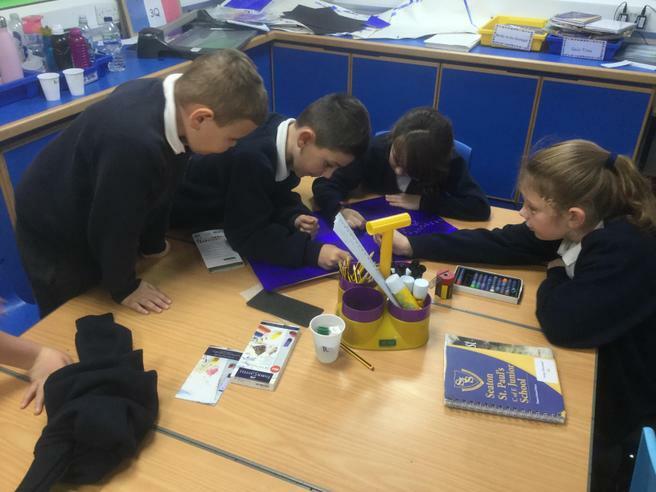 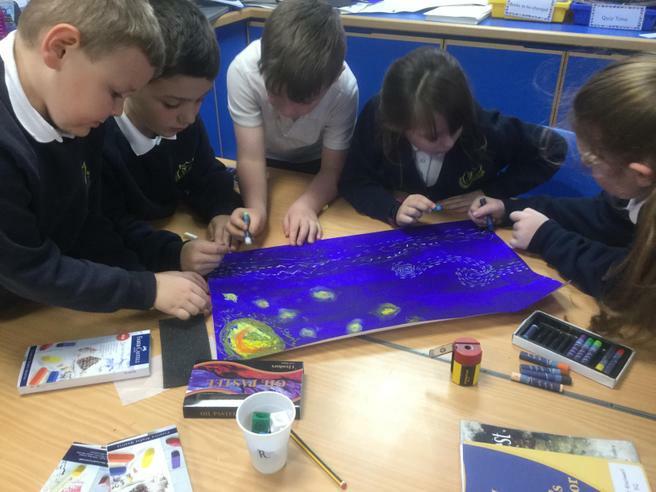 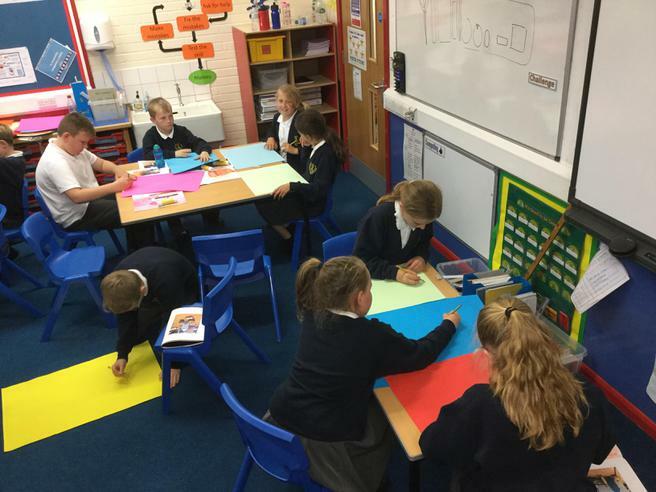 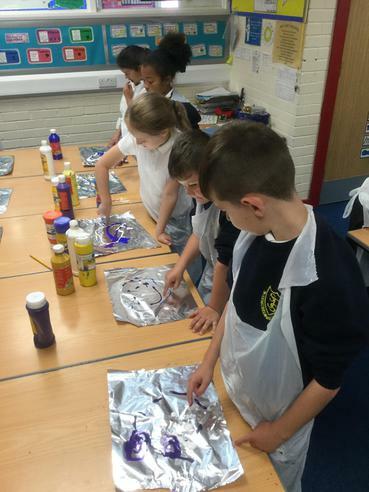 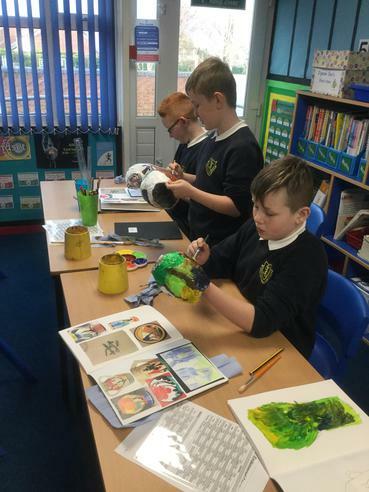 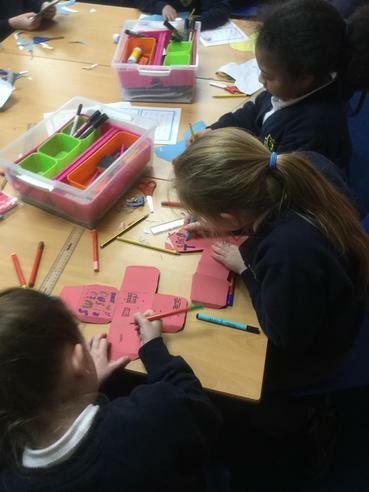 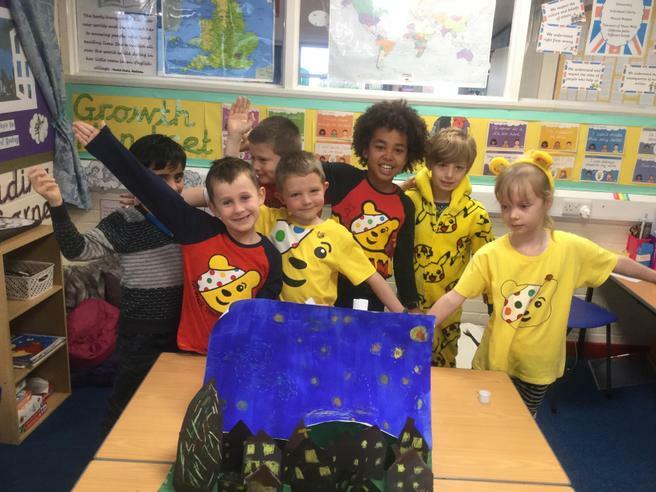 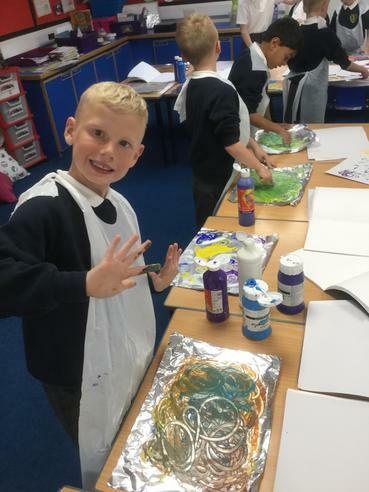 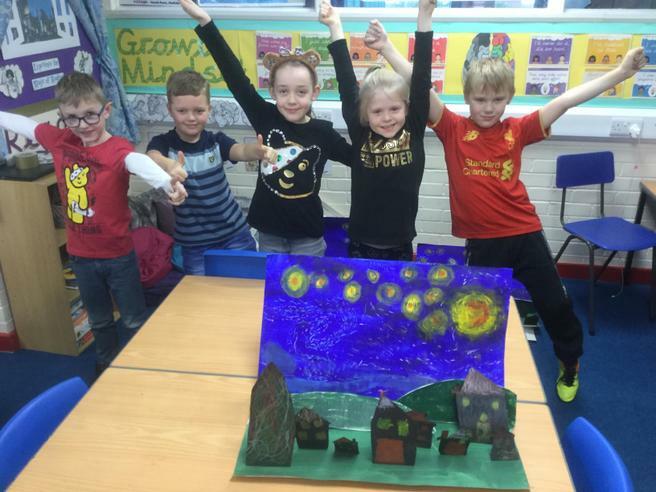 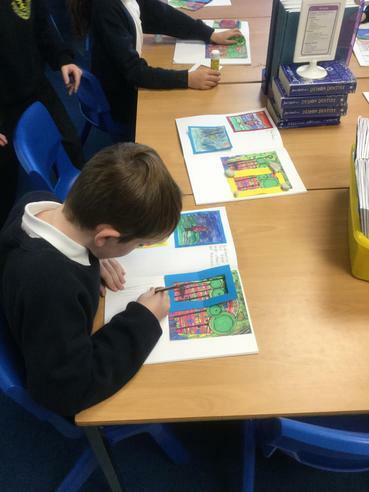 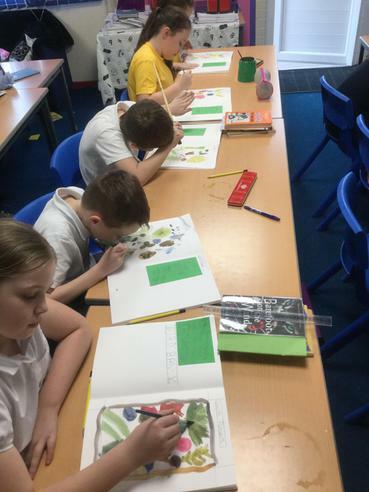 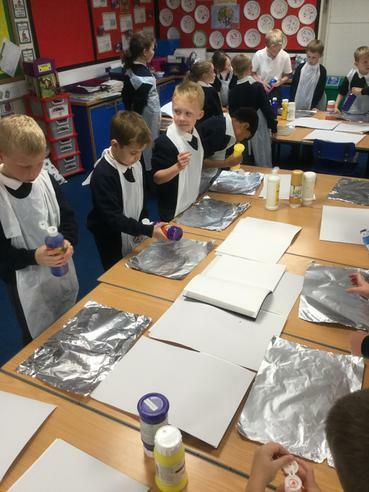 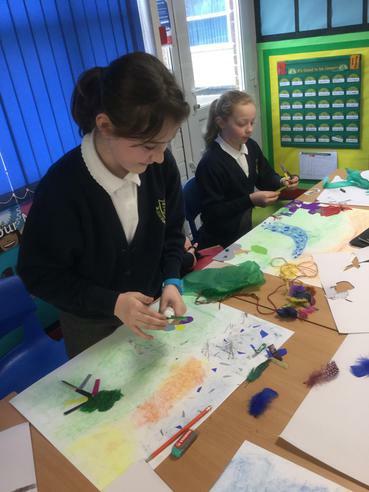 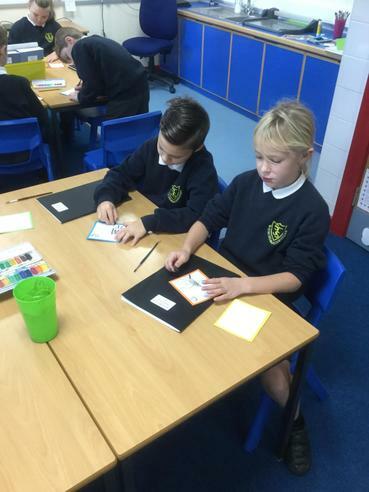 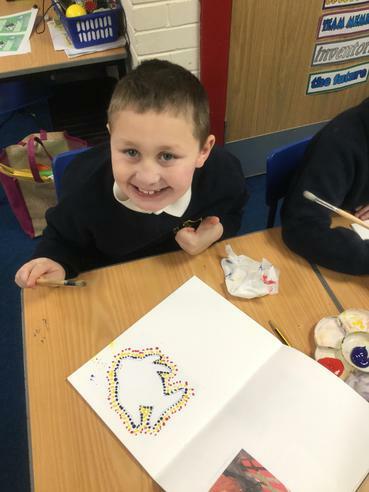 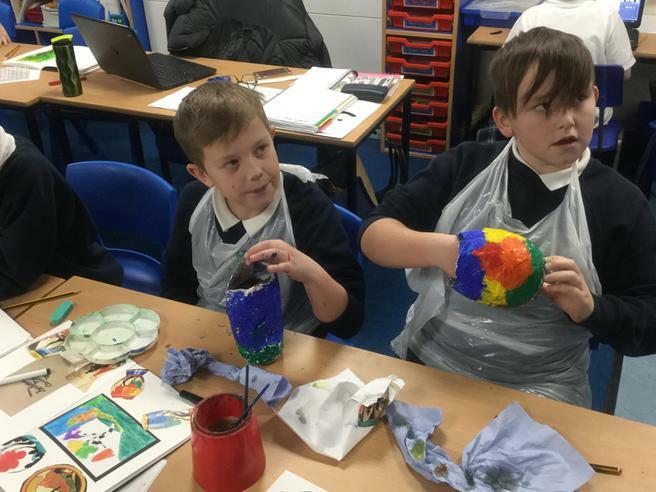 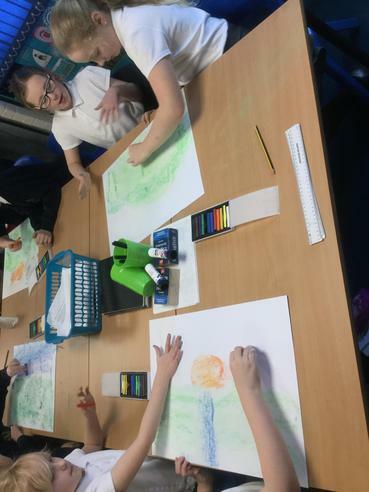 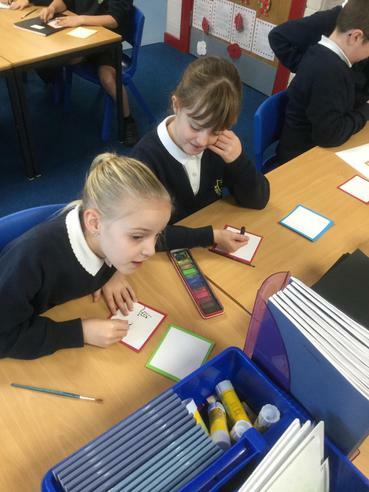 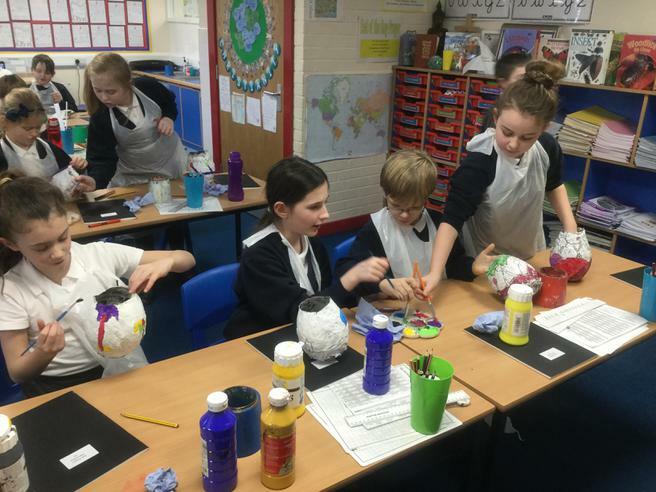 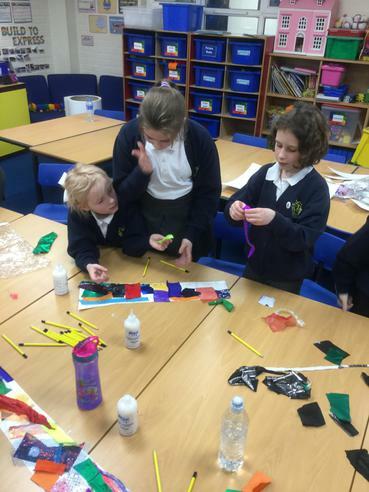 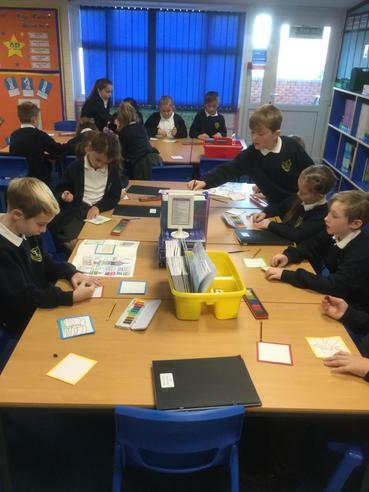 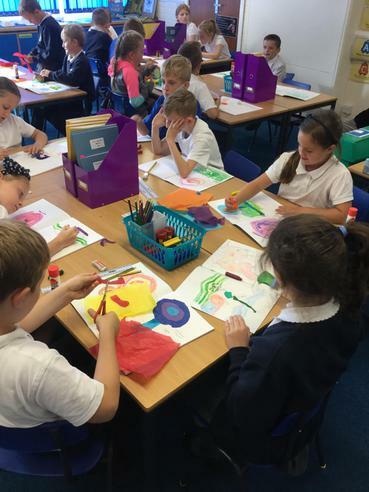 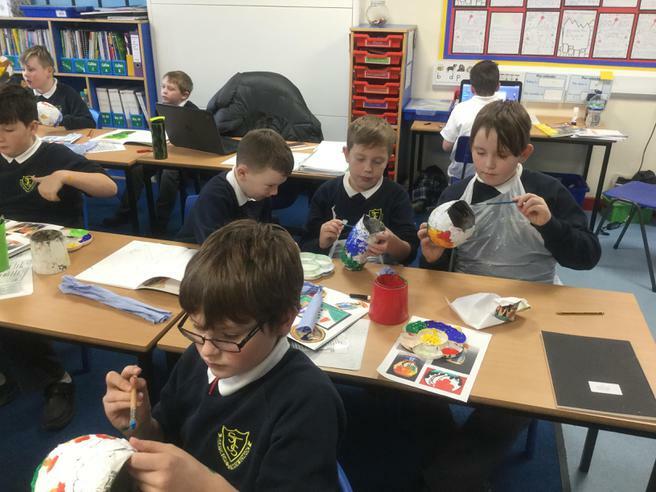 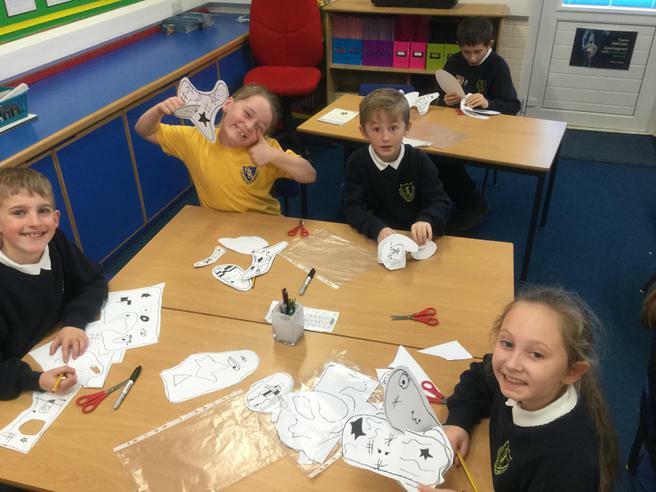 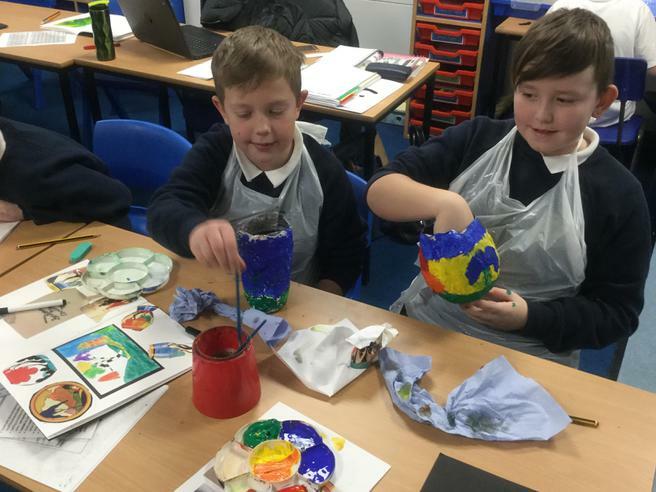 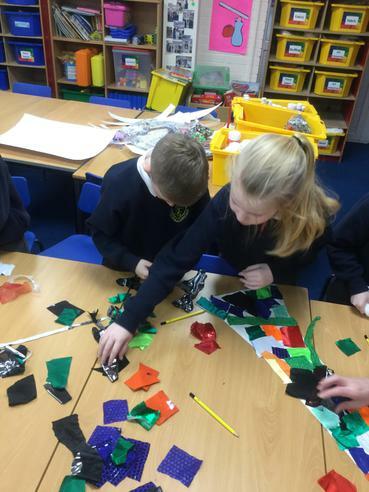 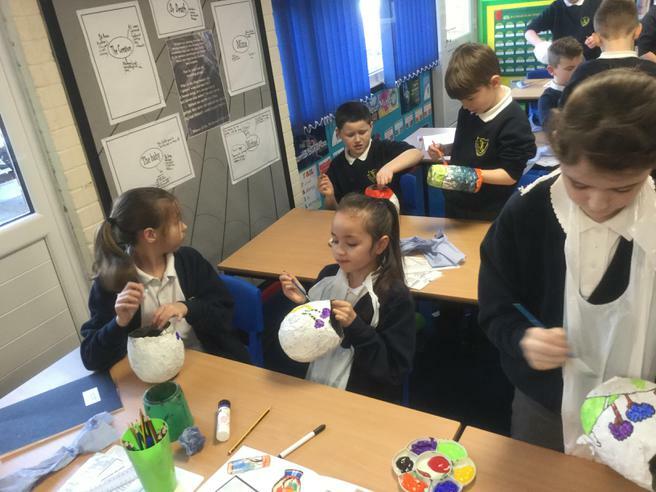 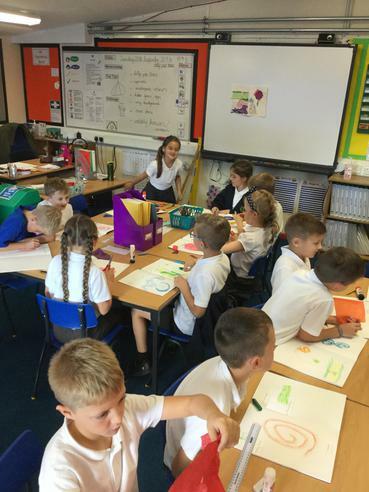 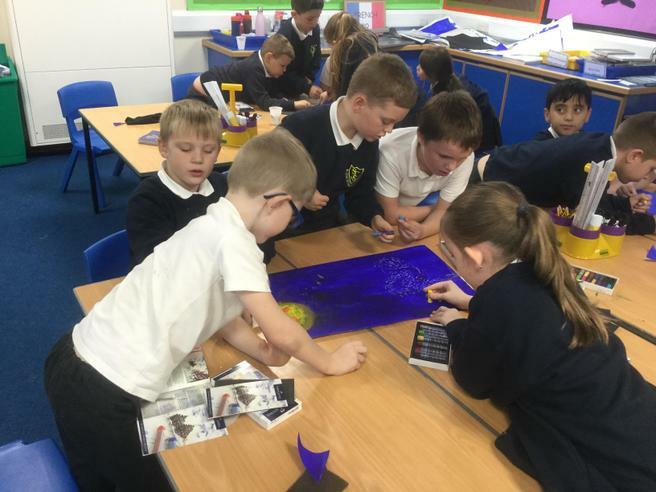 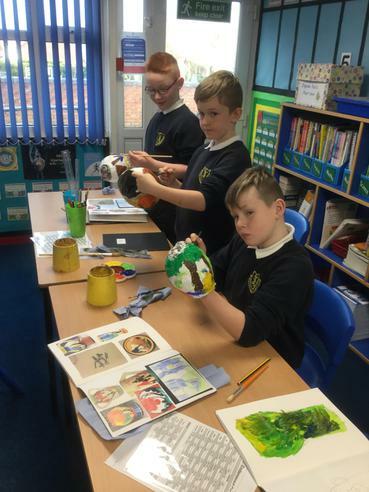 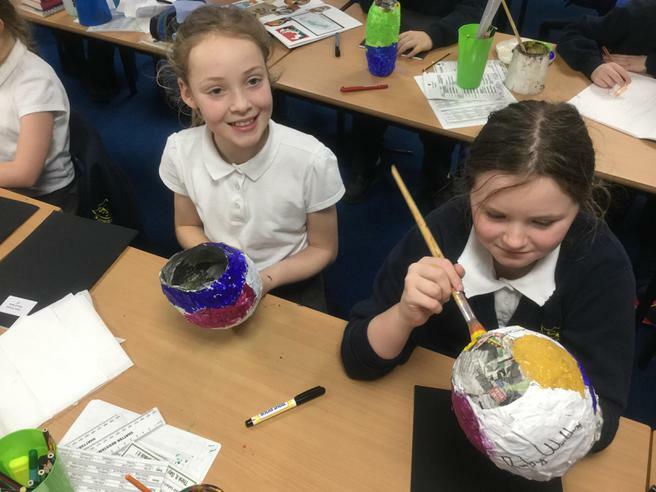 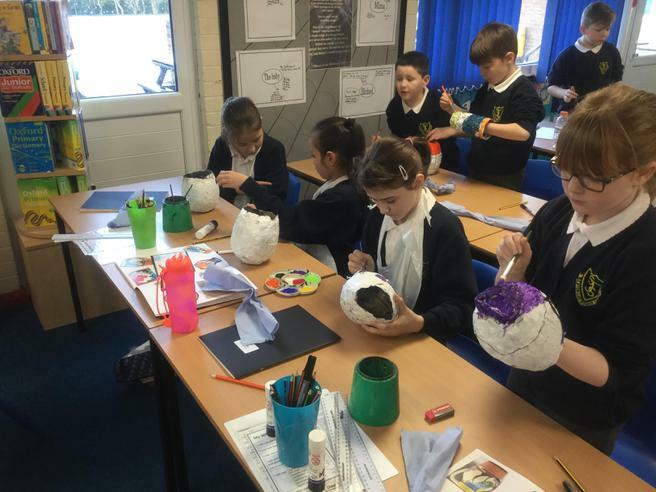 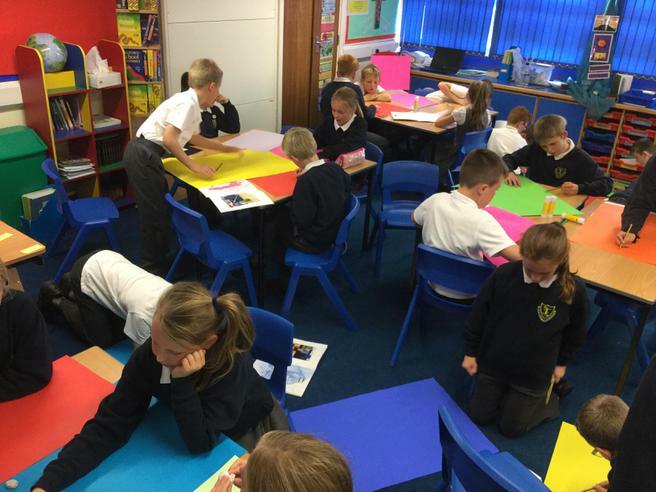 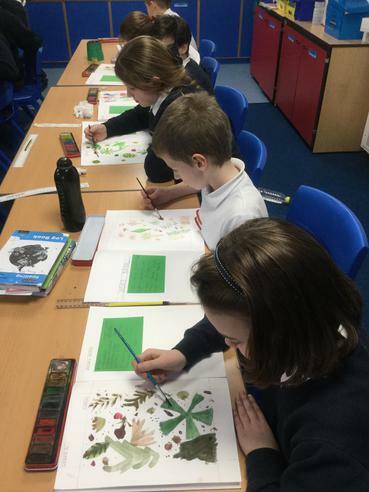 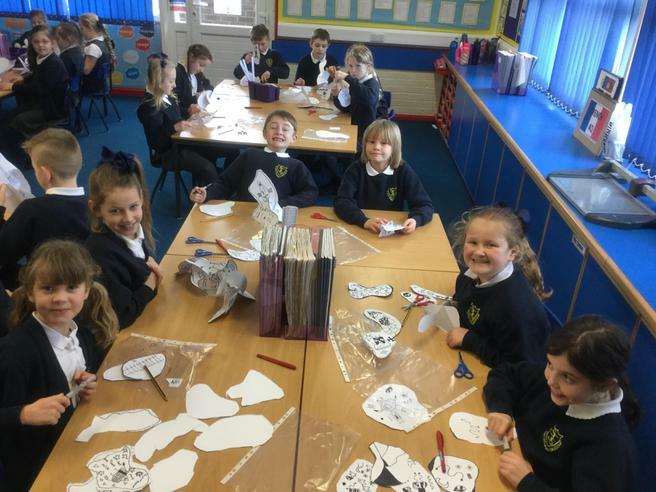 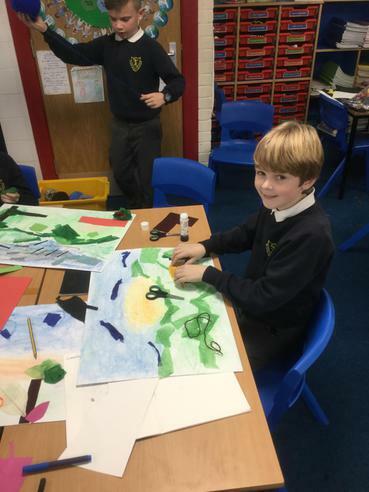 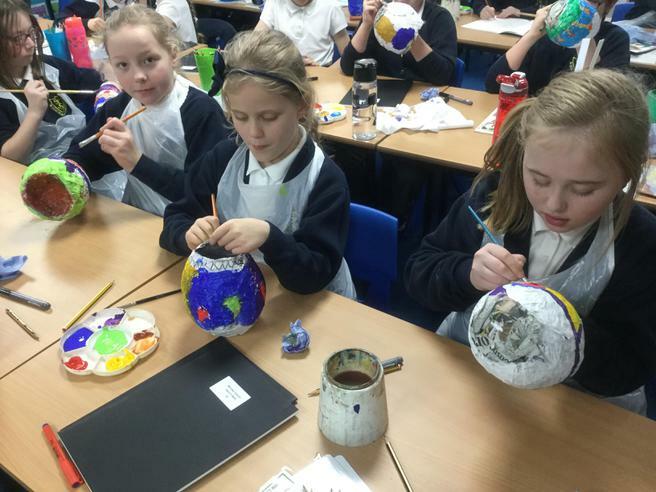 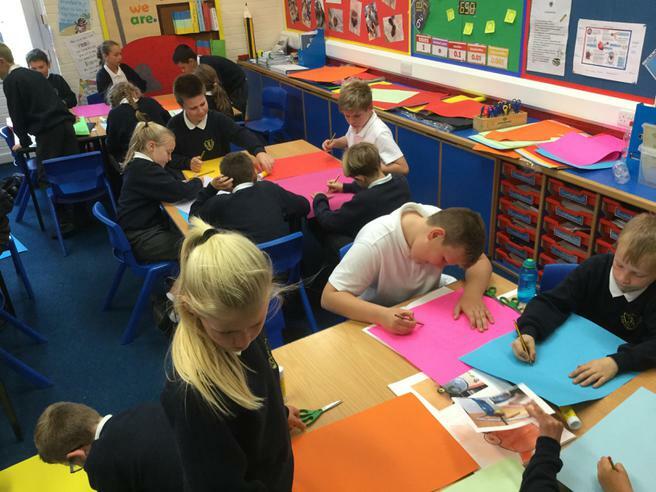 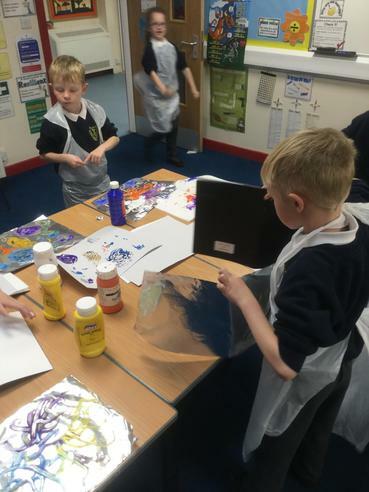 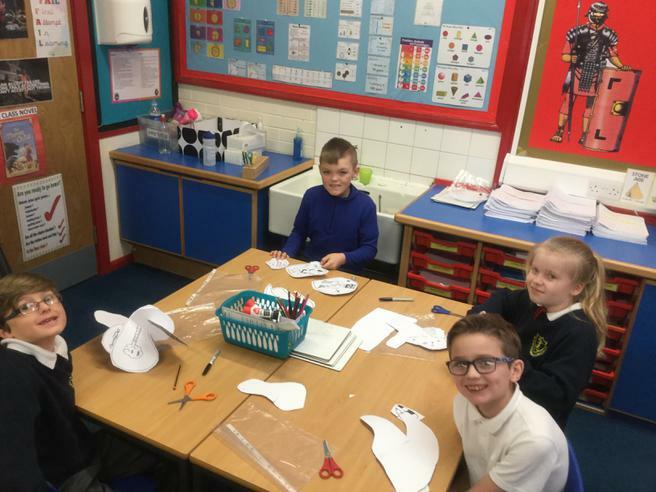 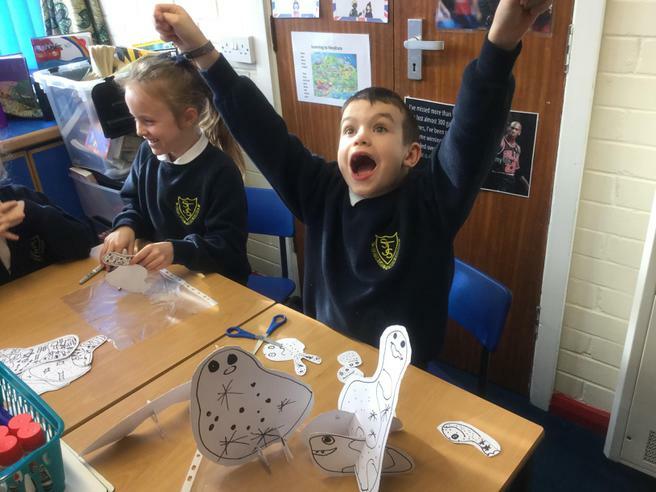 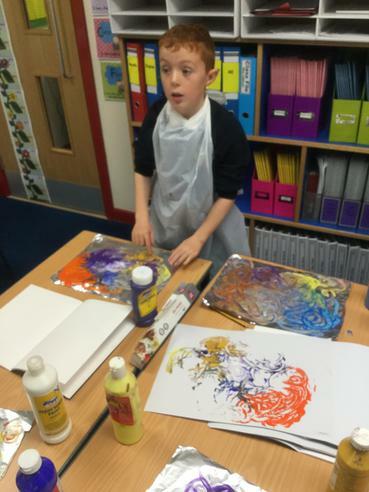 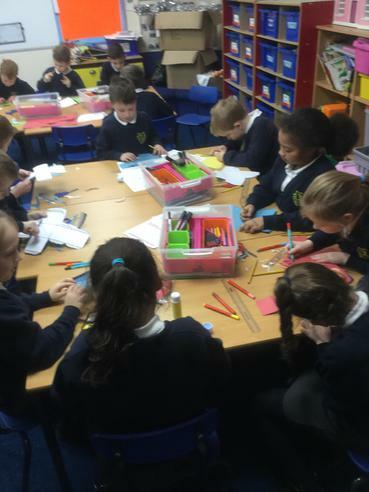 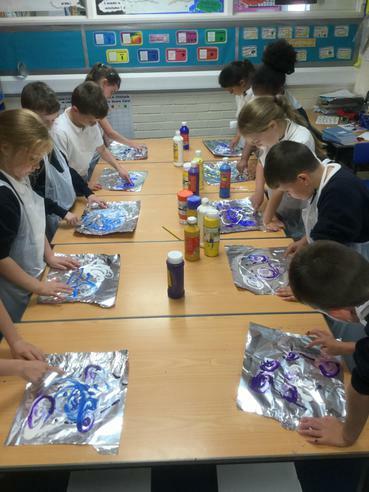 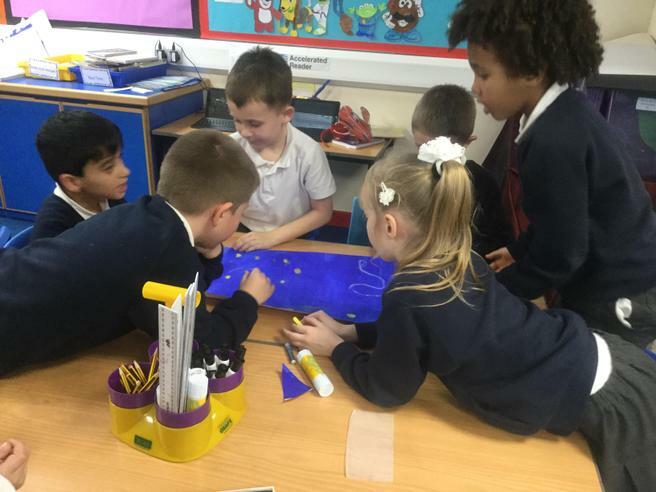 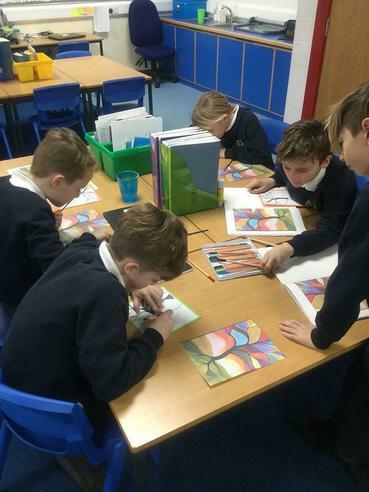 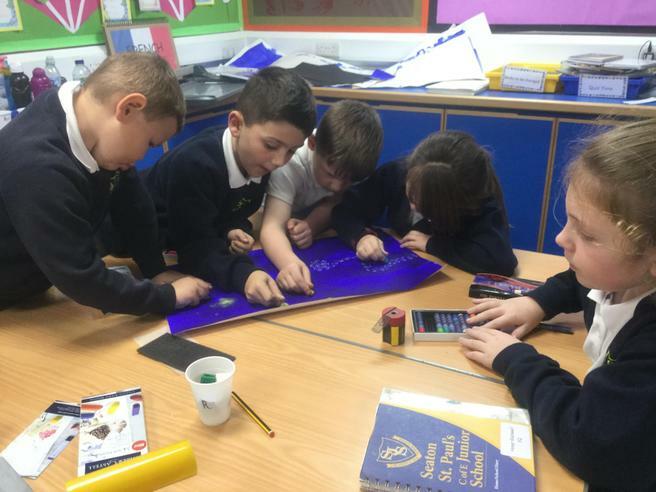 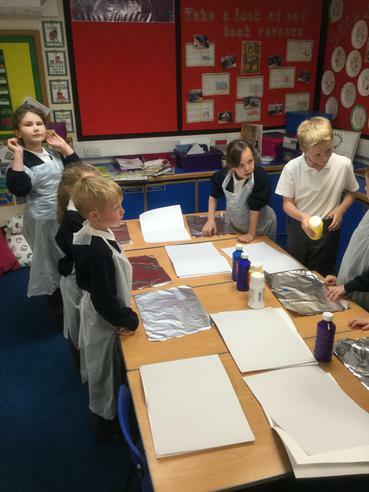 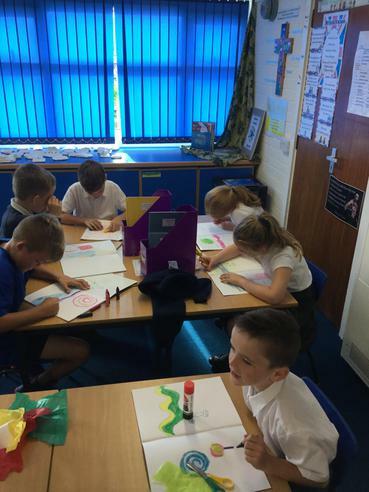 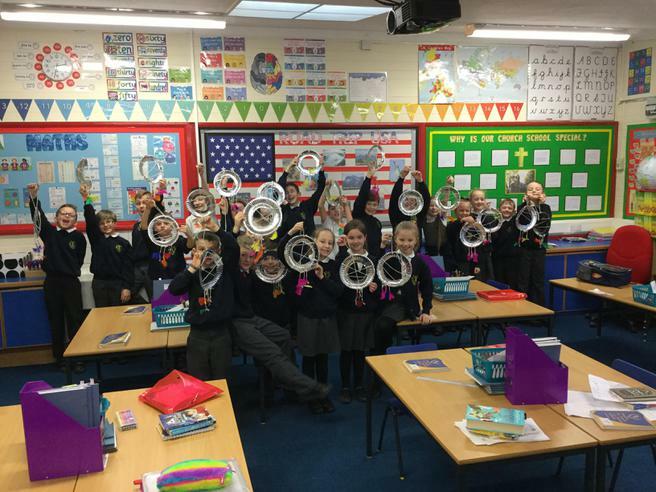 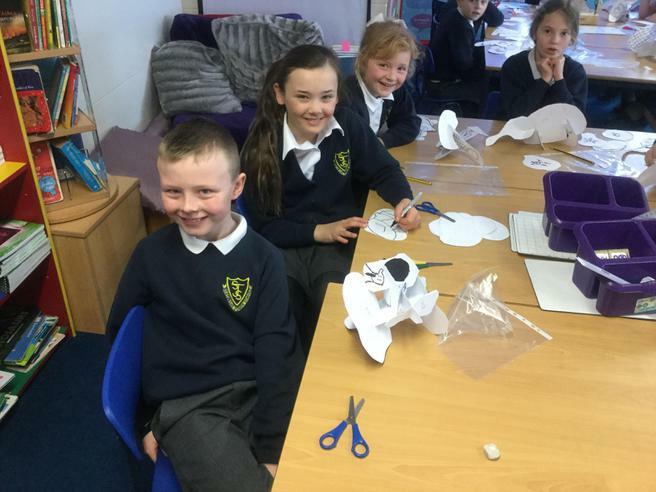 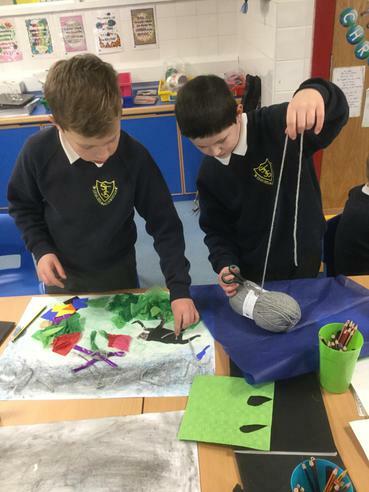 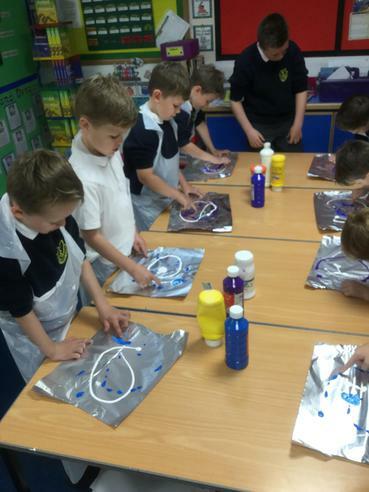 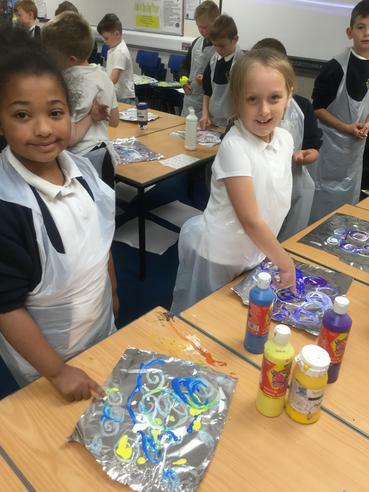 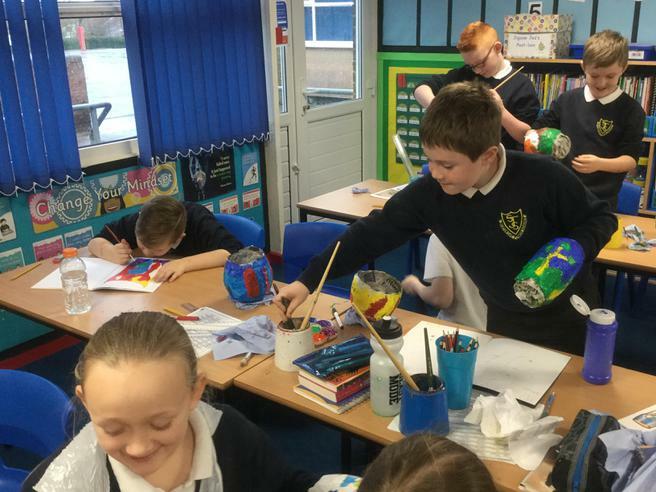 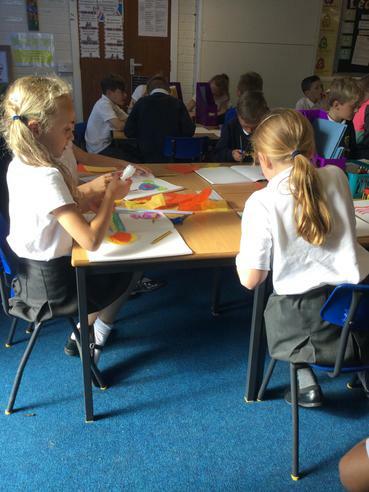 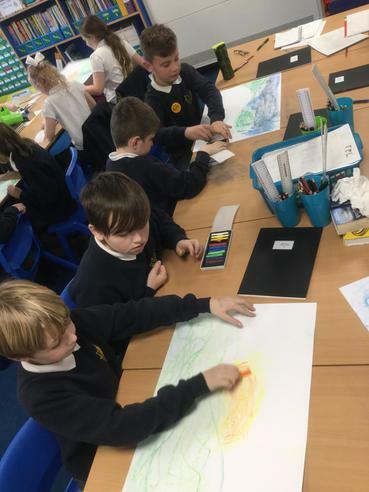 3N with their ‘Starry Night’ art work after learning about Vincent Van Gough. 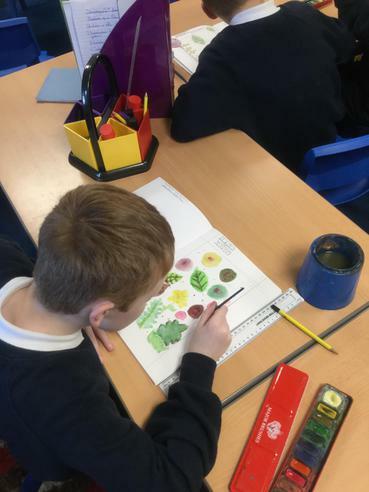 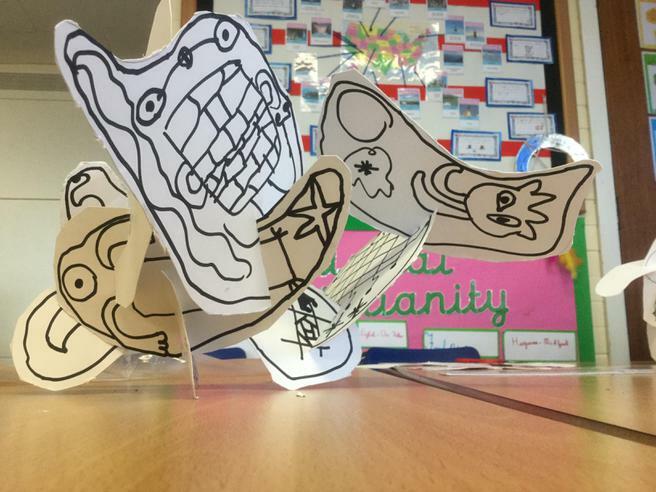 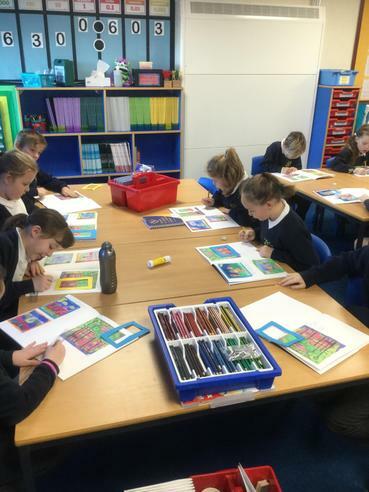 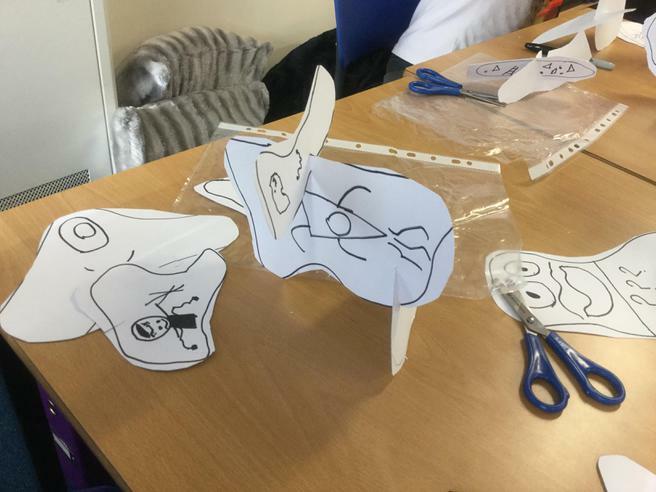 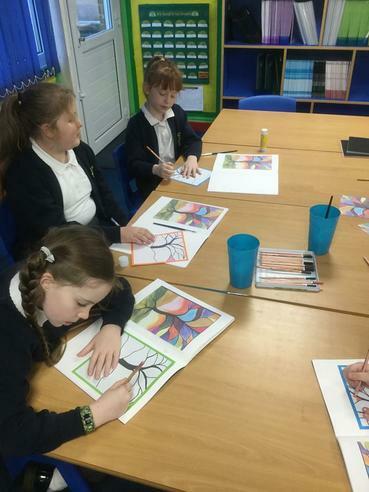 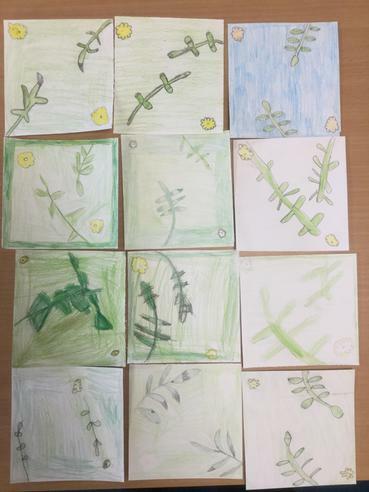 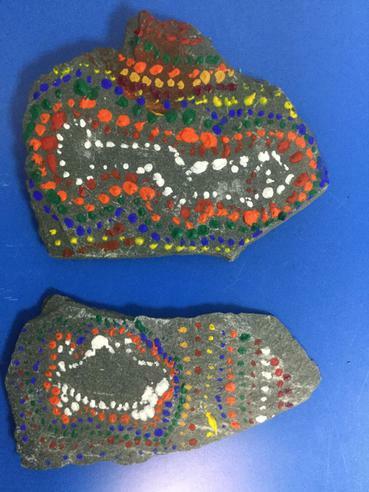 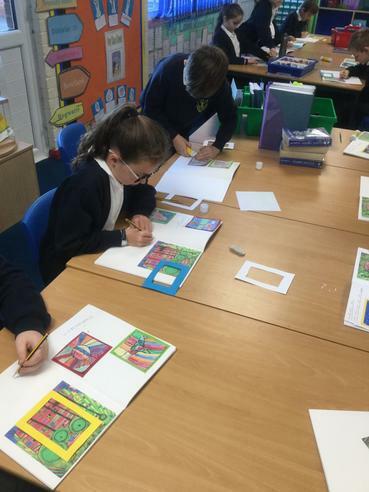 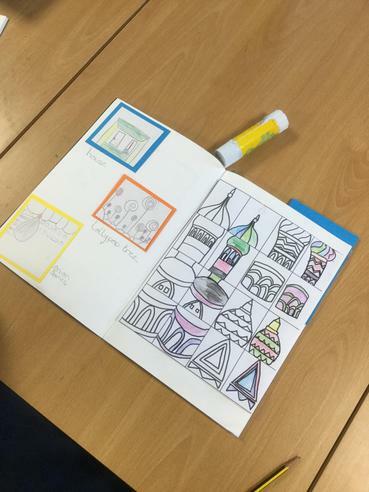 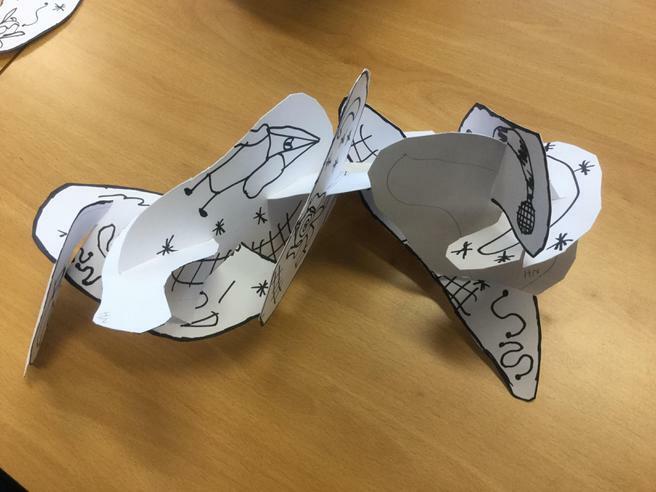 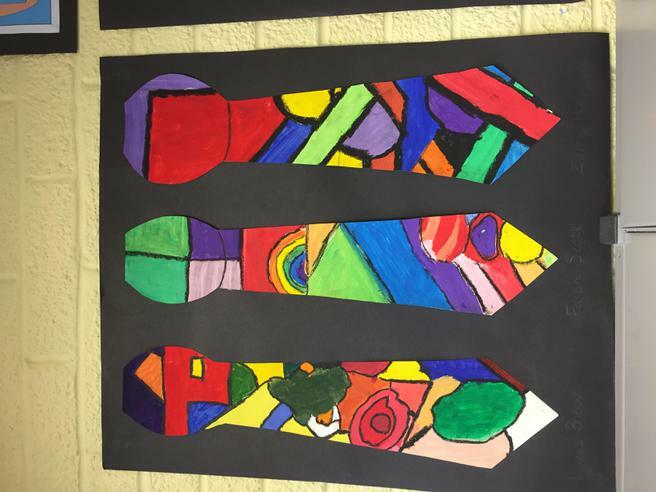 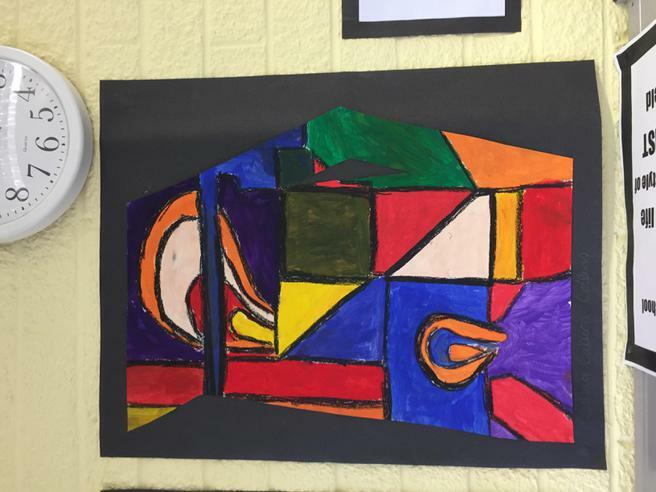 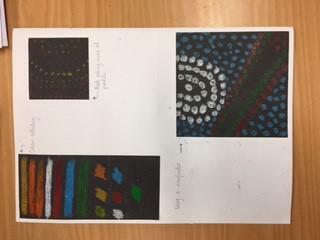 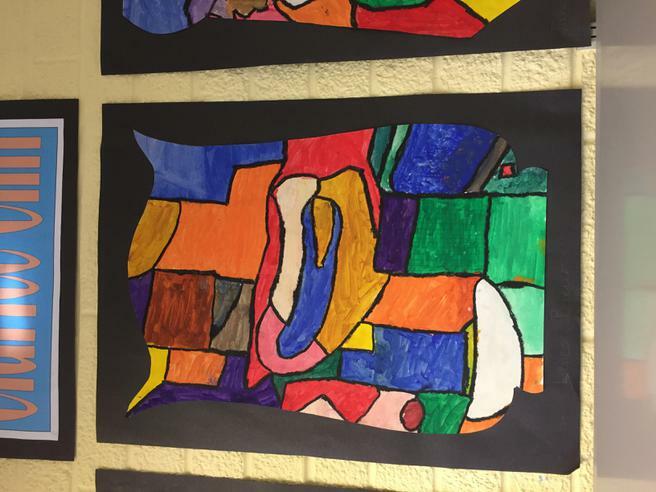 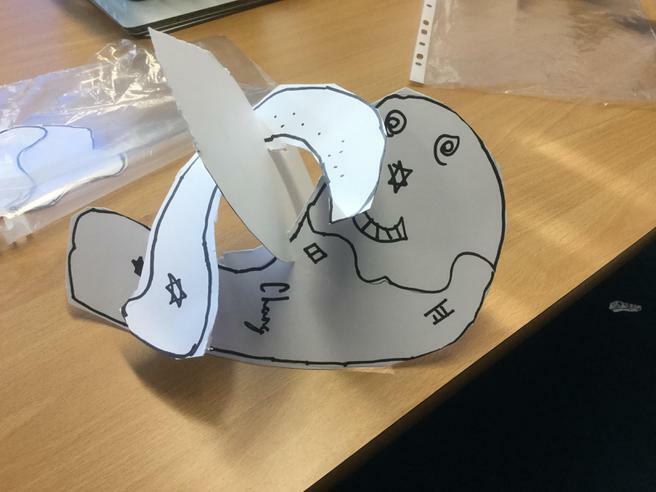 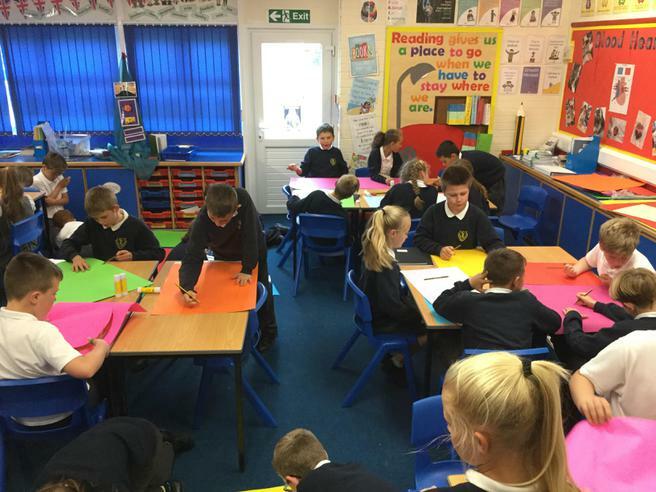 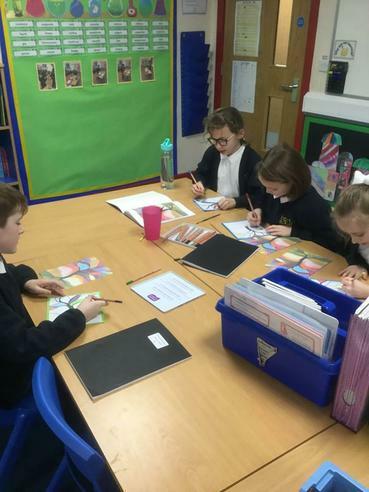 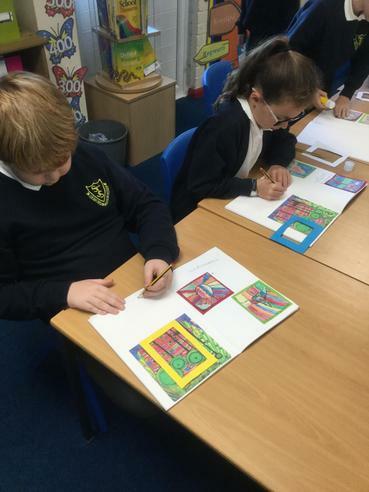 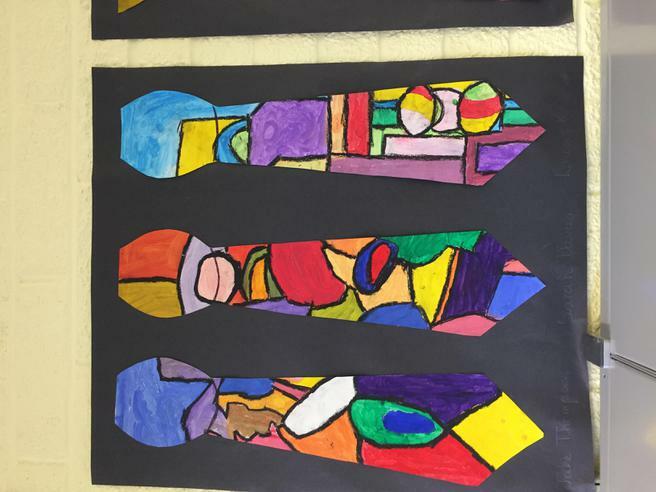 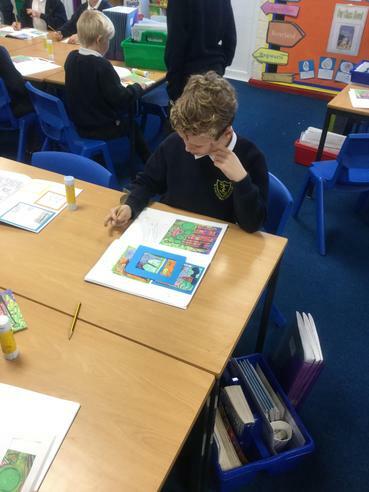 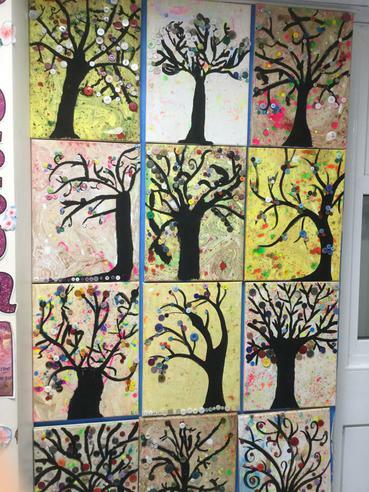 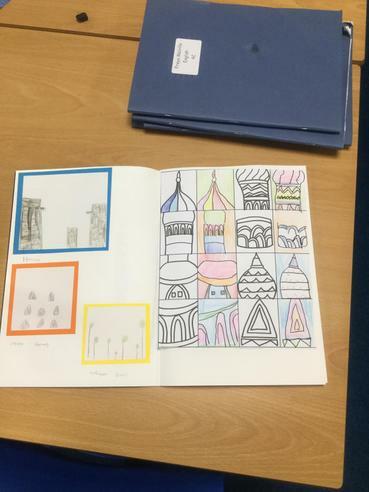 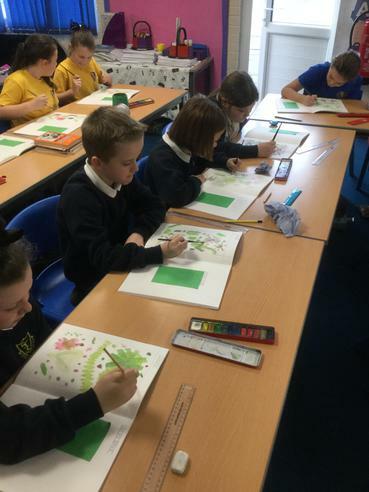 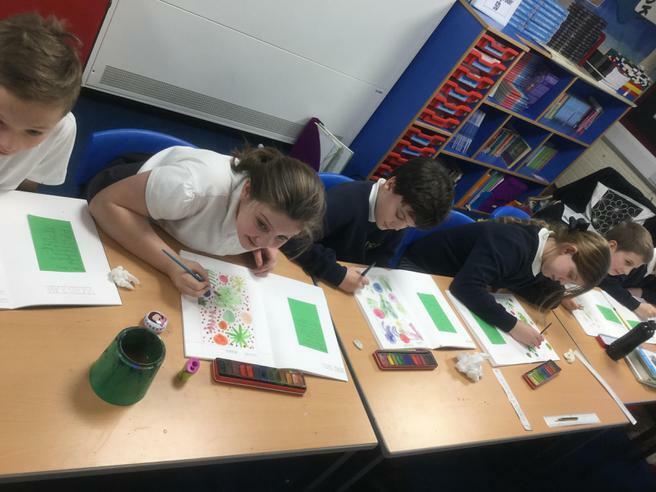 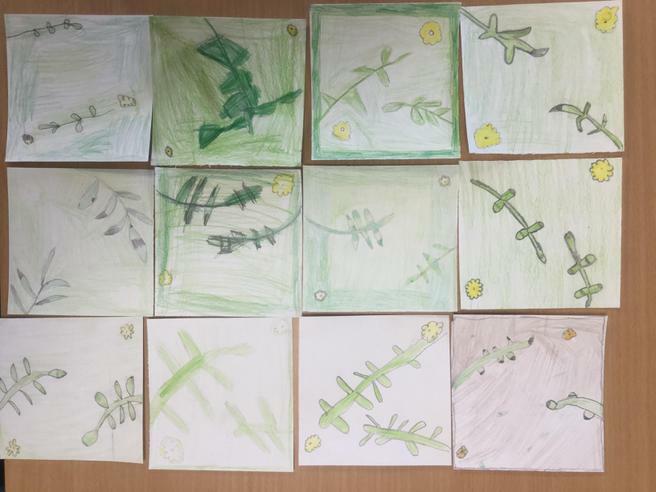 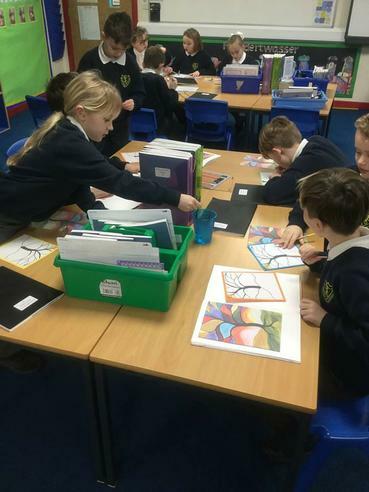 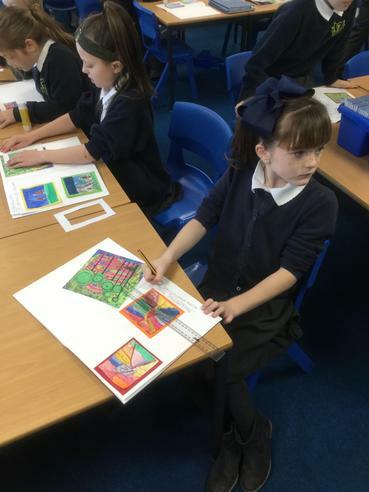 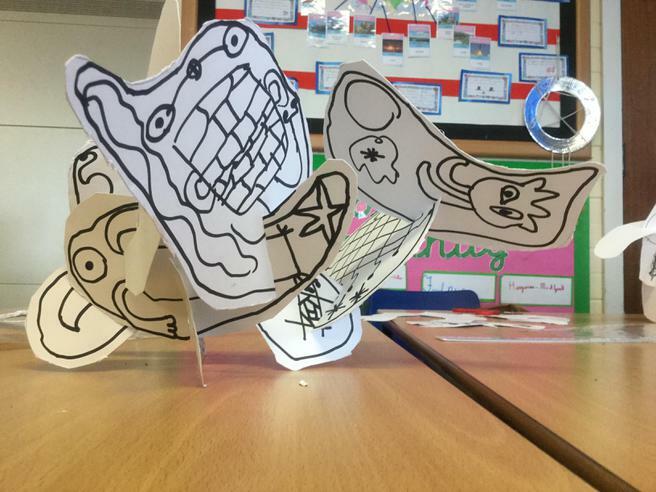 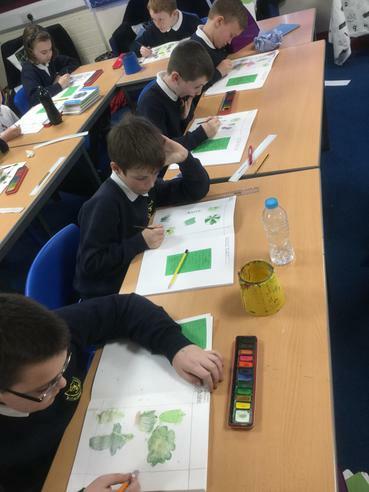 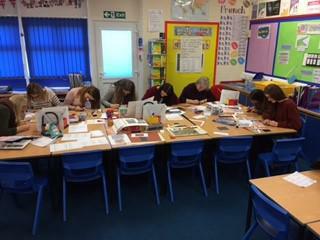 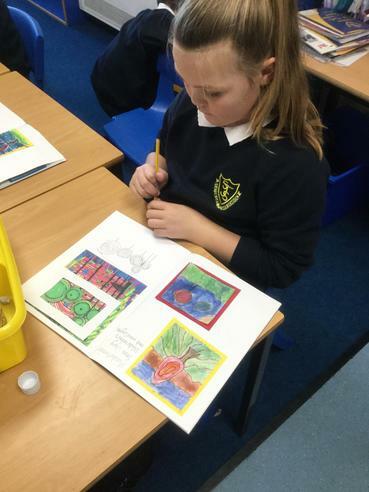 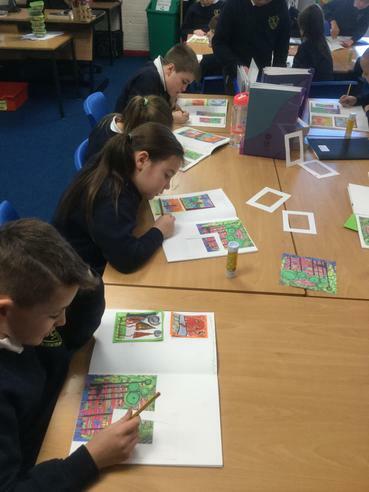 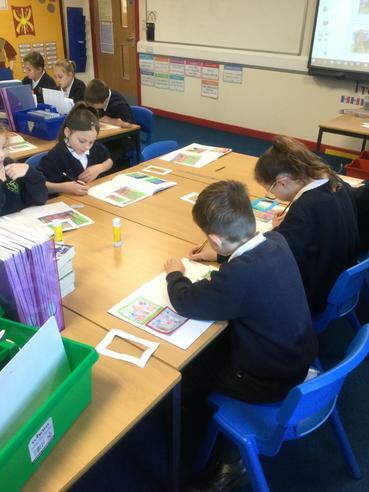 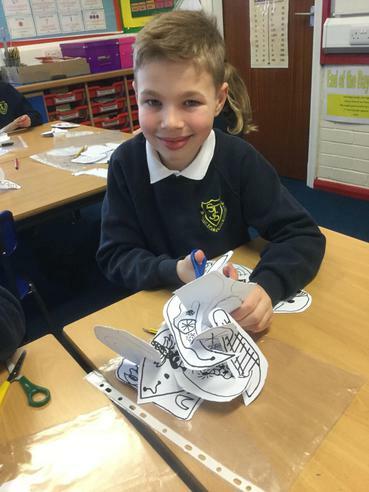 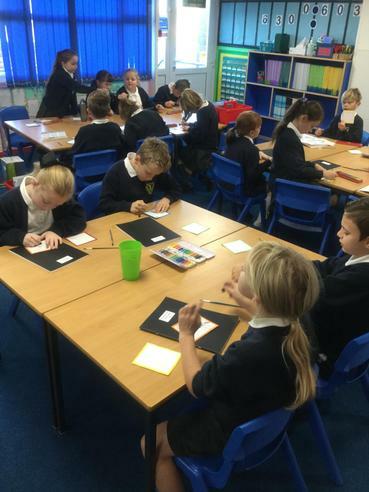 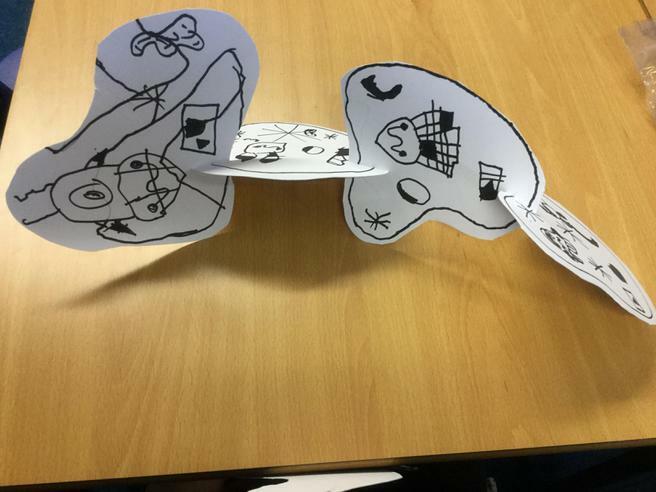 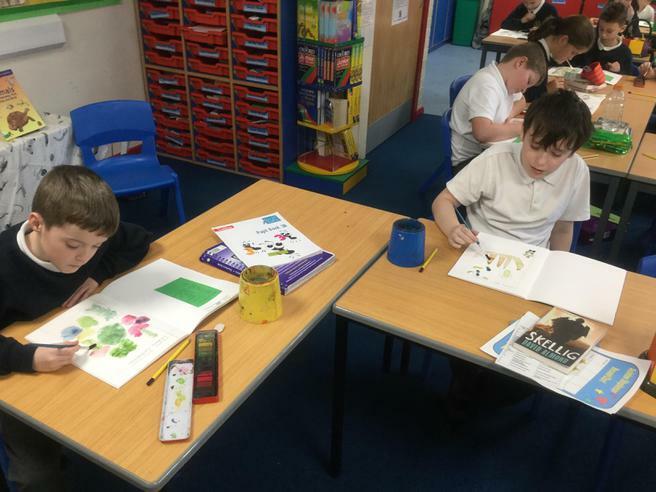 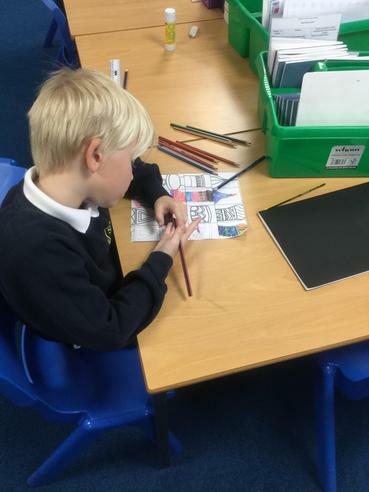 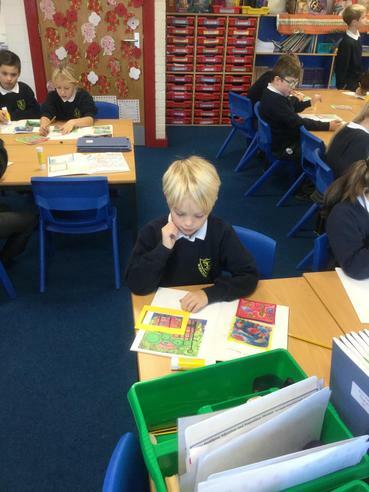 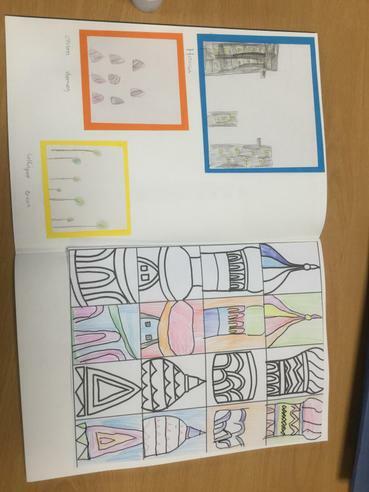 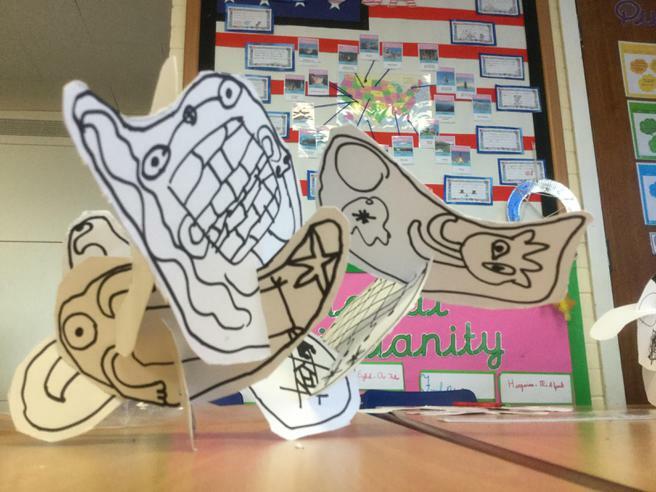 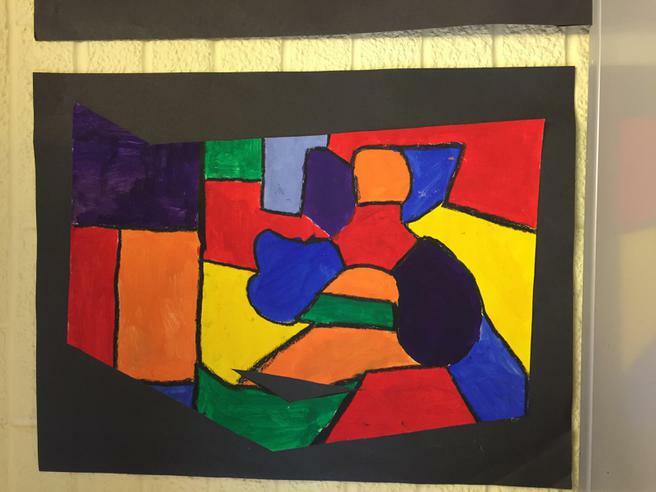 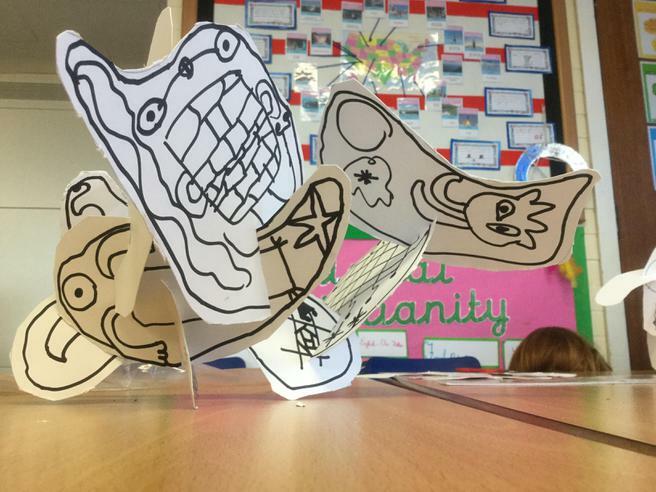 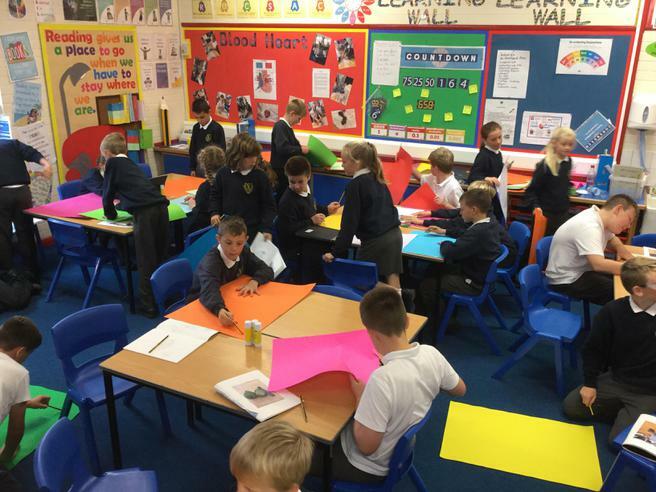 6M finished off the week by completing their 'still life' pieces in the style of Patrick Caulfield. 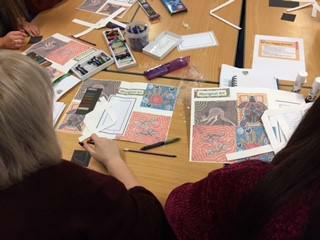 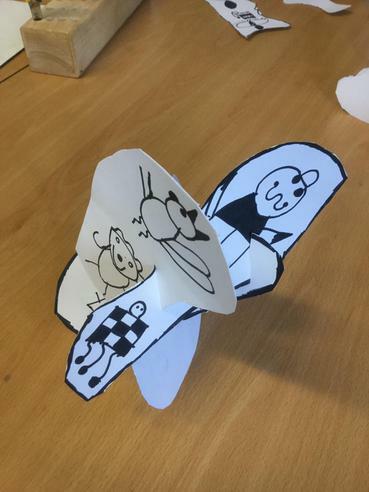 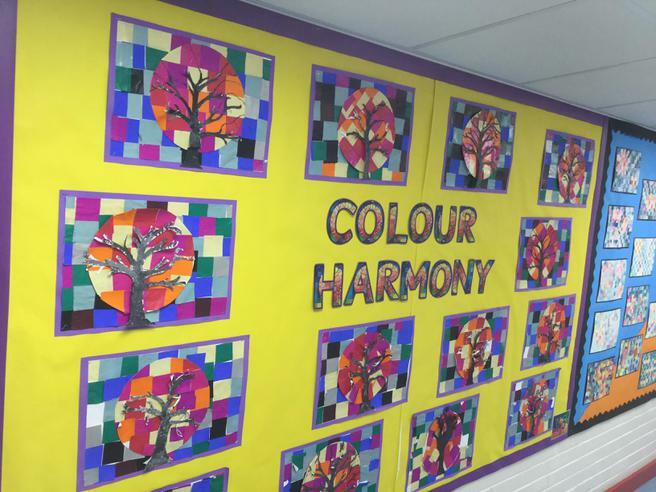 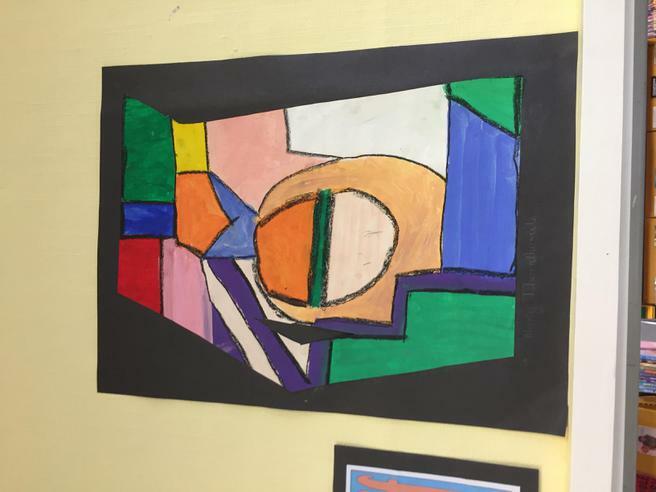 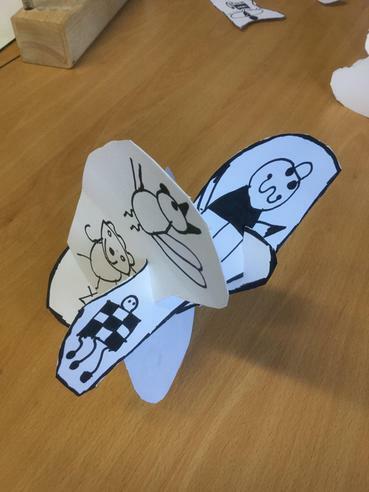 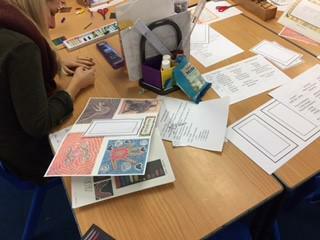 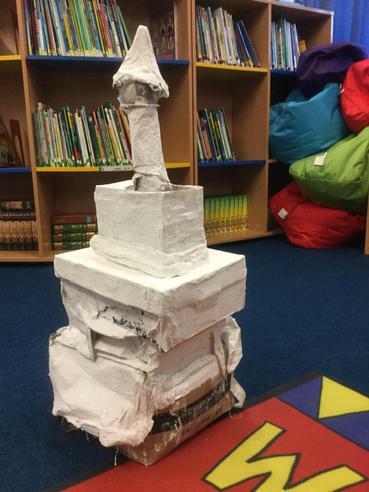 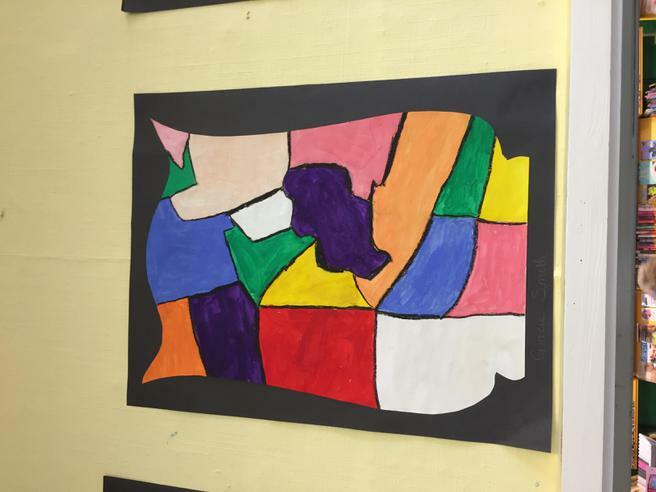 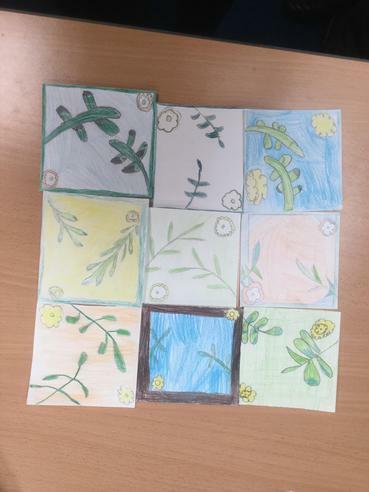 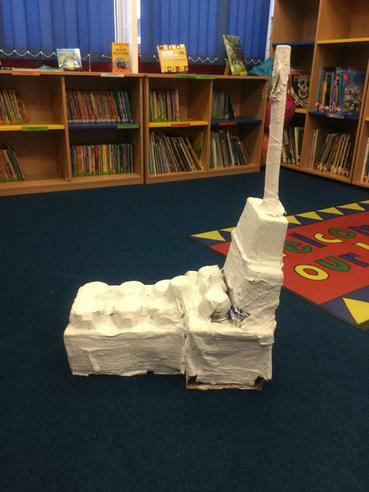 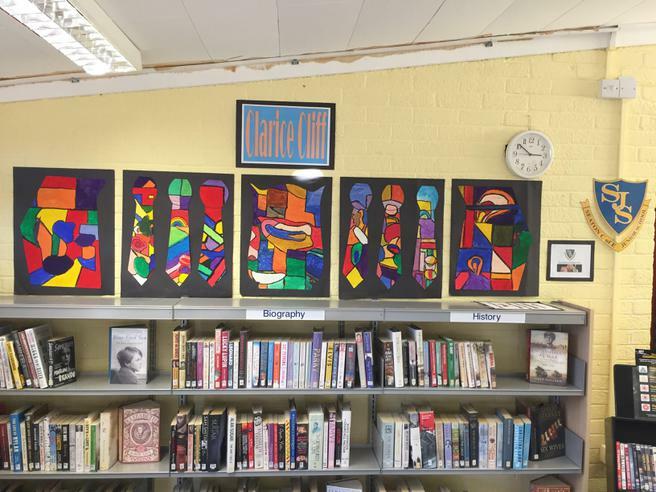 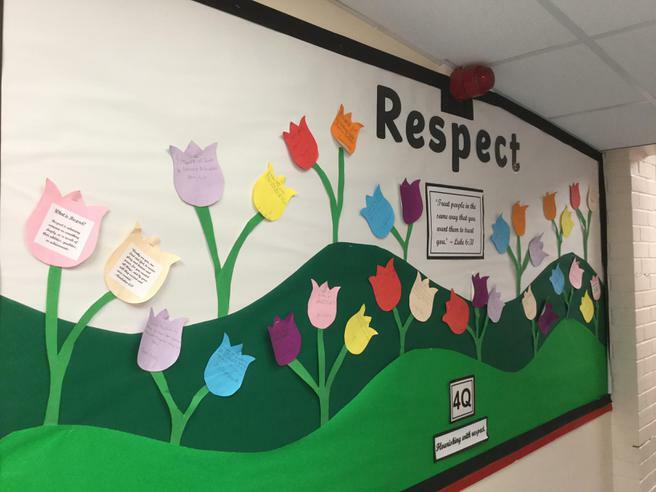 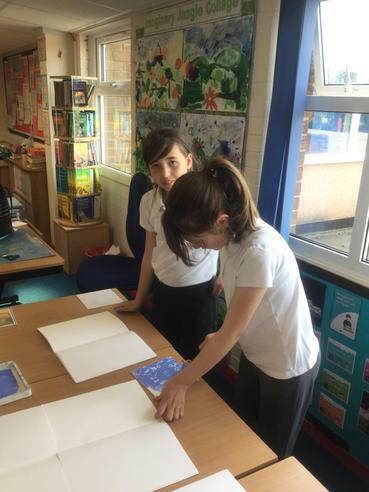 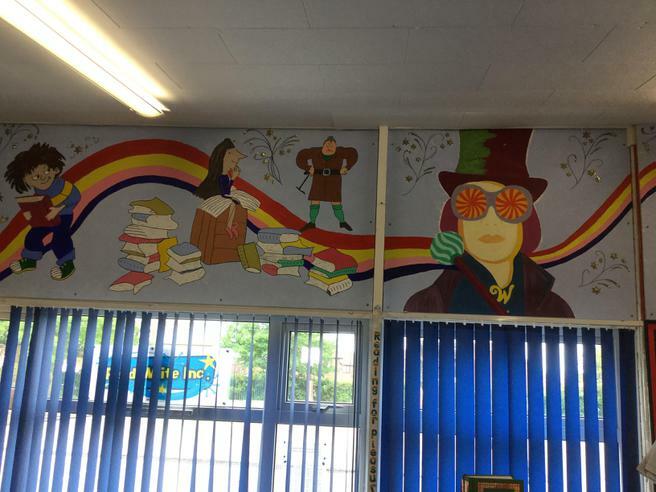 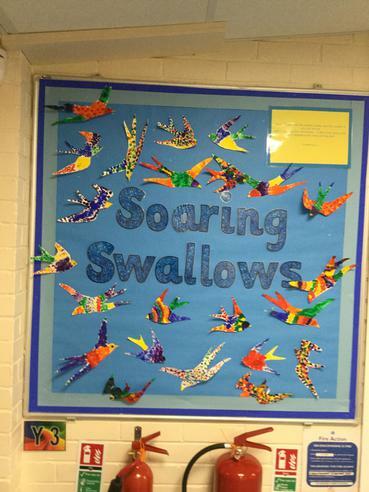 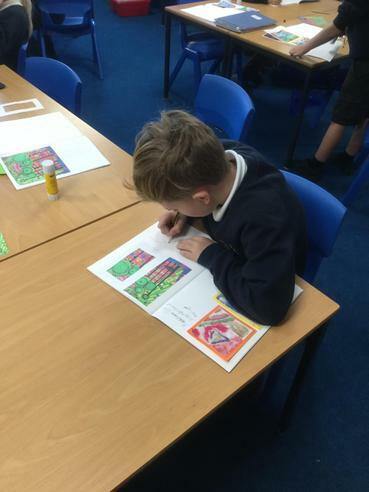 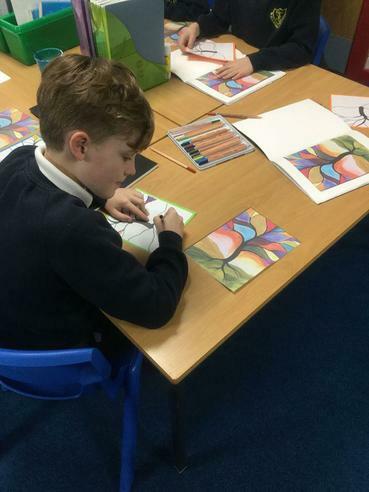 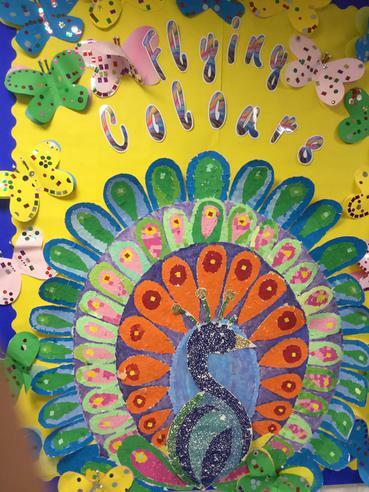 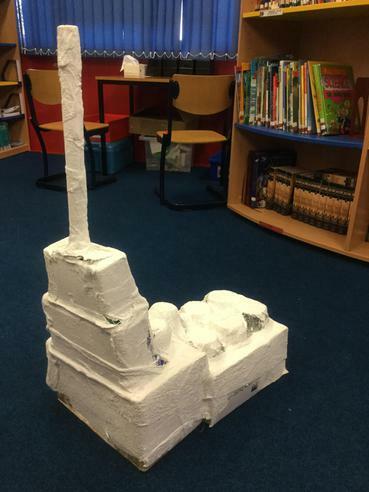 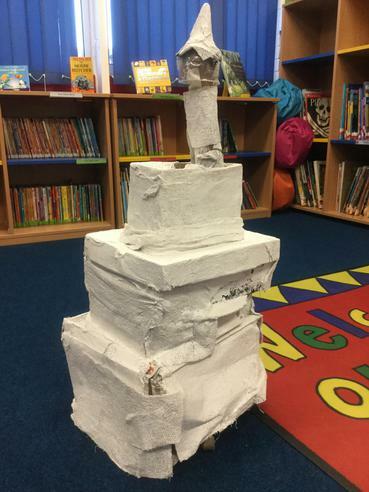 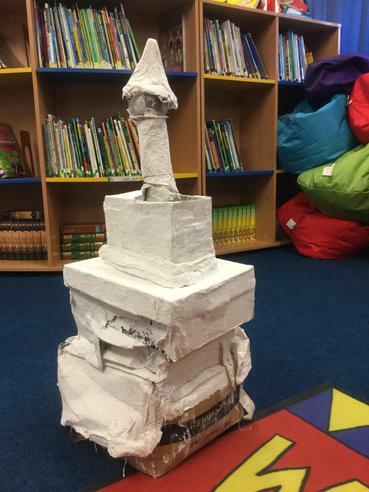 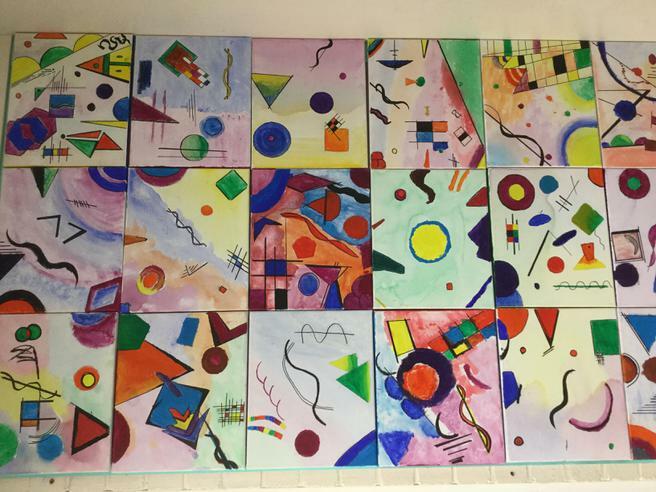 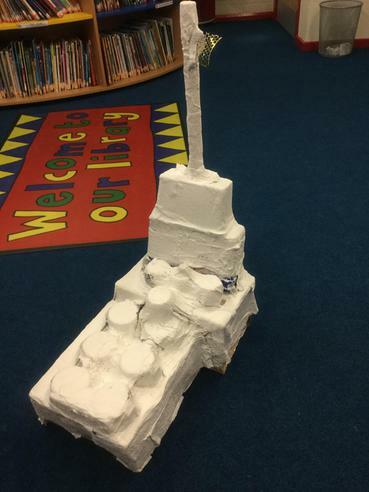 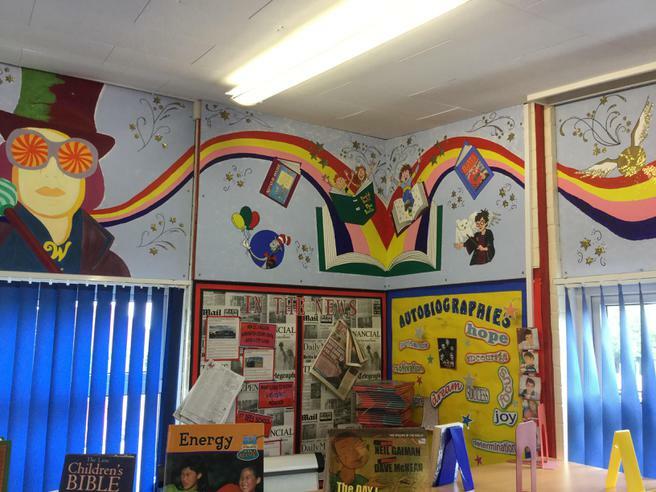 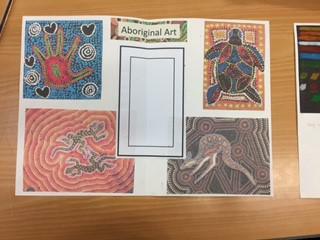 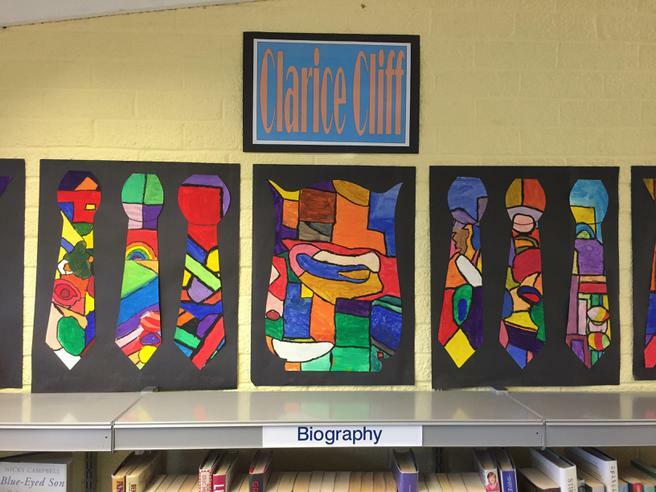 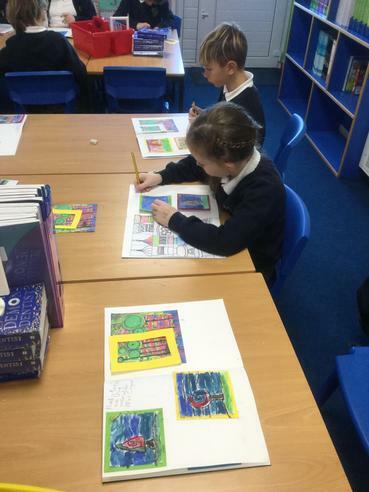 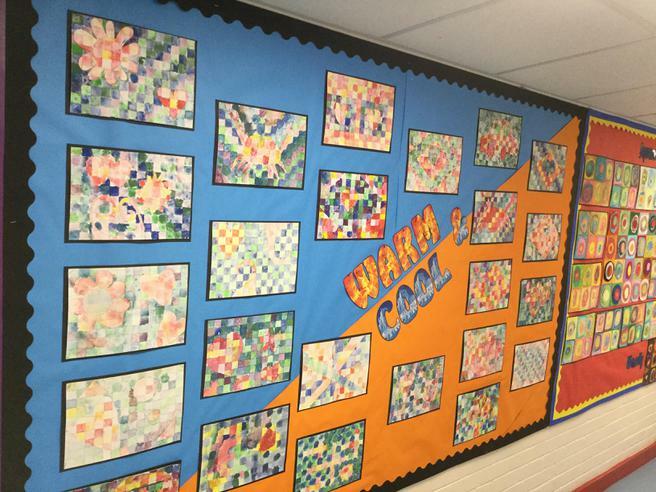 Year 5 Clarice Cliff work celebrated in Seaton Library. 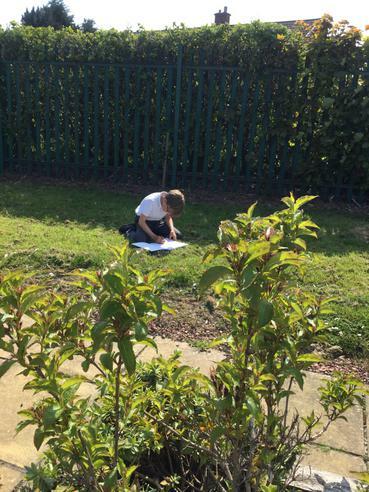 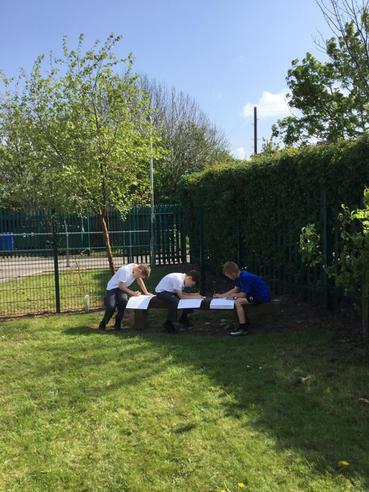 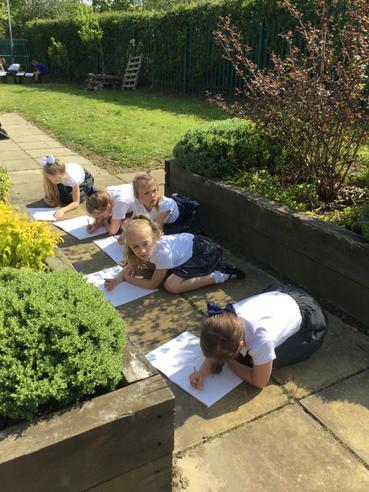 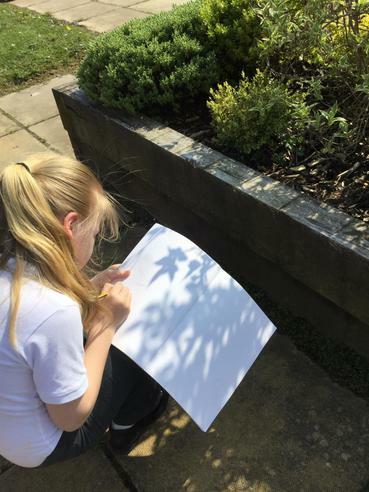 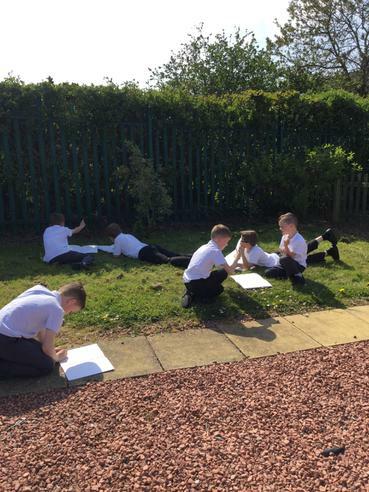 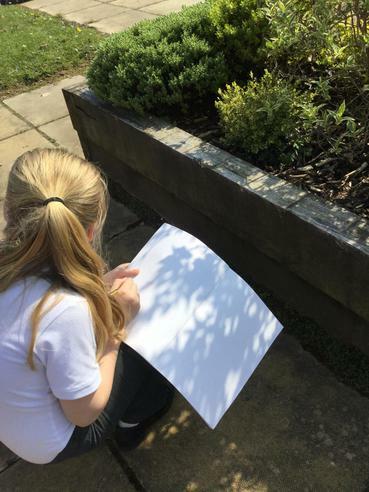 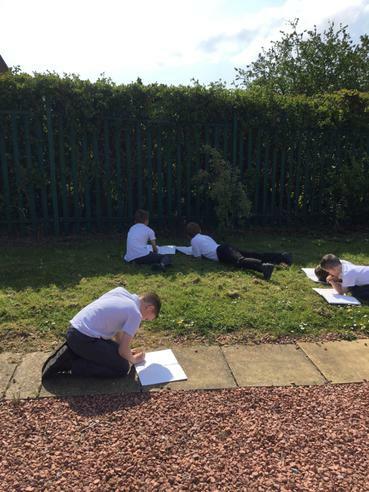 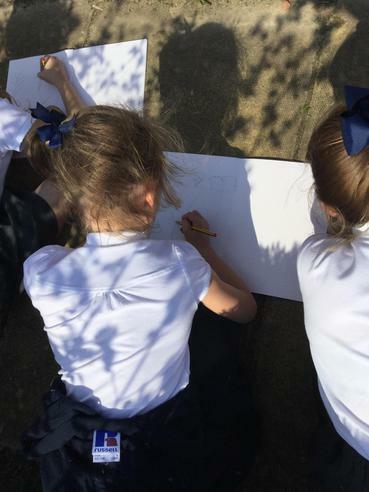 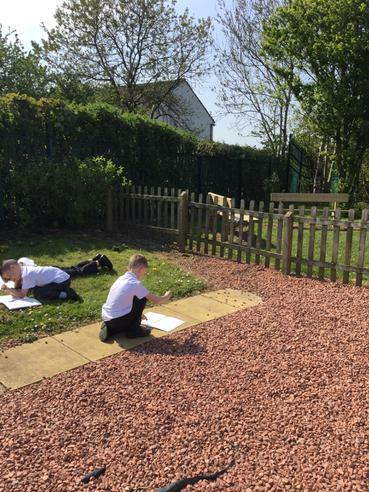 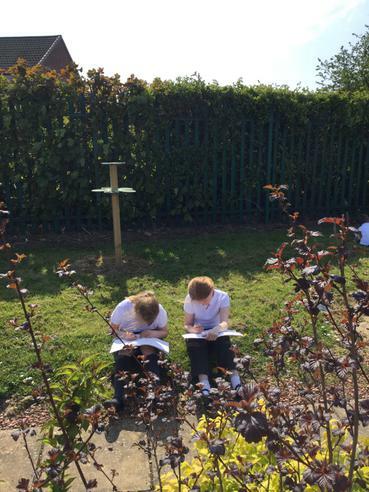 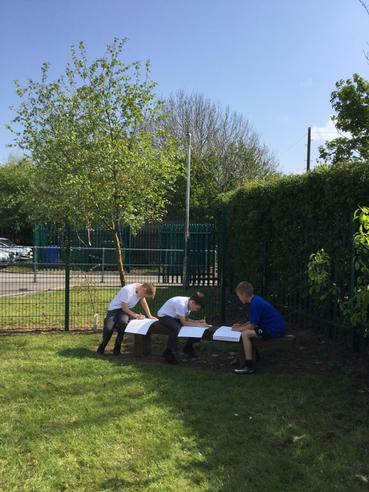 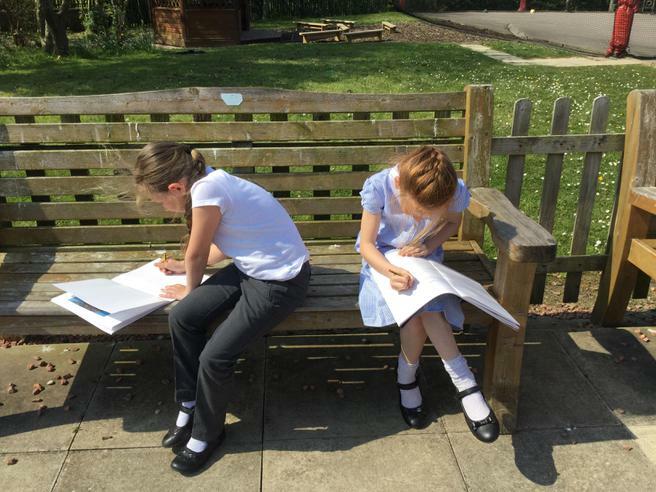 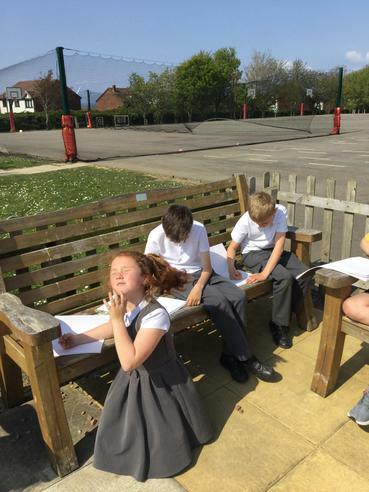 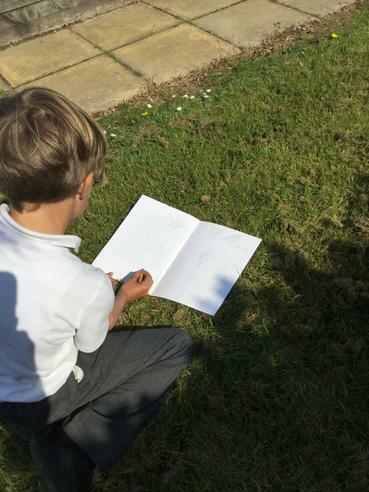 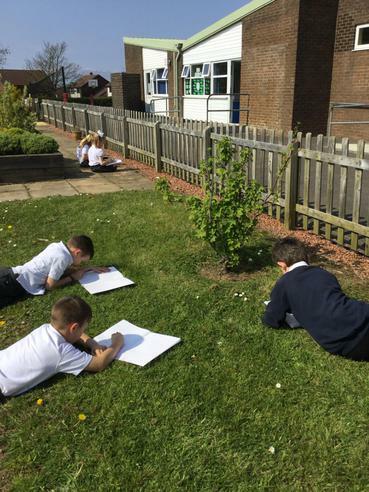 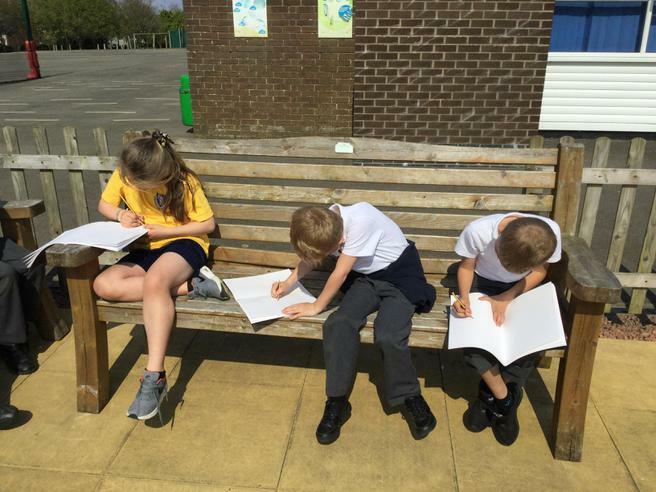 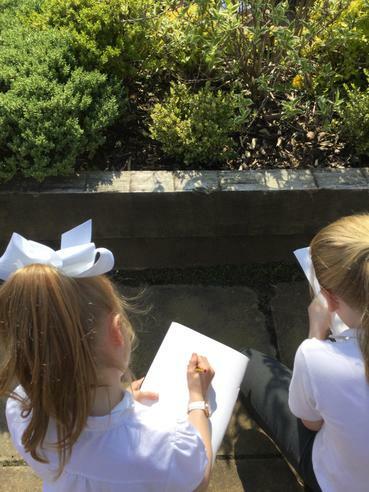 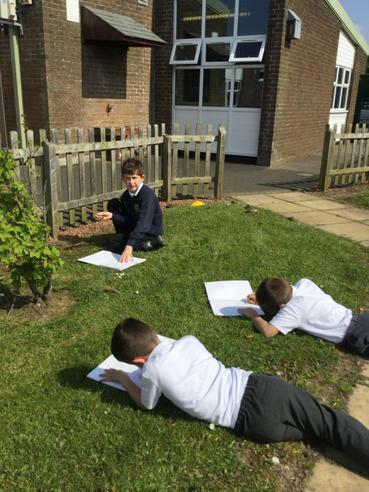 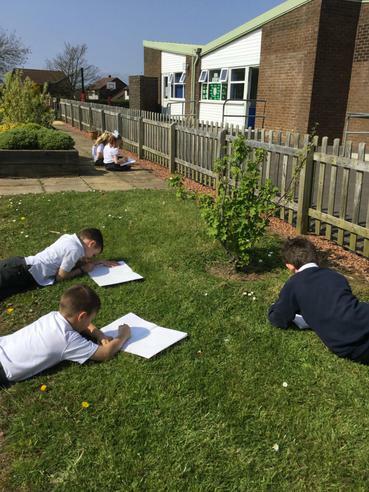 Year 4 sketching in our beautiful school grounds. 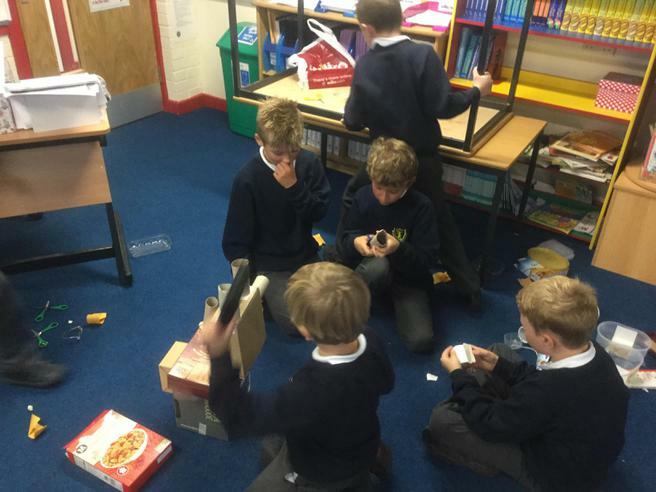 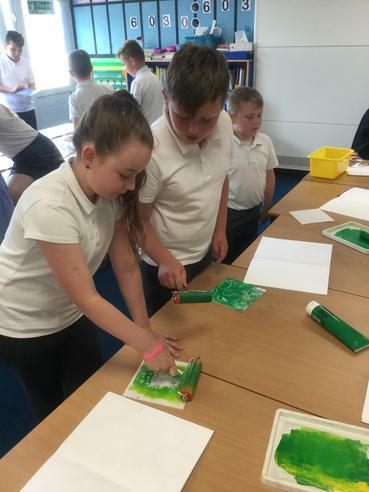 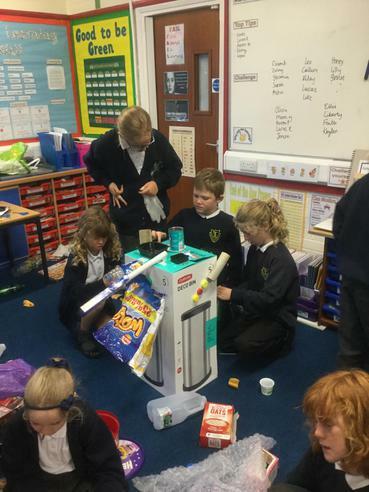 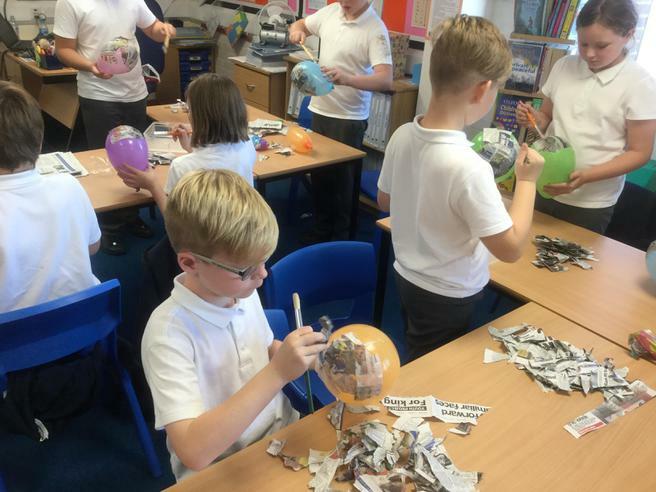 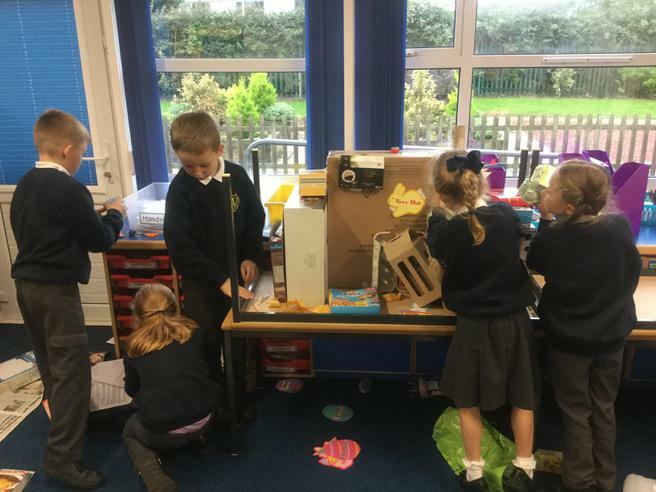 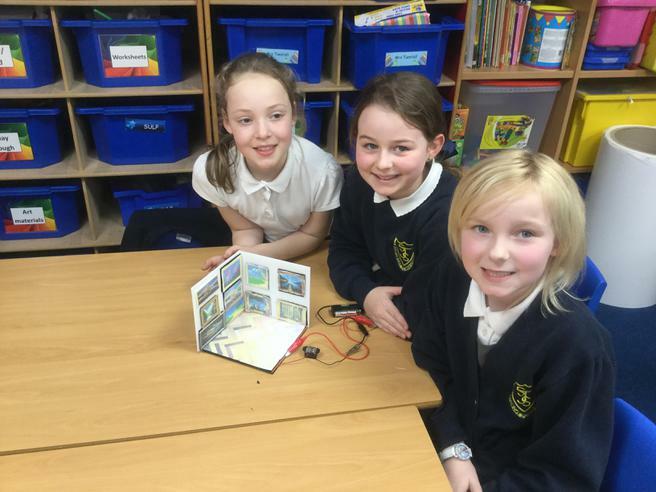 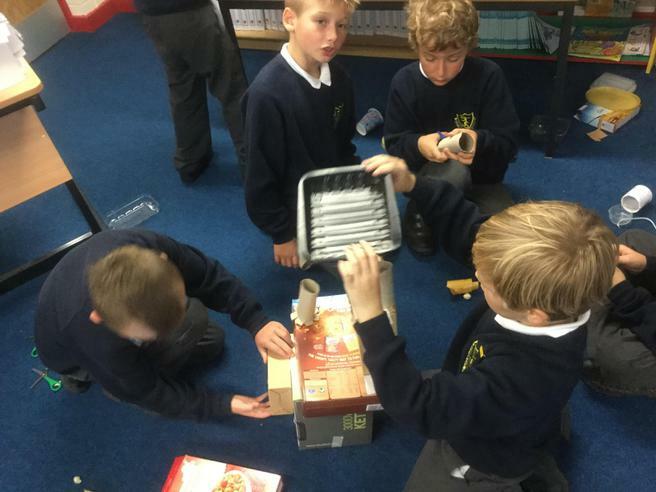 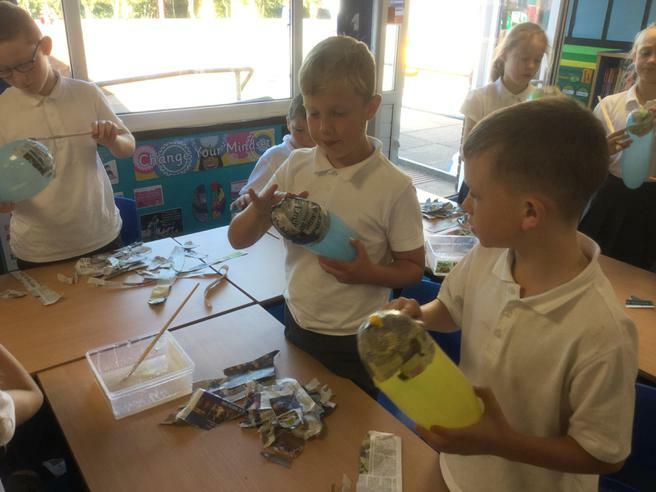 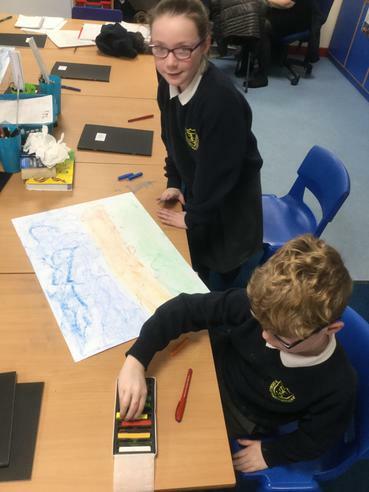 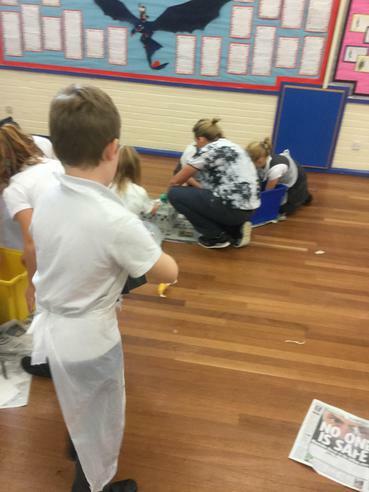 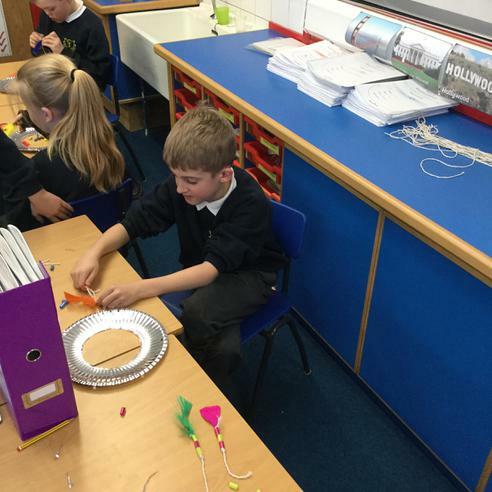 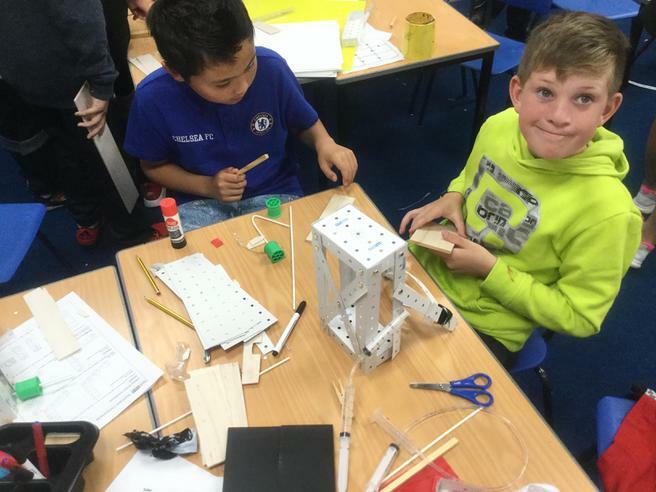 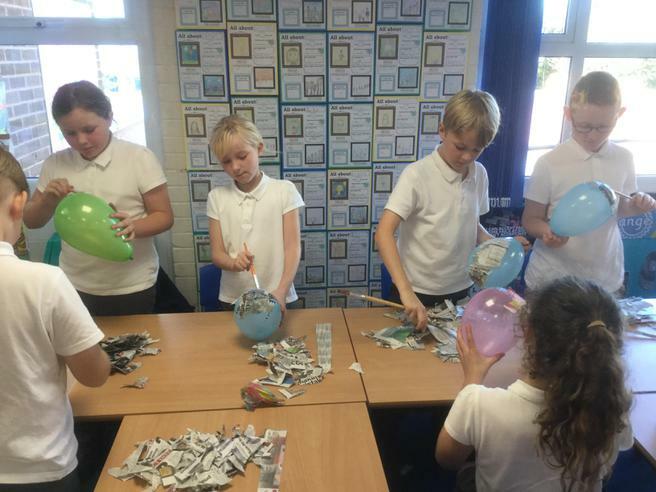 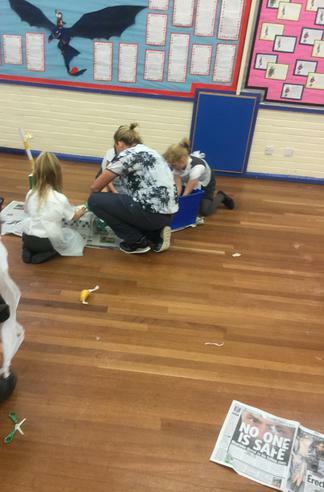 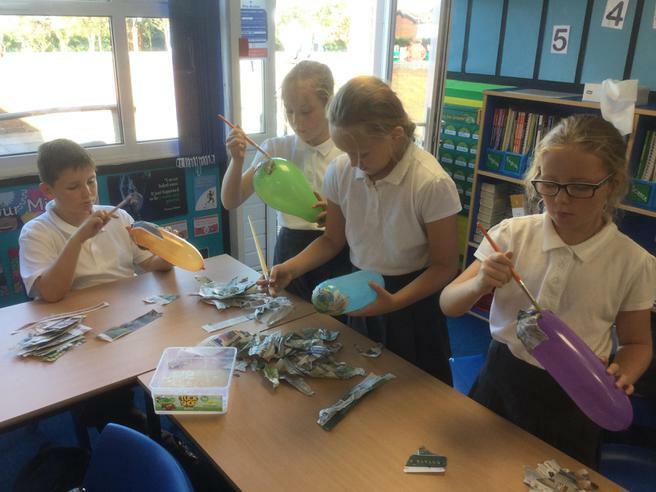 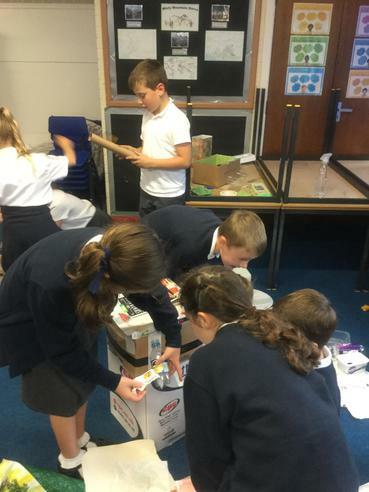 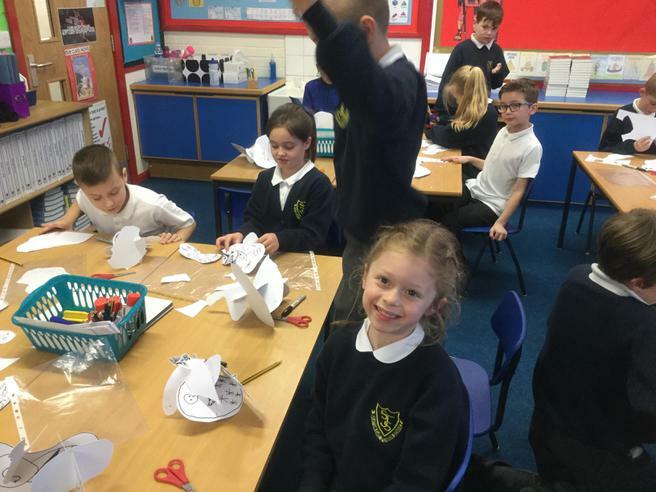 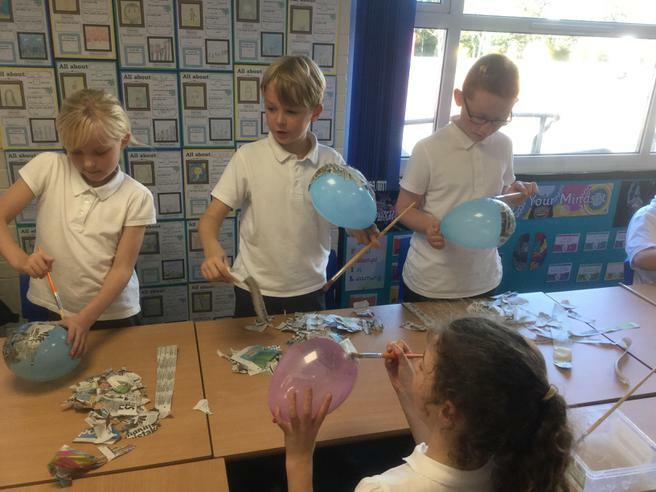 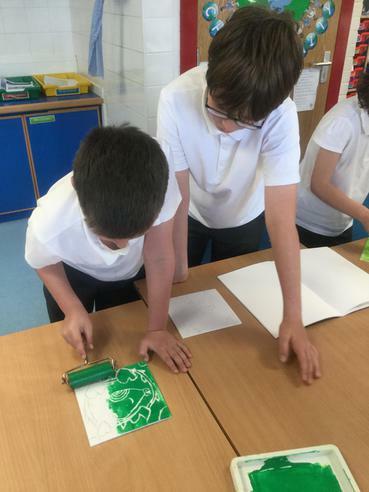 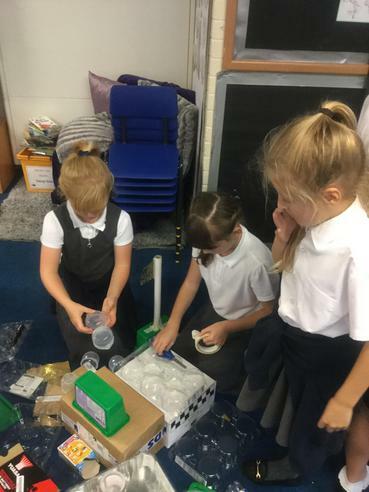 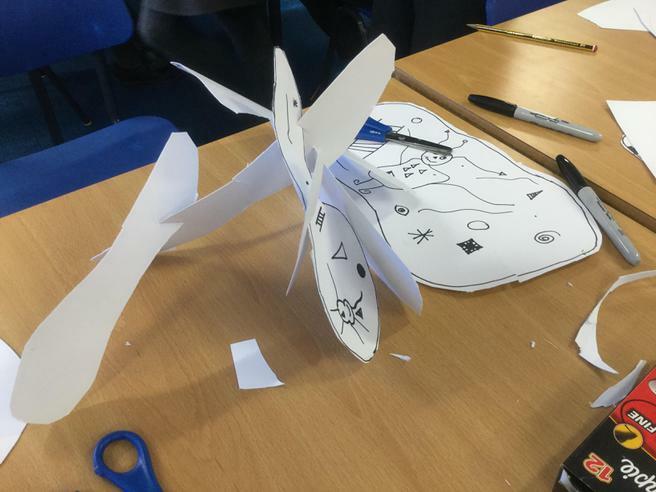 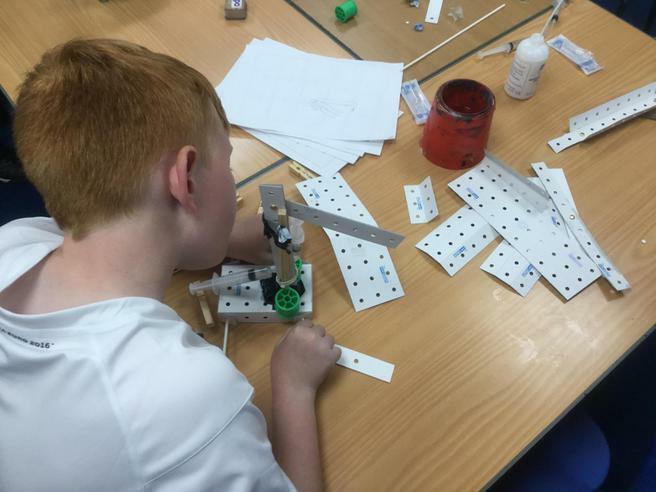 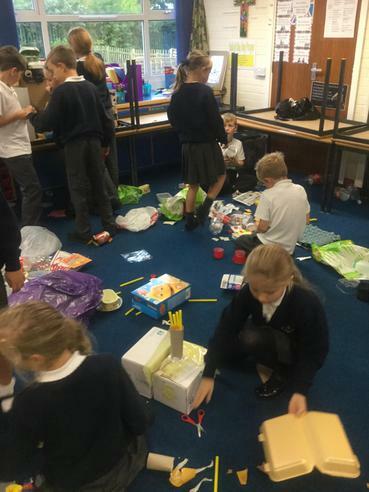 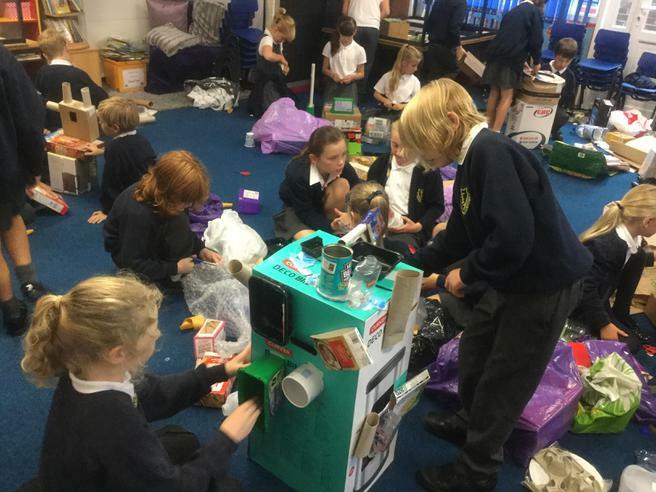 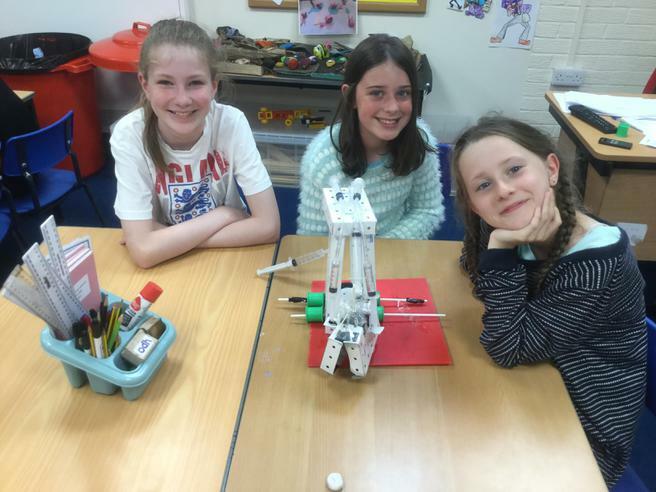 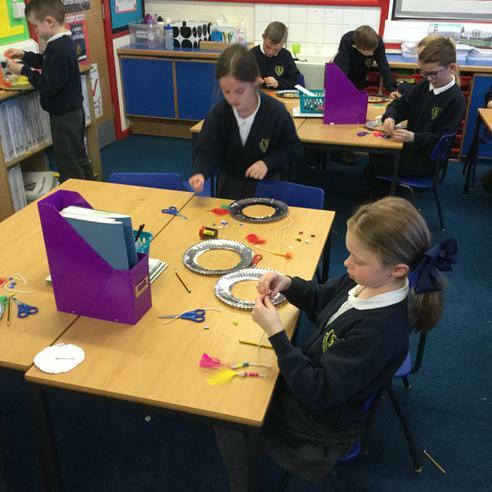 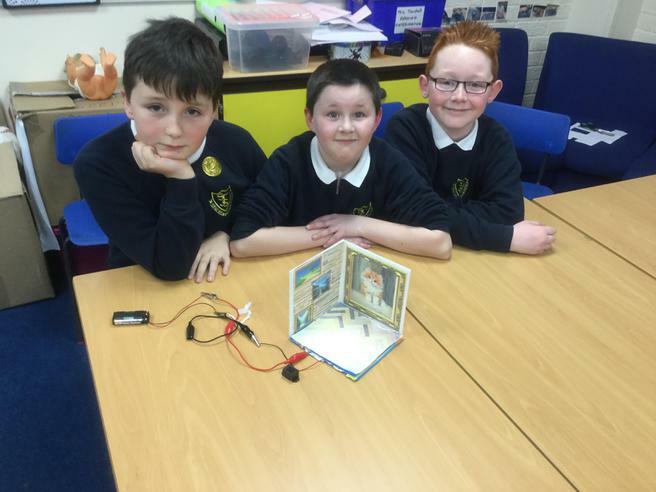 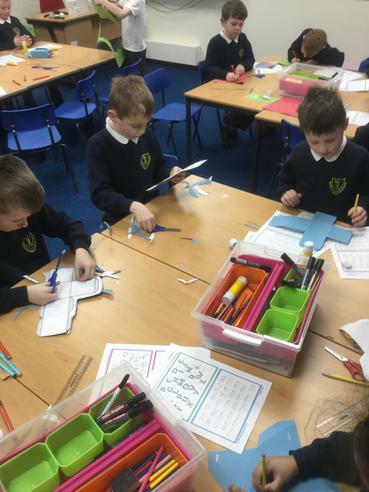 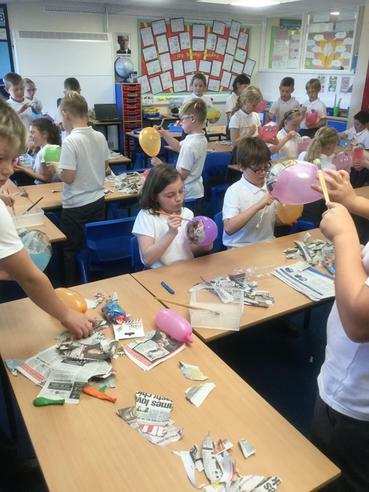 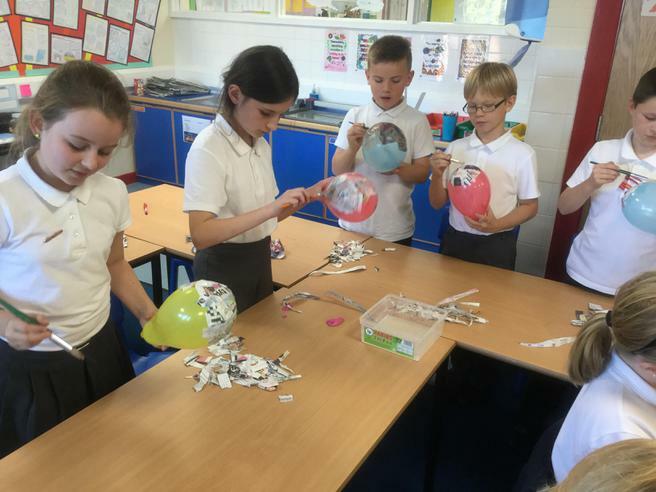 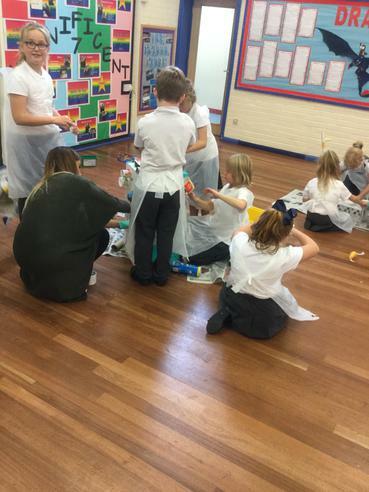 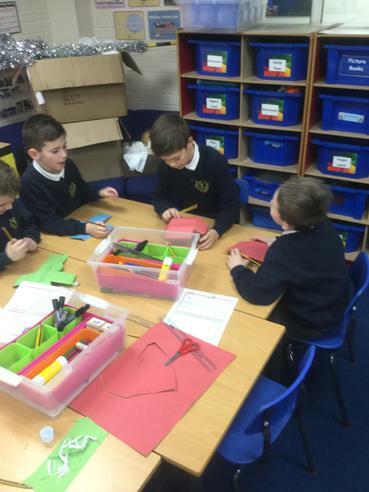 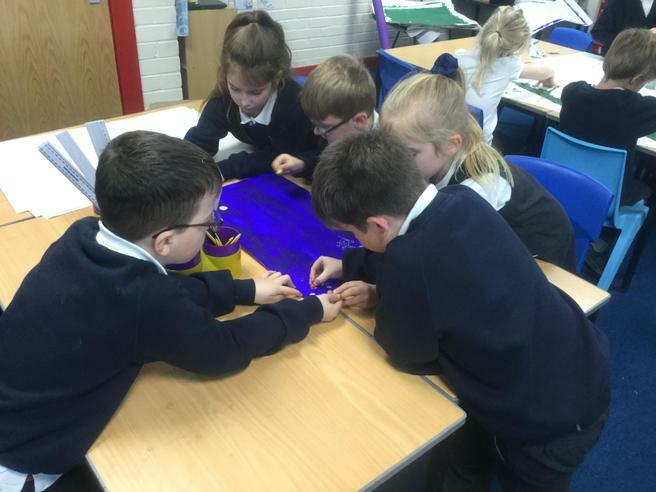 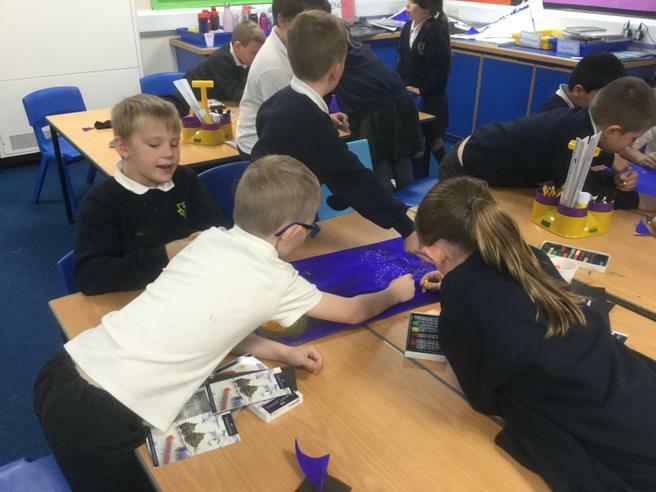 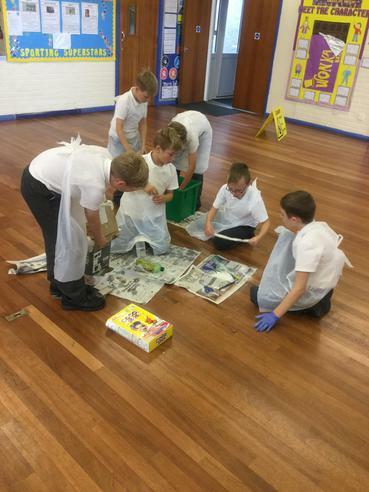 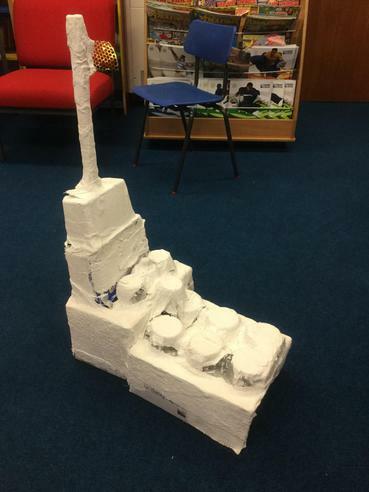 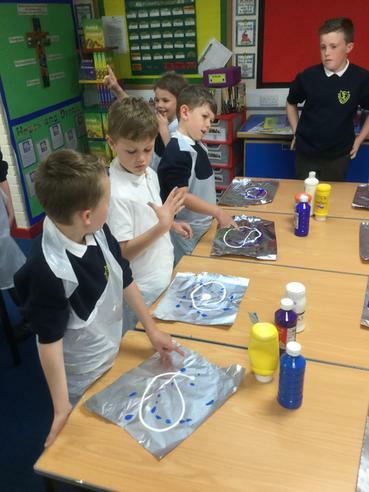 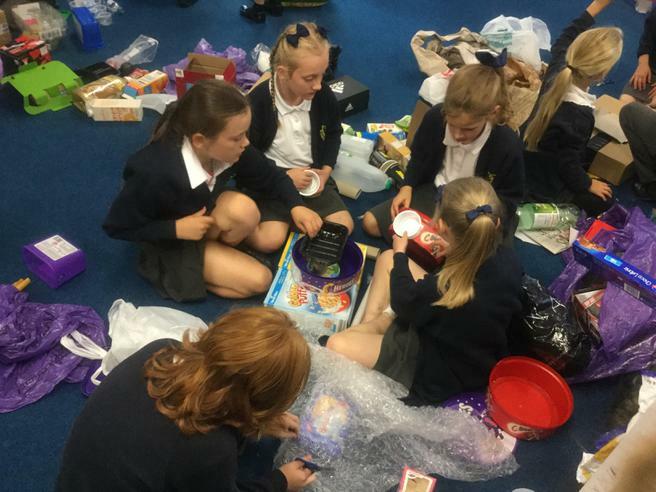 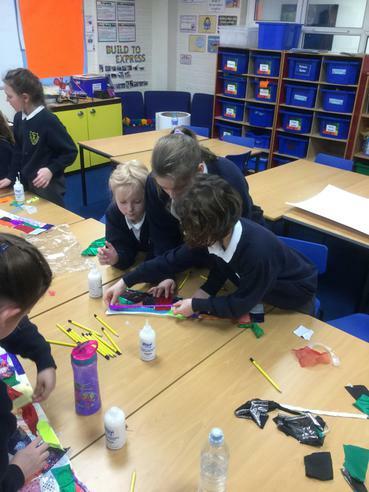 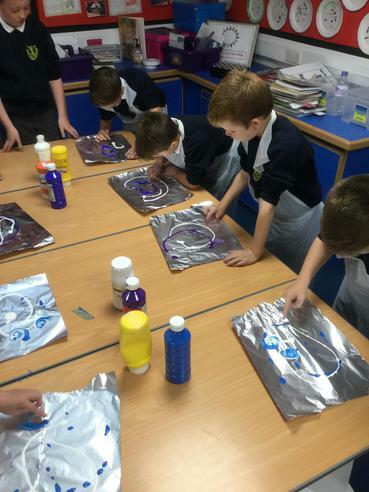 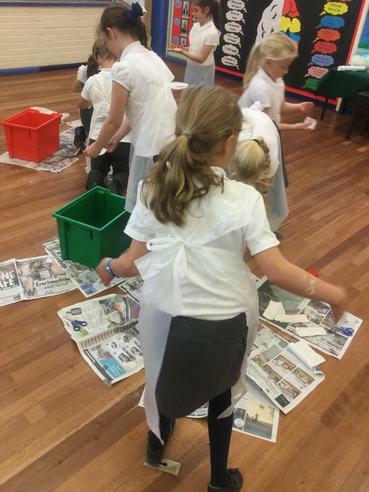 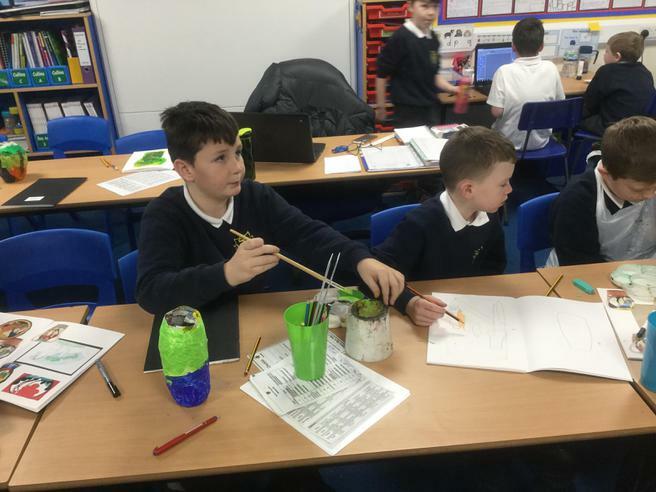 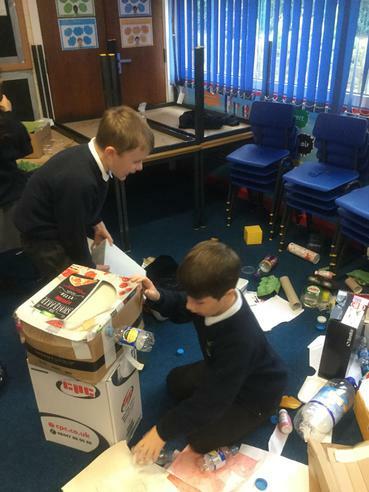 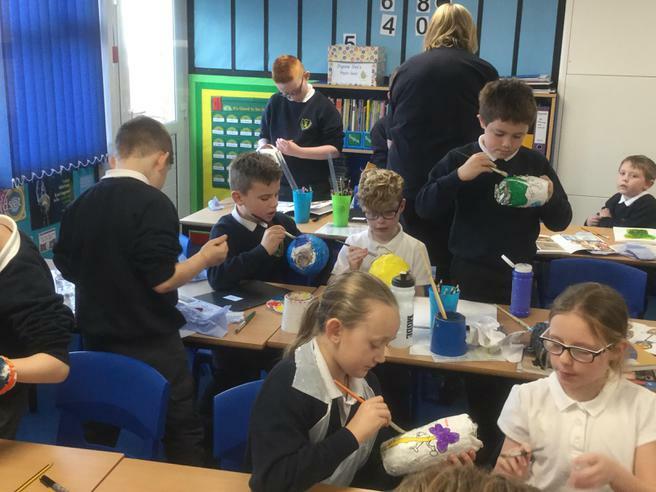 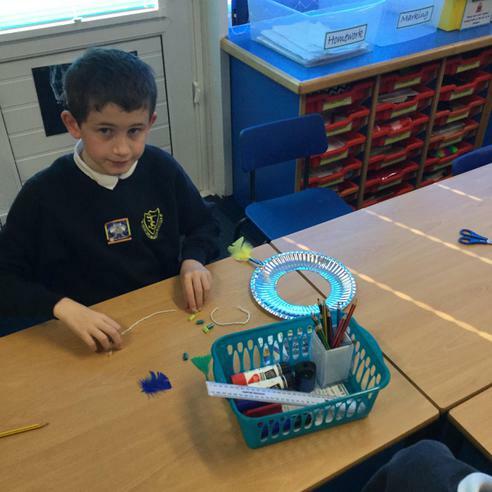 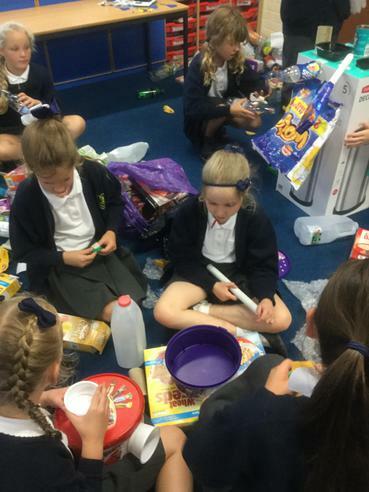 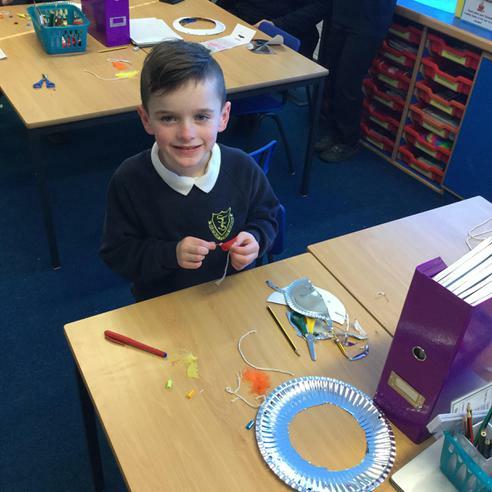 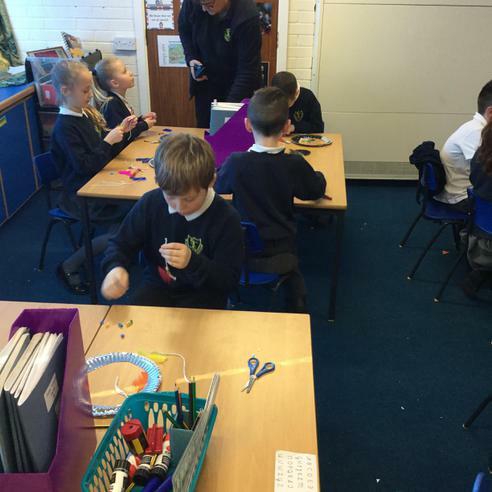 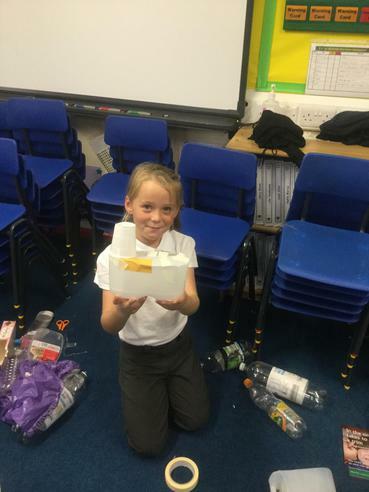 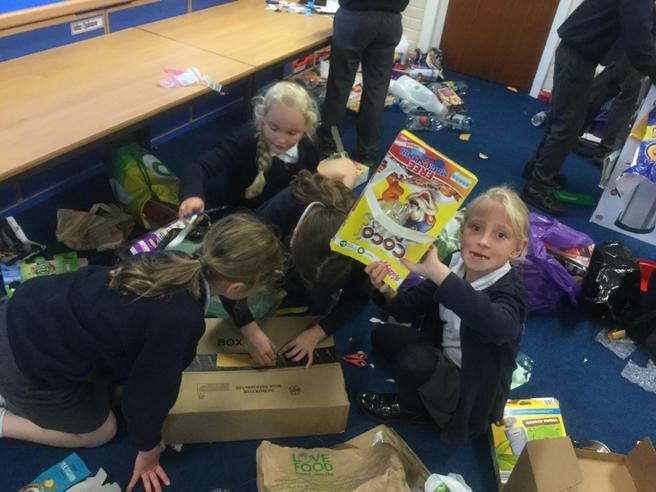 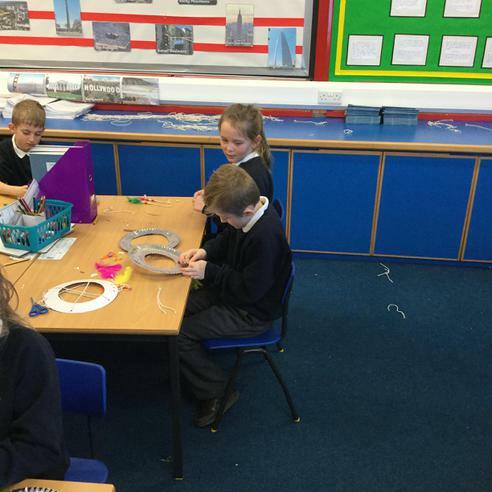 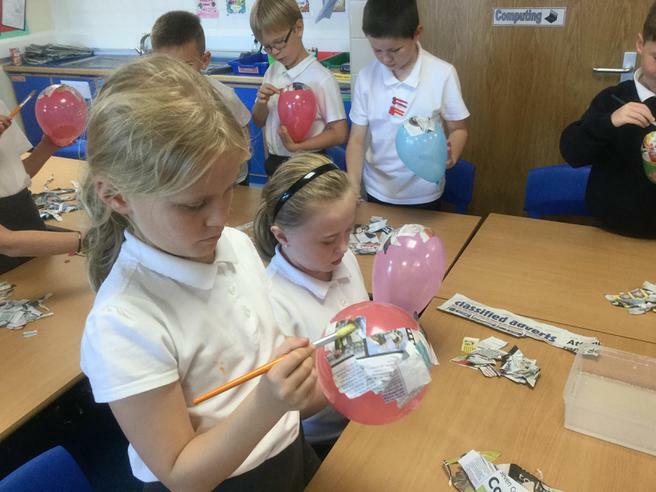 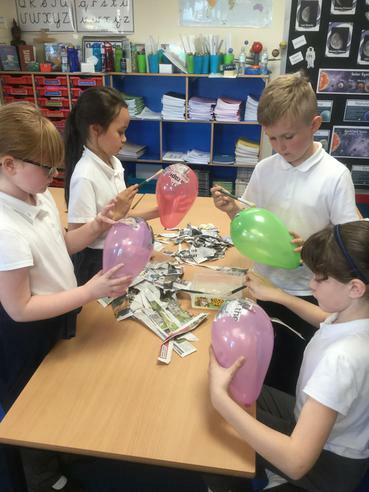 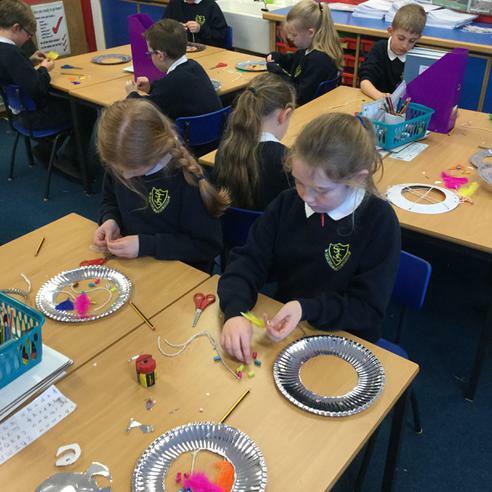 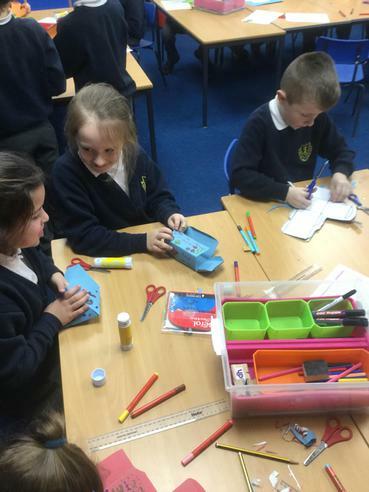 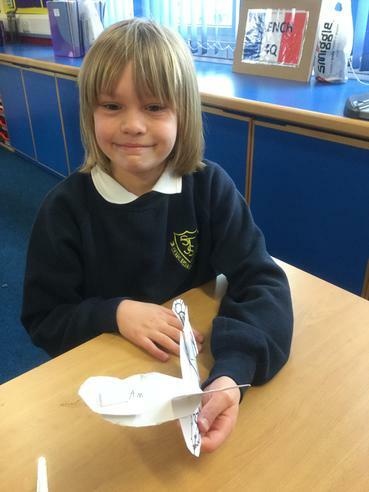 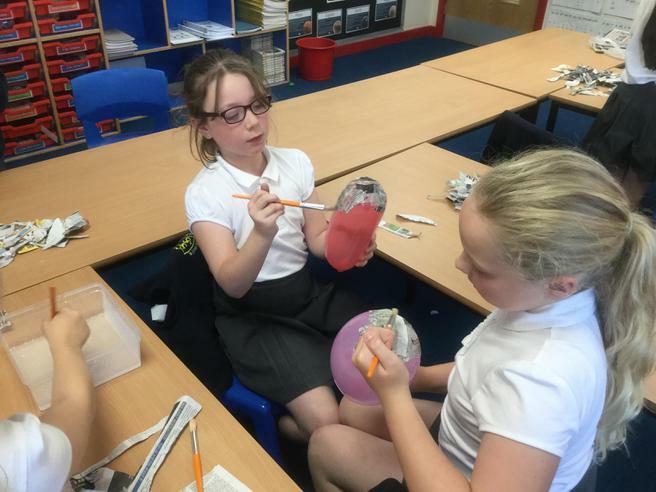 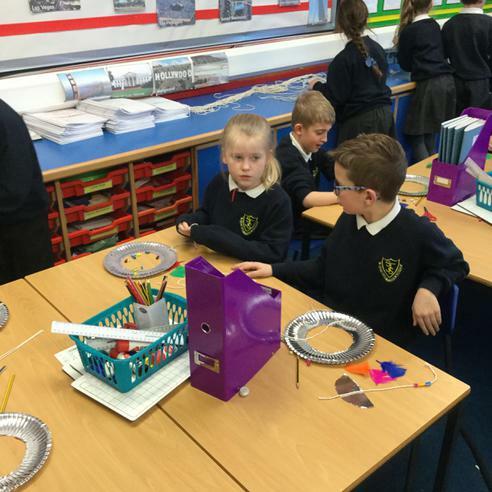 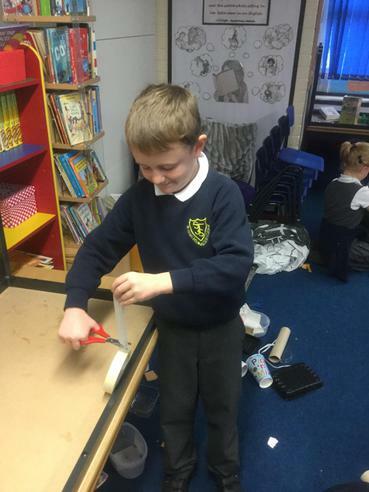 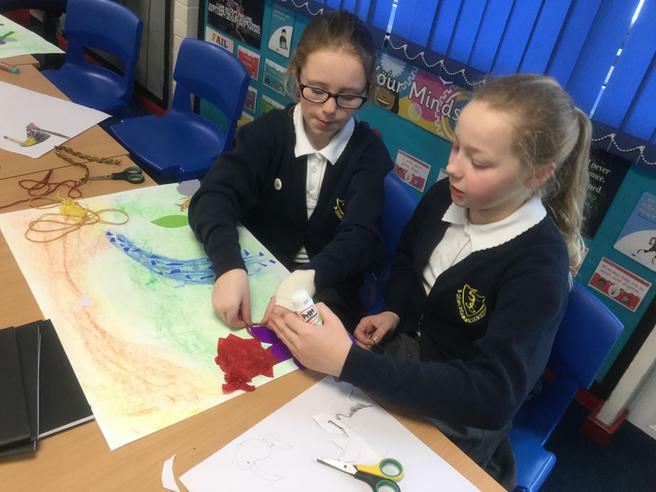 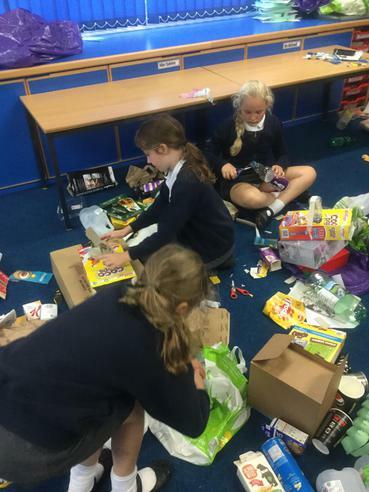 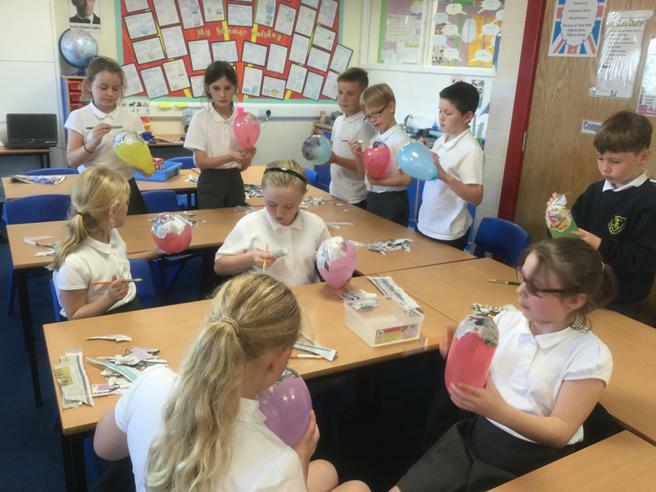 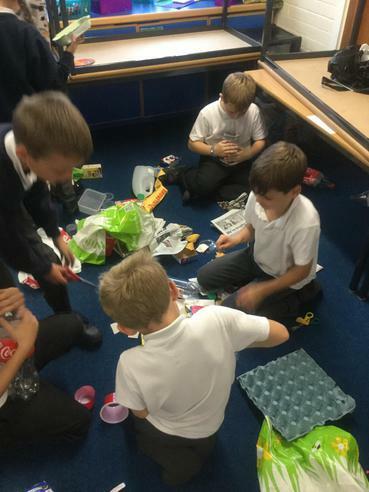 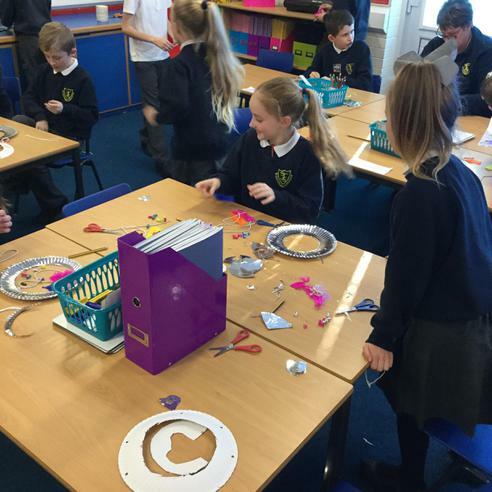 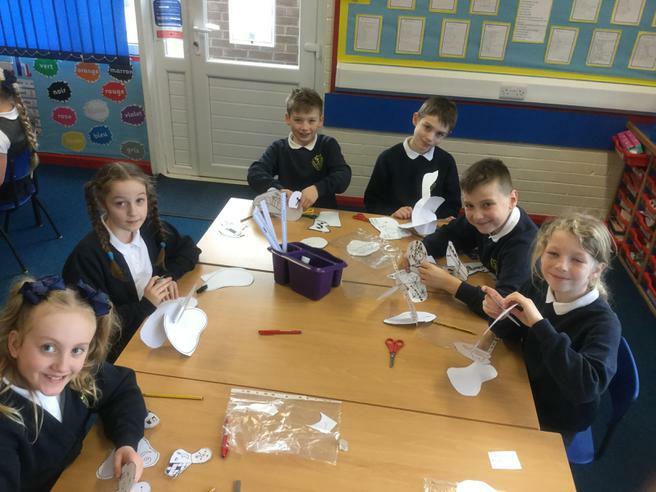 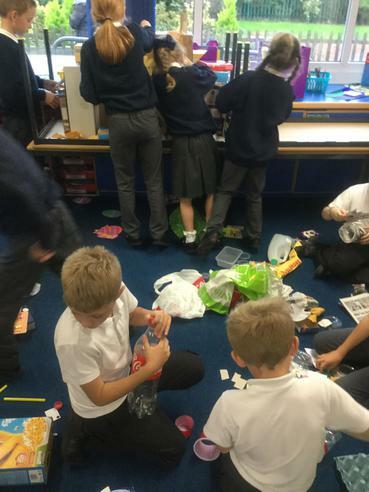 Year 6 Creating an hydraulic arm. 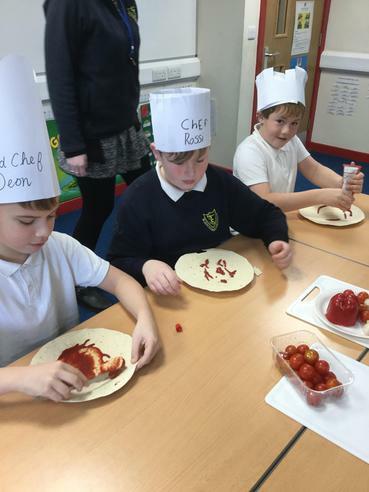 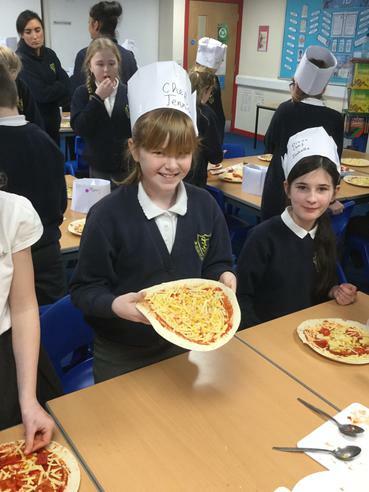 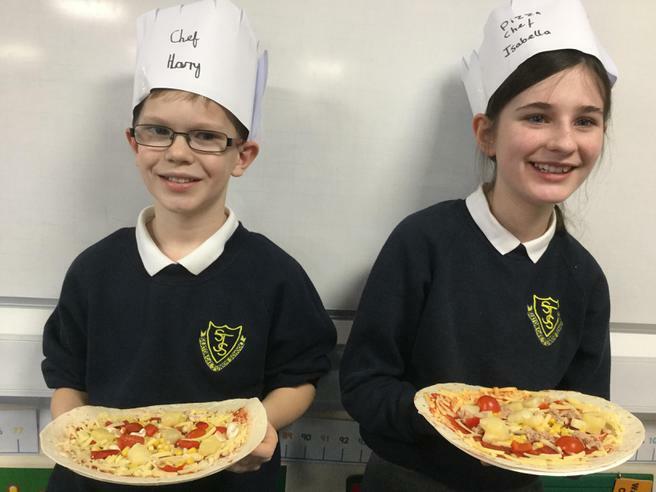 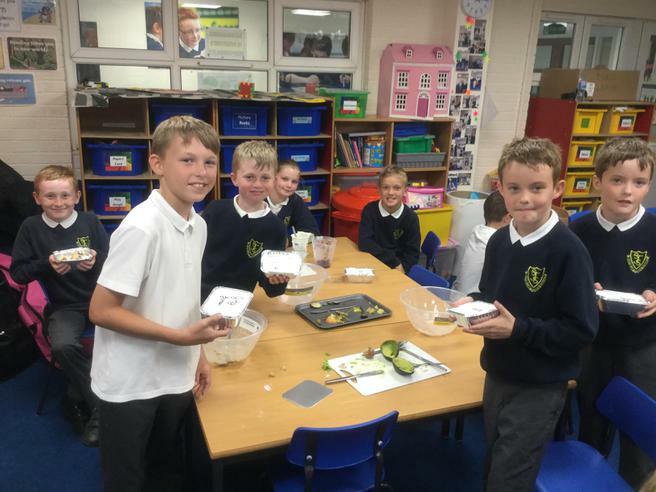 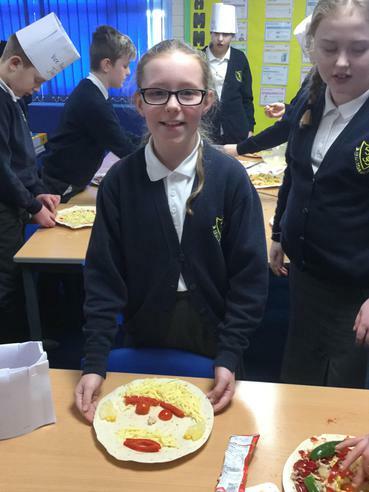 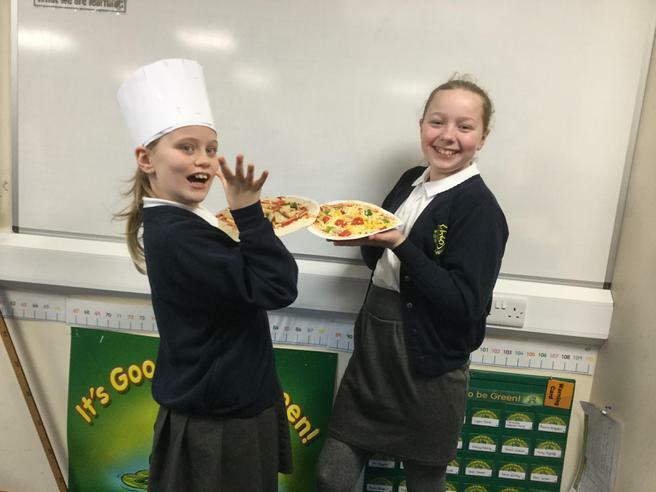 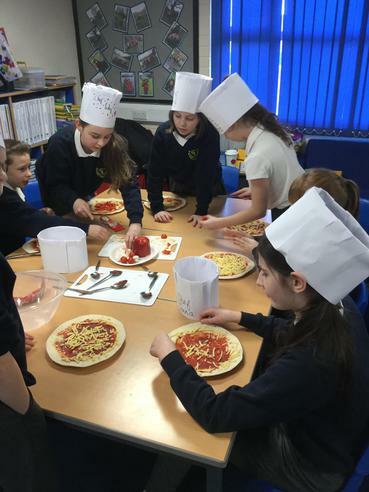 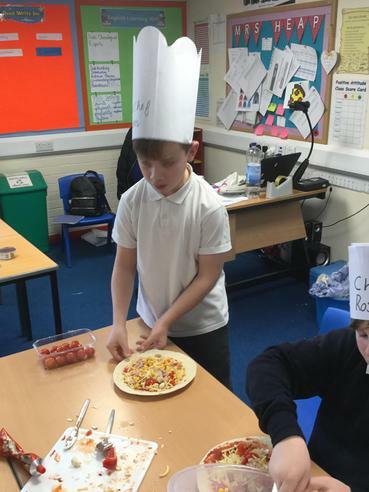 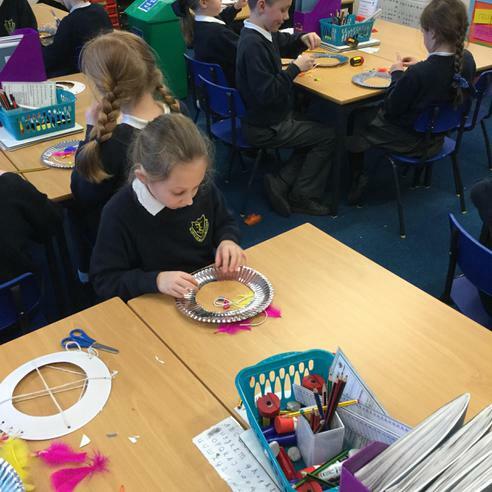 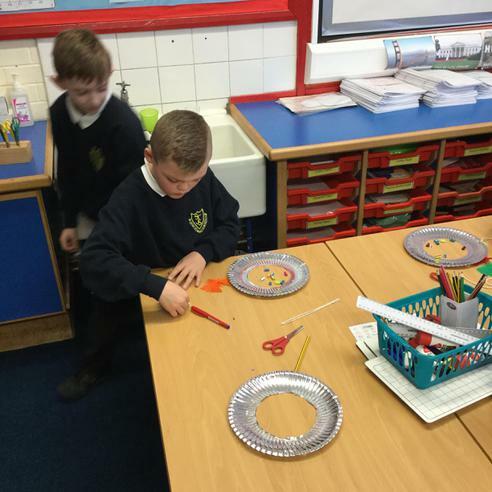 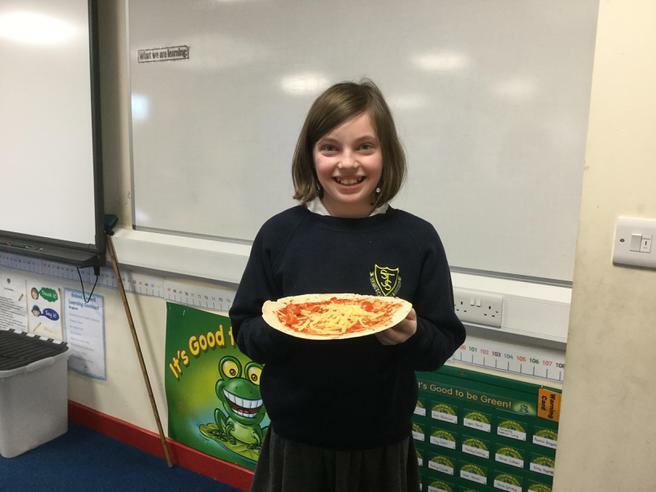 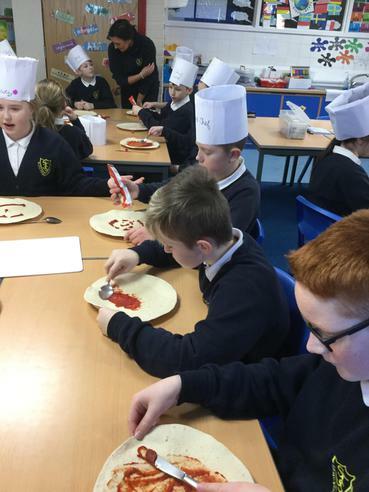 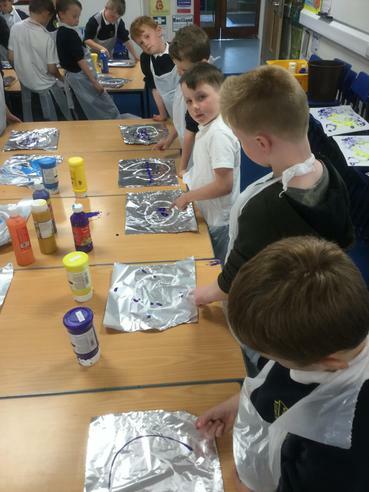 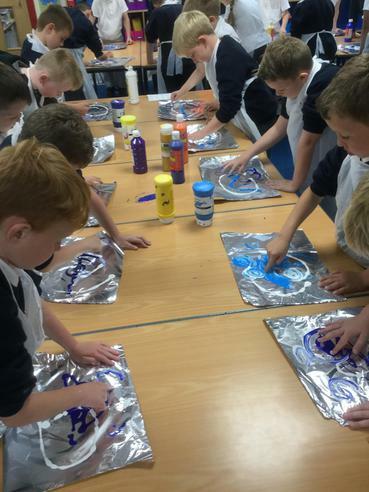 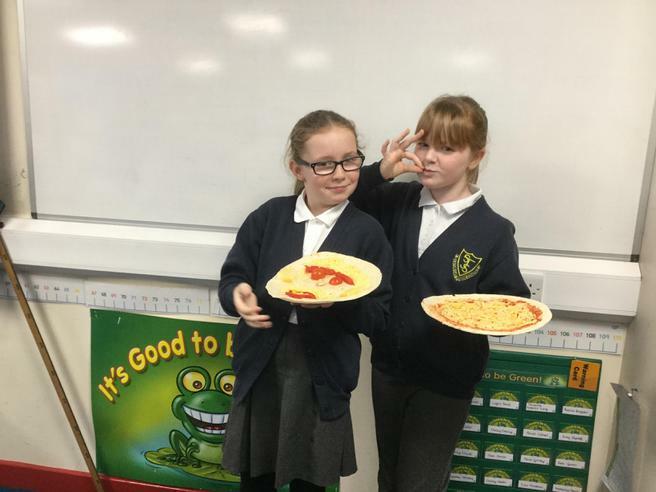 Year 6 making delicious pizza in Food Technology. 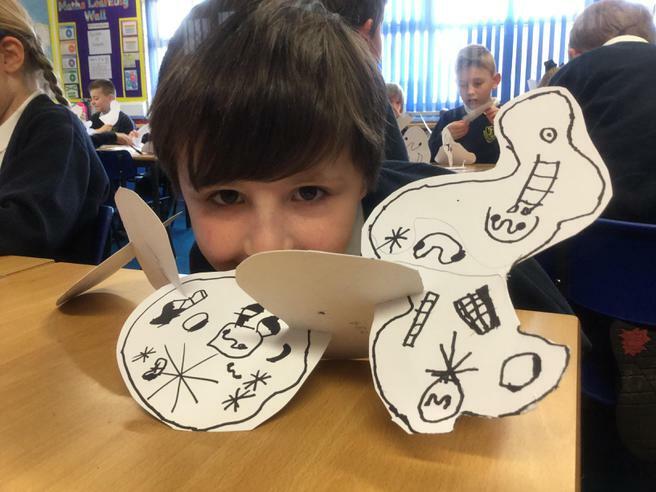 Rudolph needs his nose to light up and tail to spin. 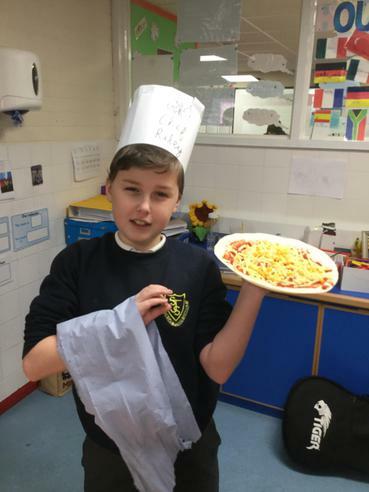 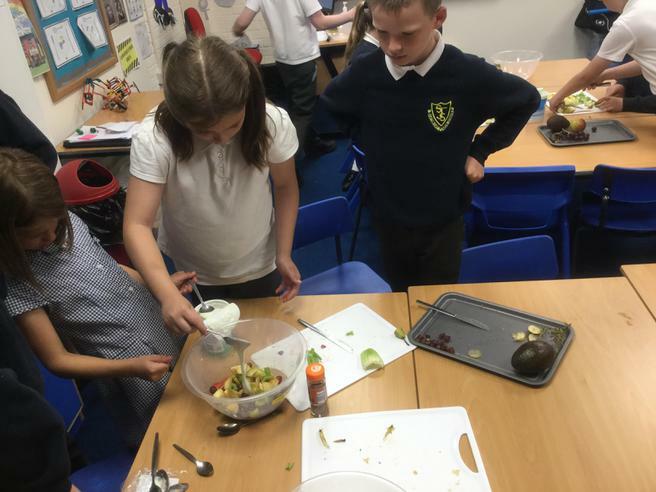 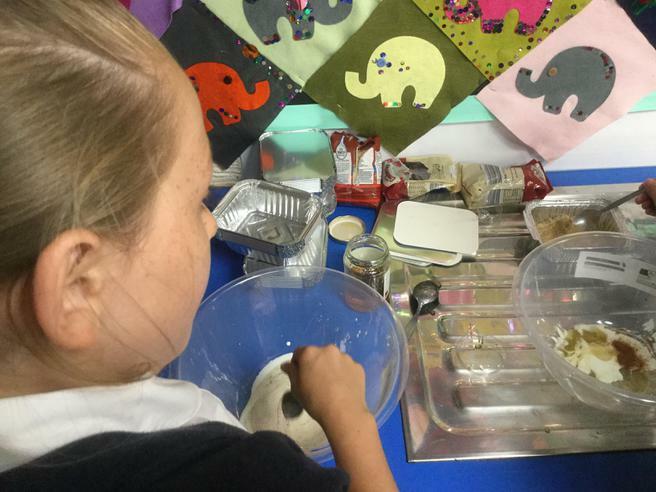 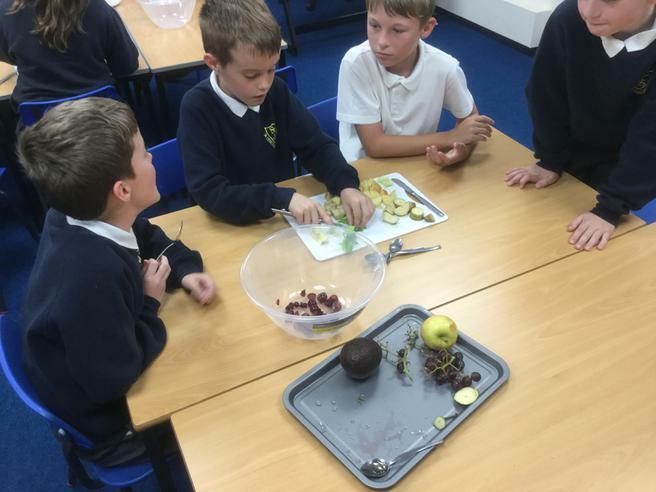 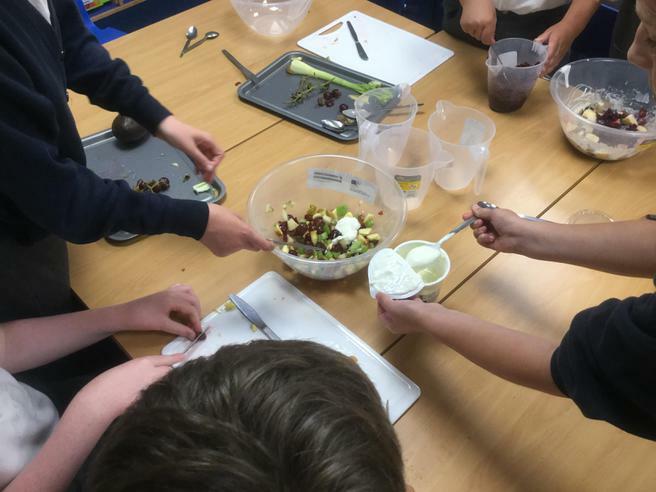 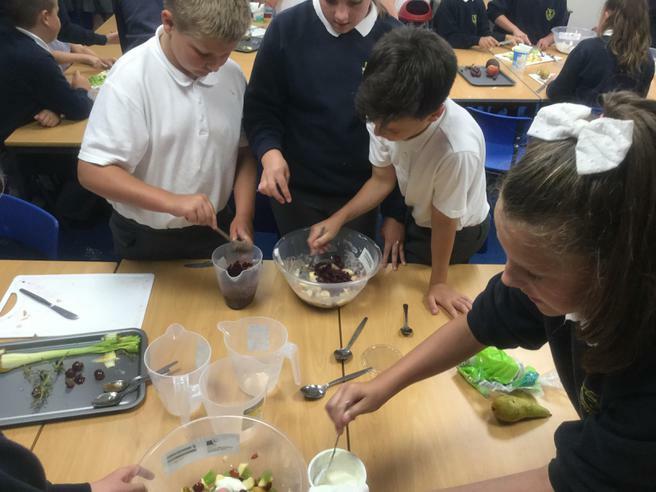 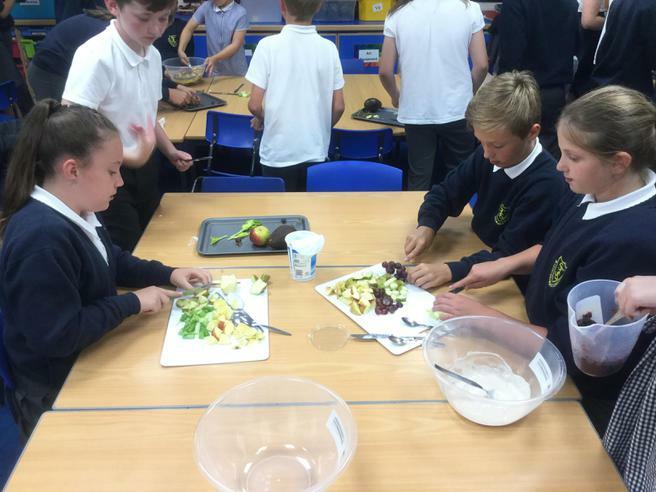 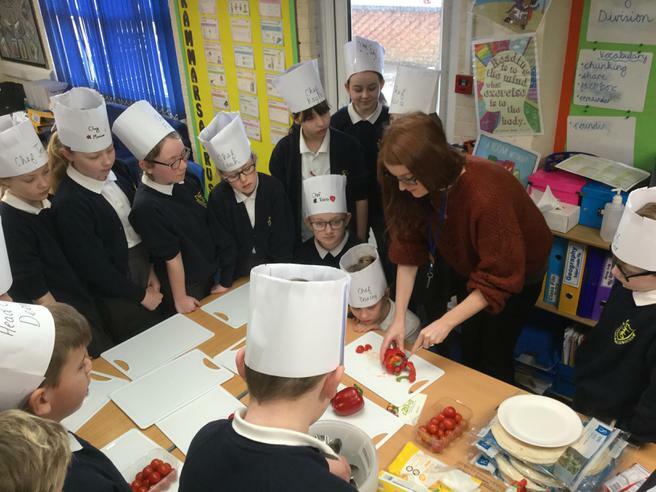 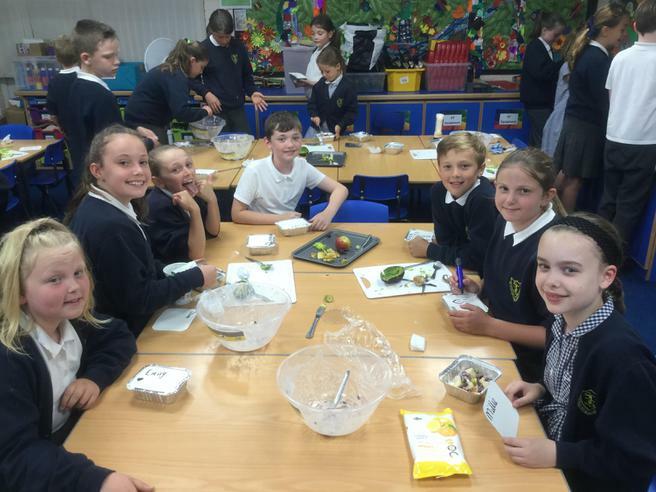 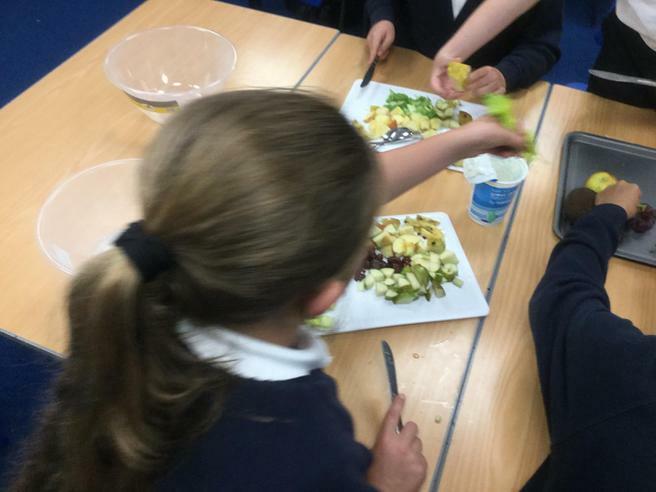 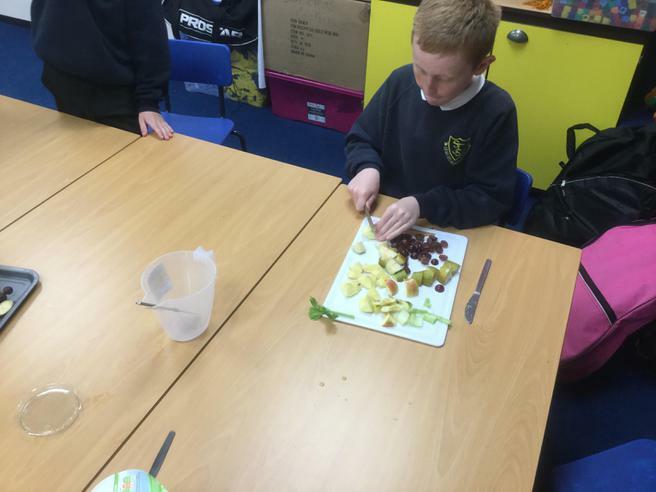 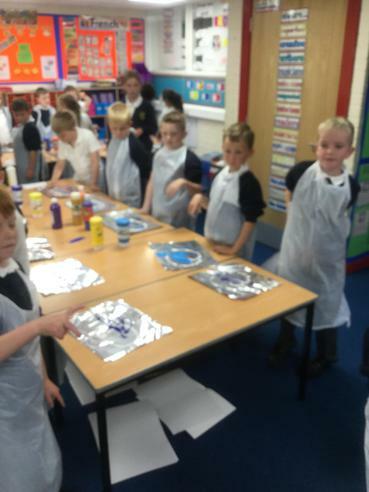 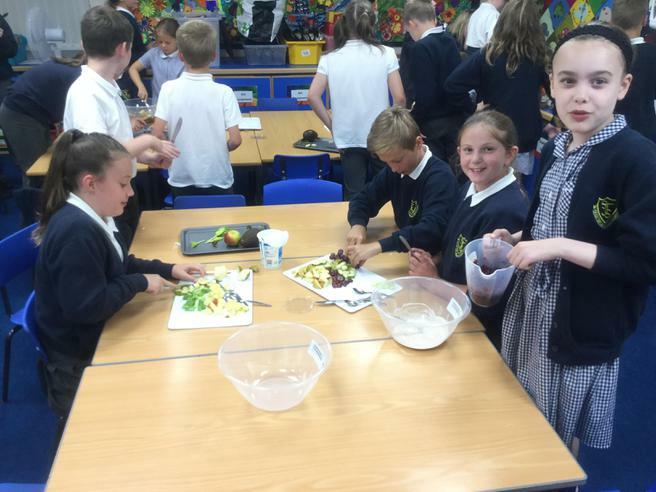 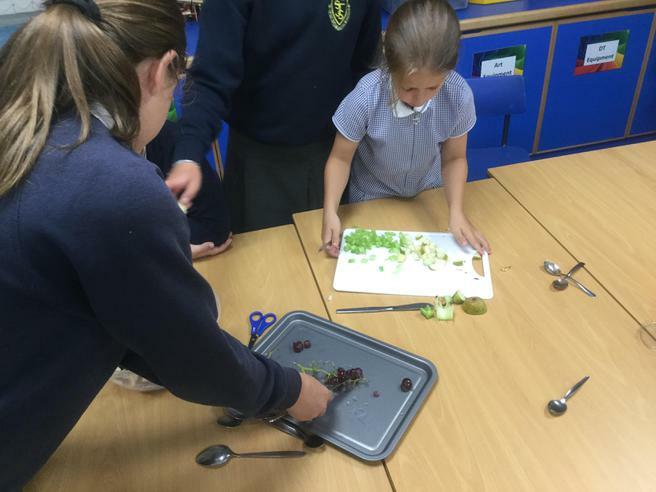 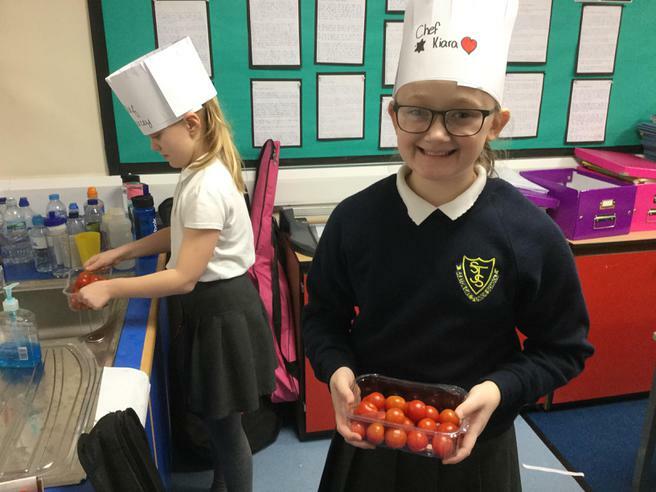 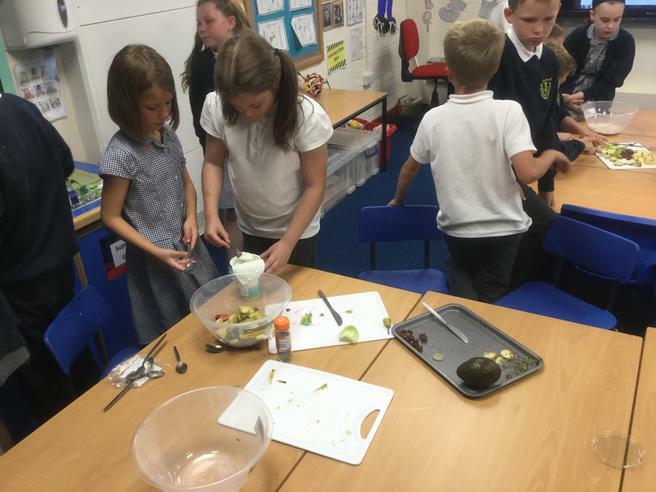 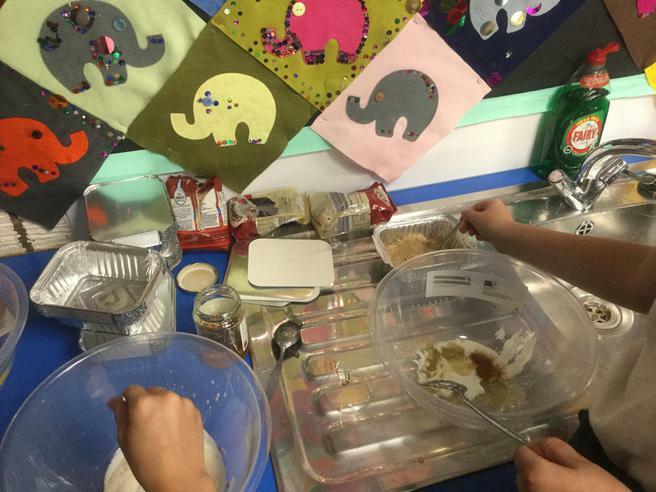 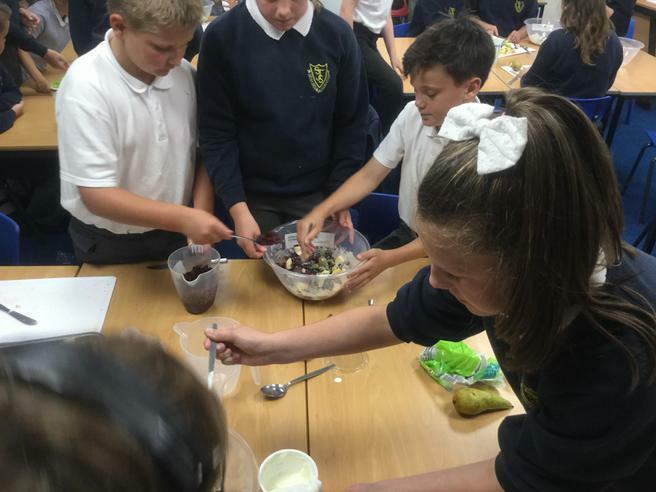 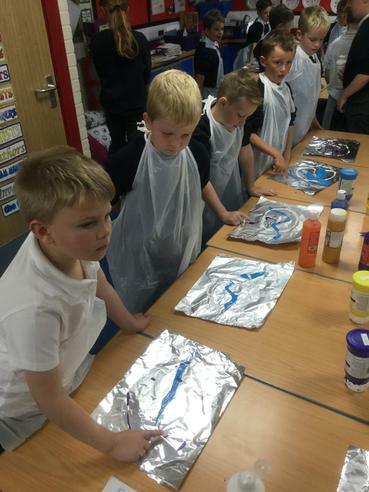 Food Technology- making healthy lasagne.